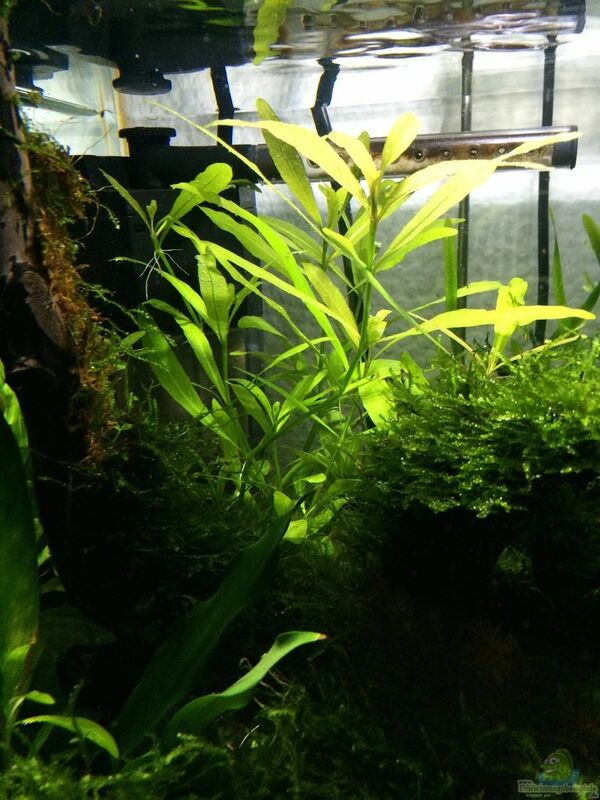 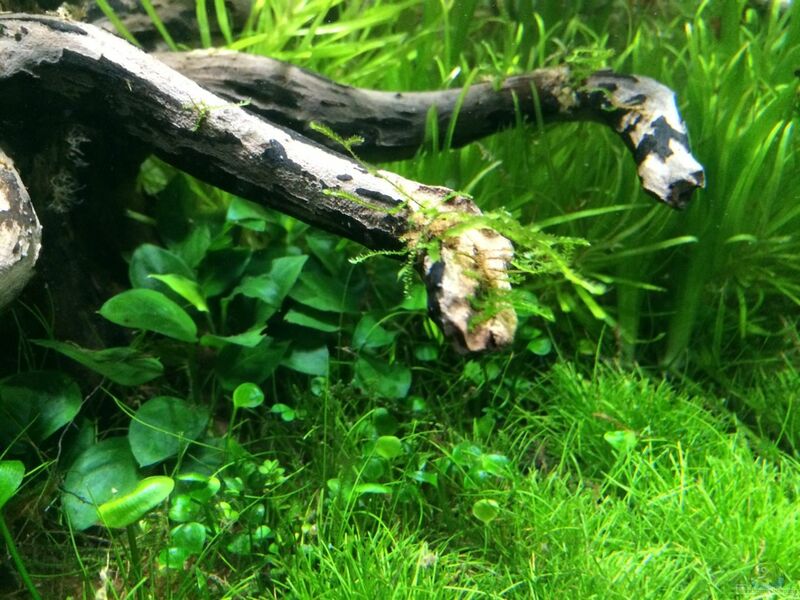 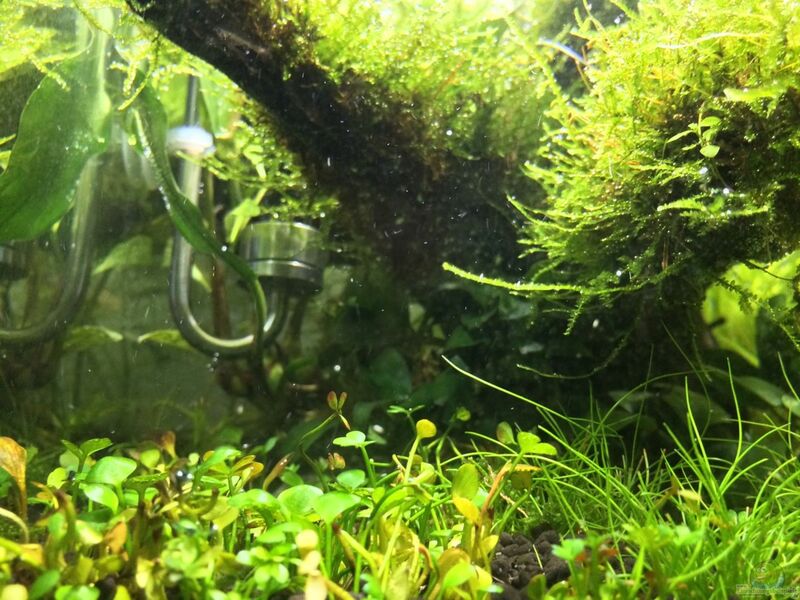 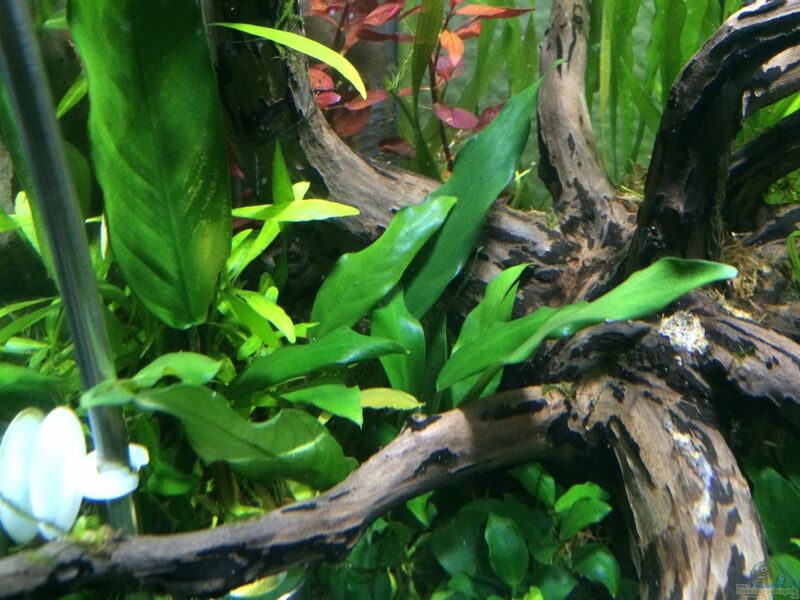 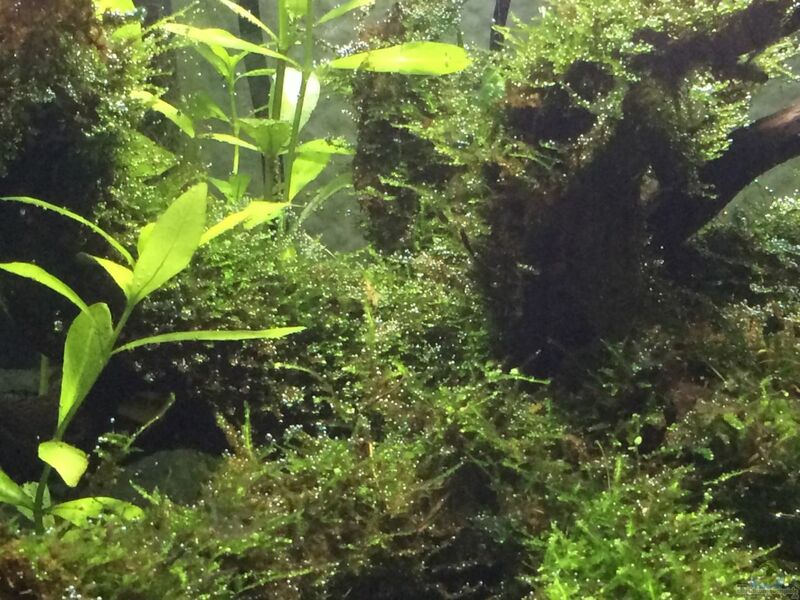 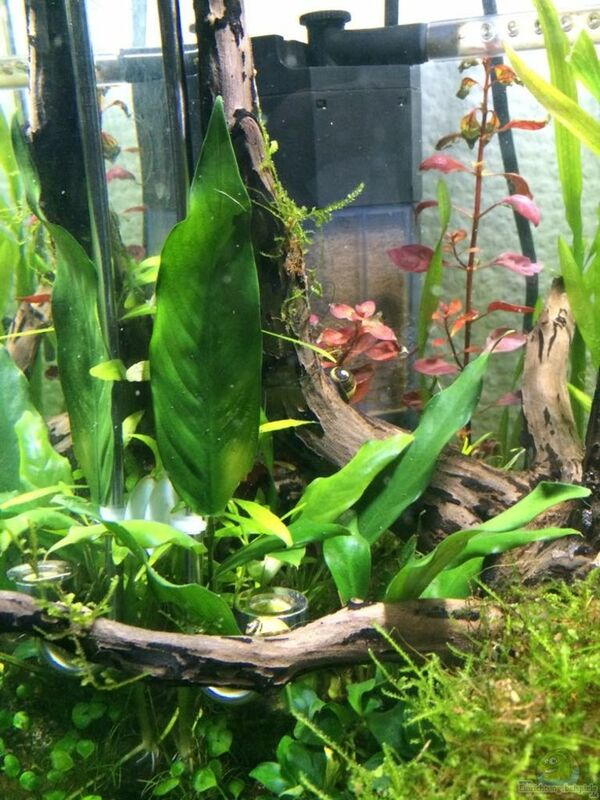 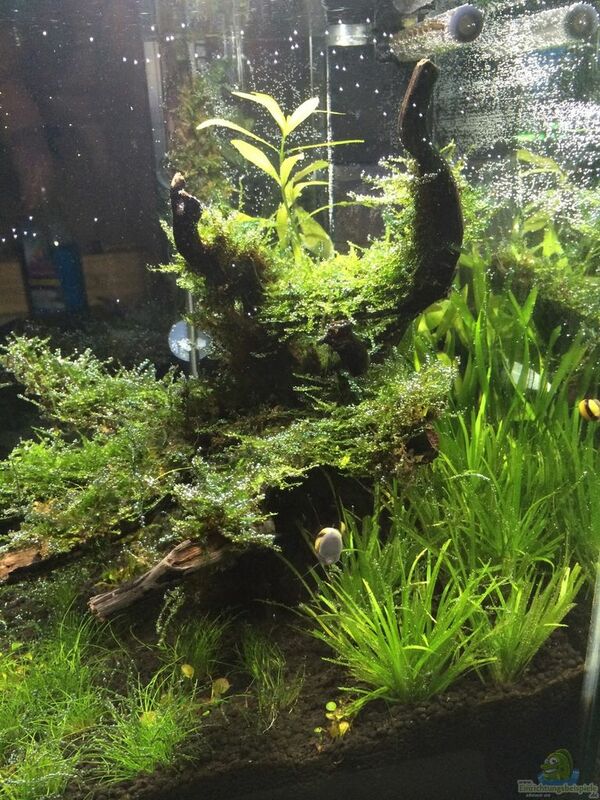 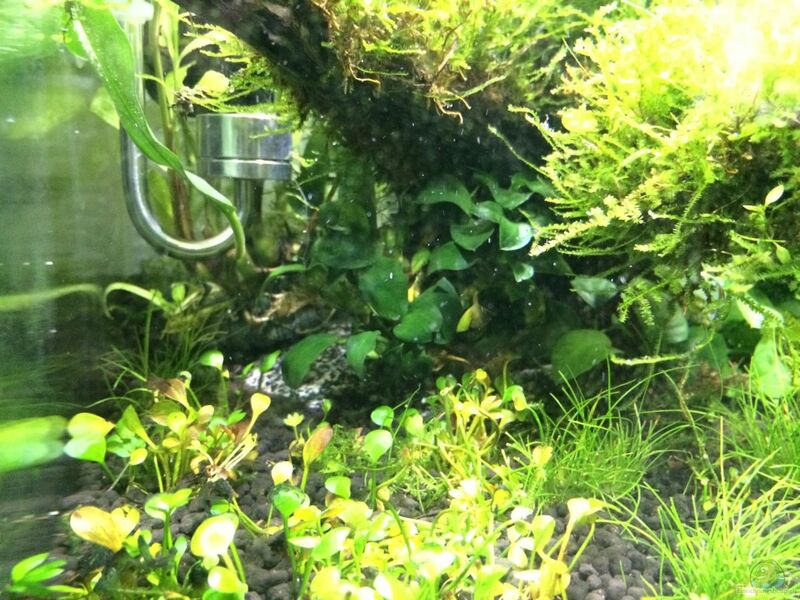 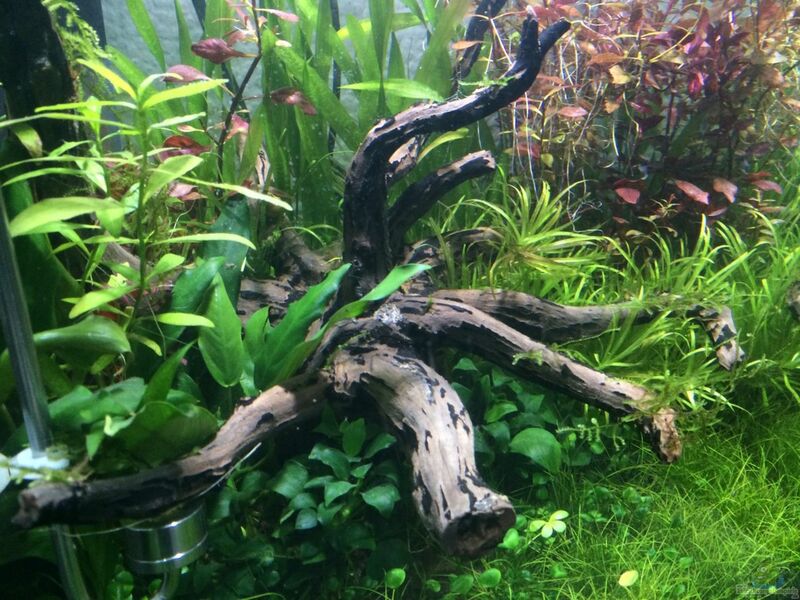 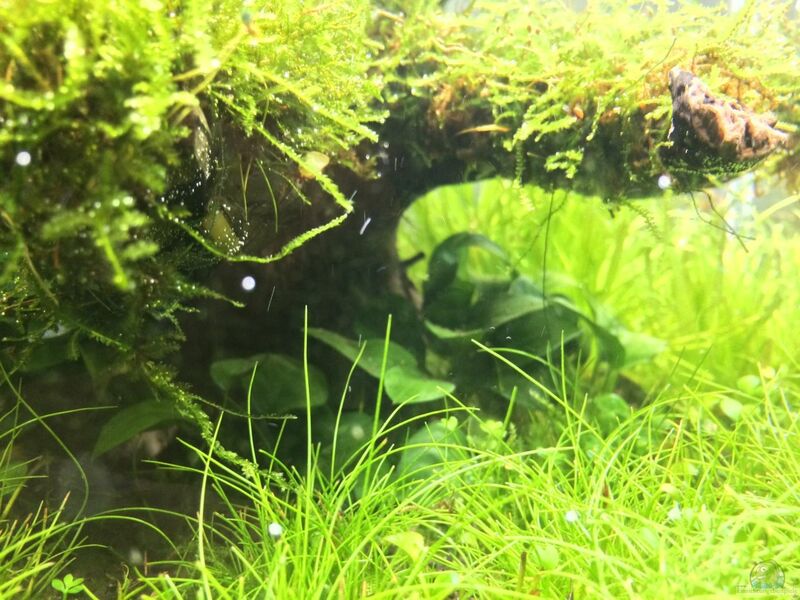 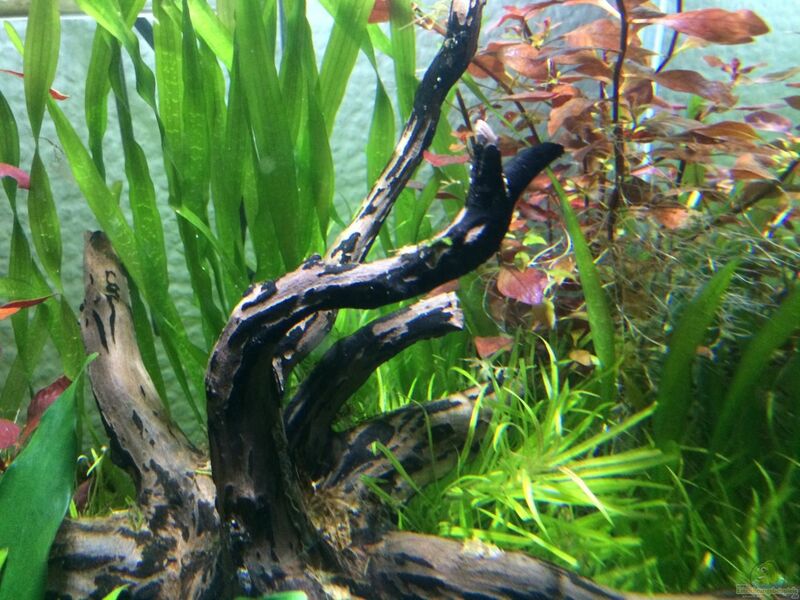 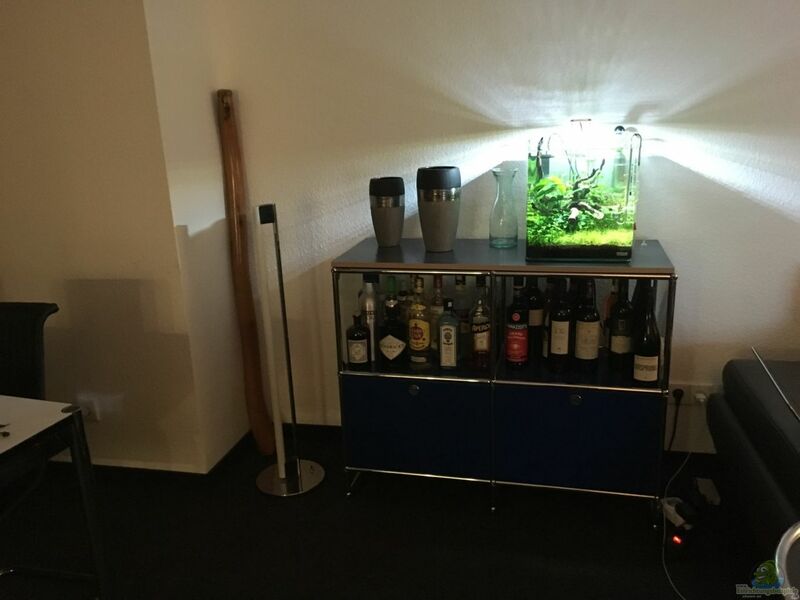 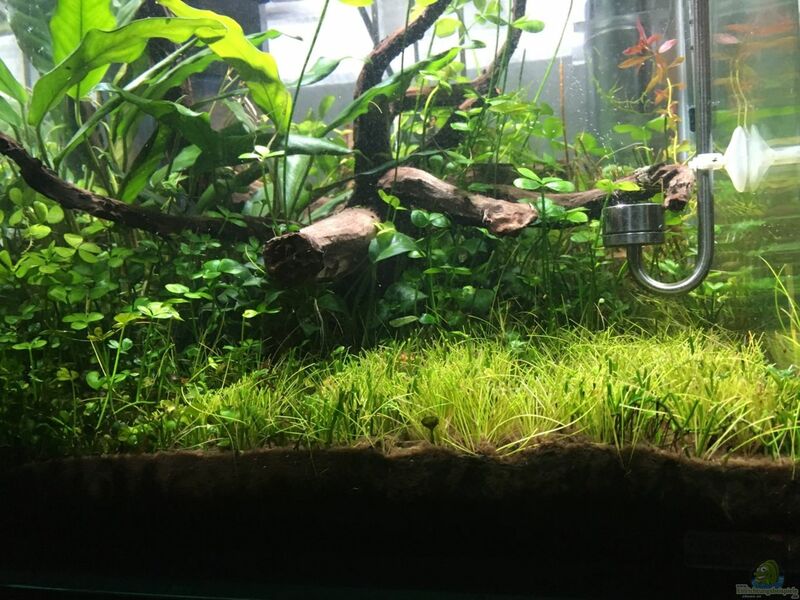 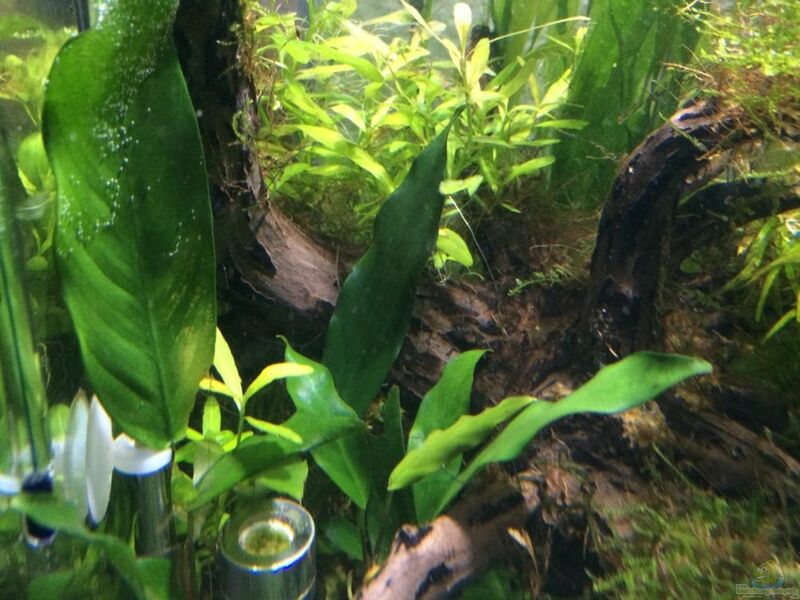 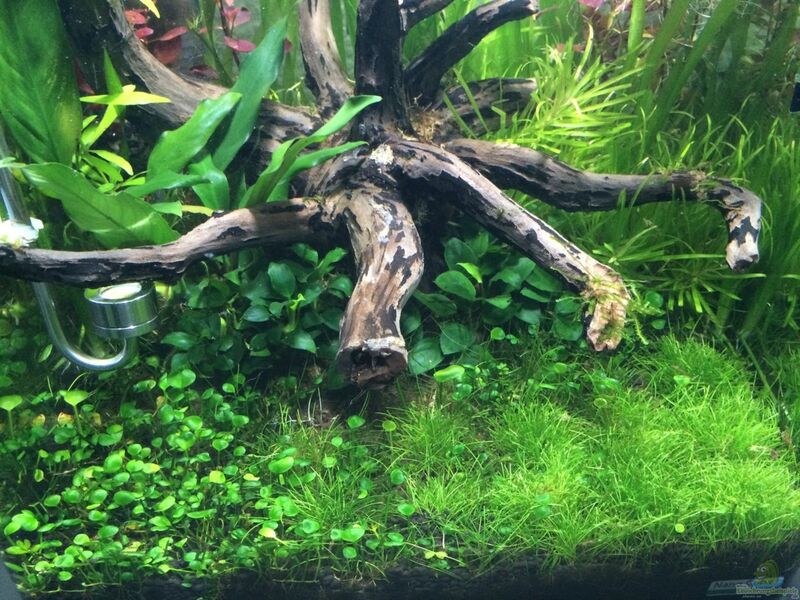 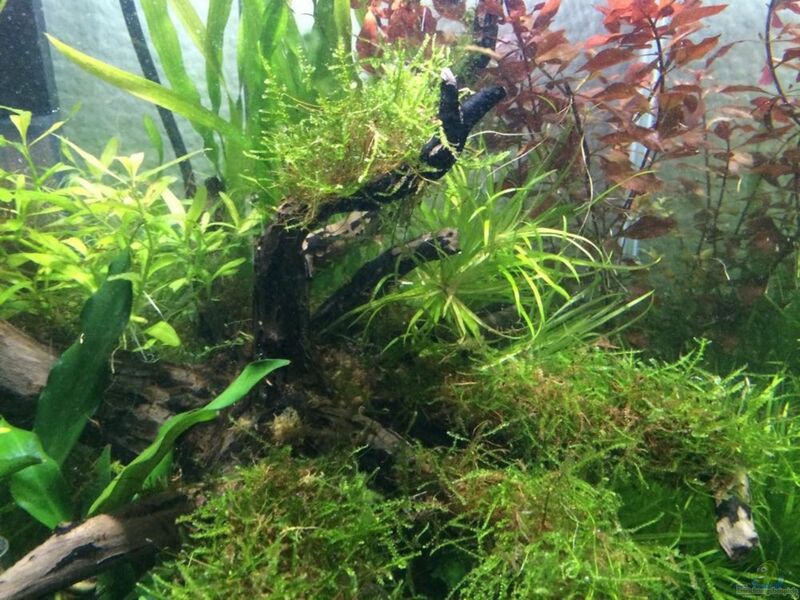 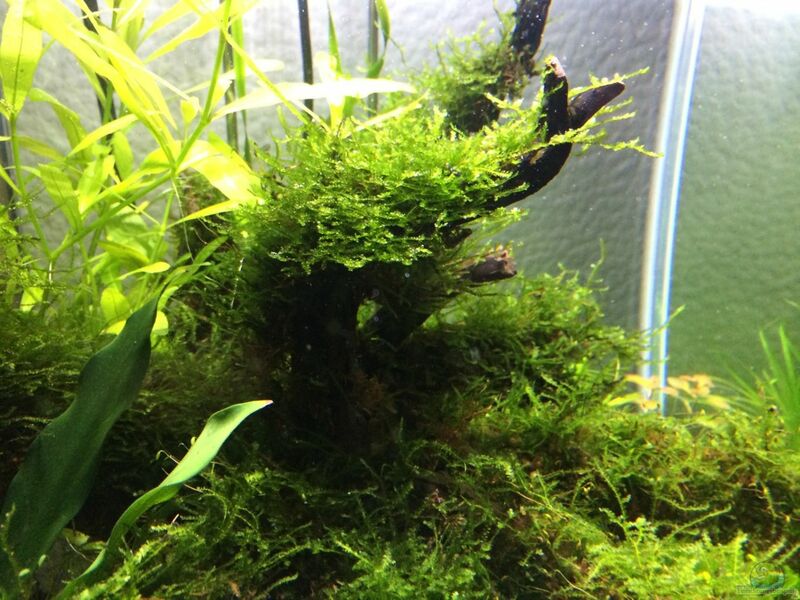 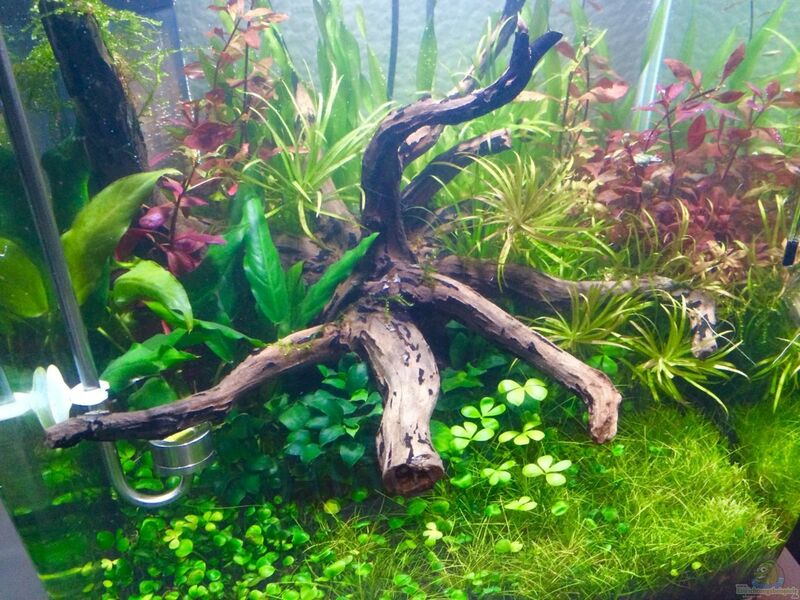 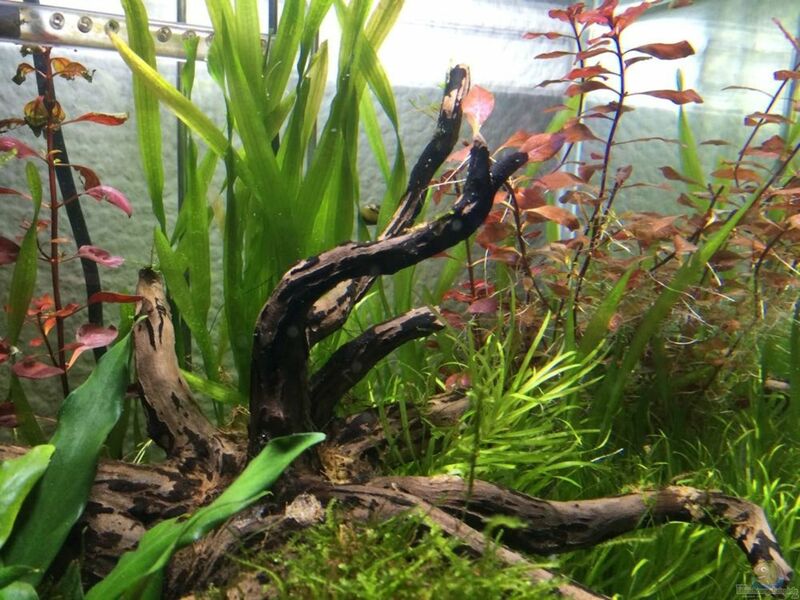 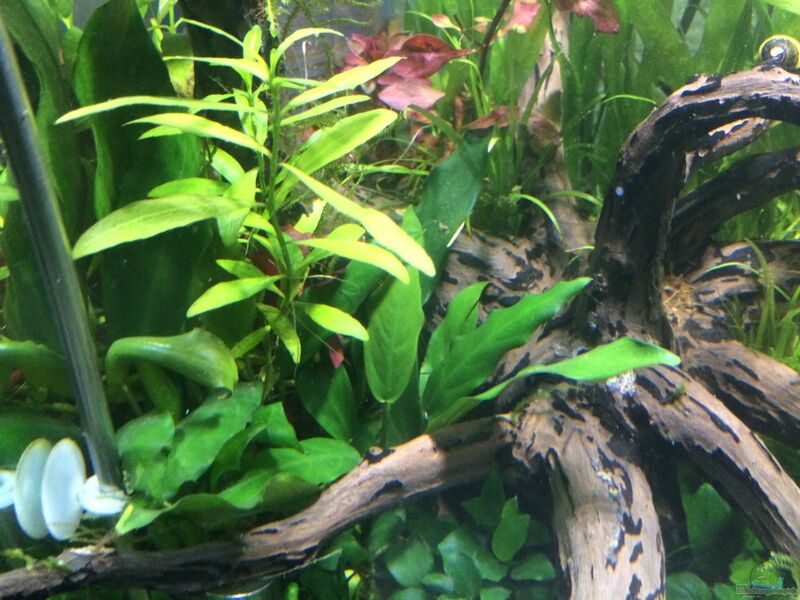 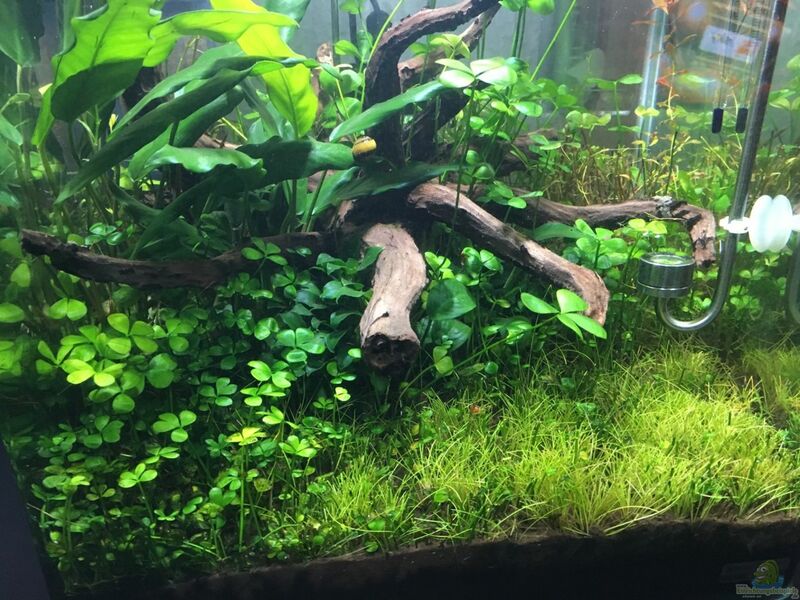 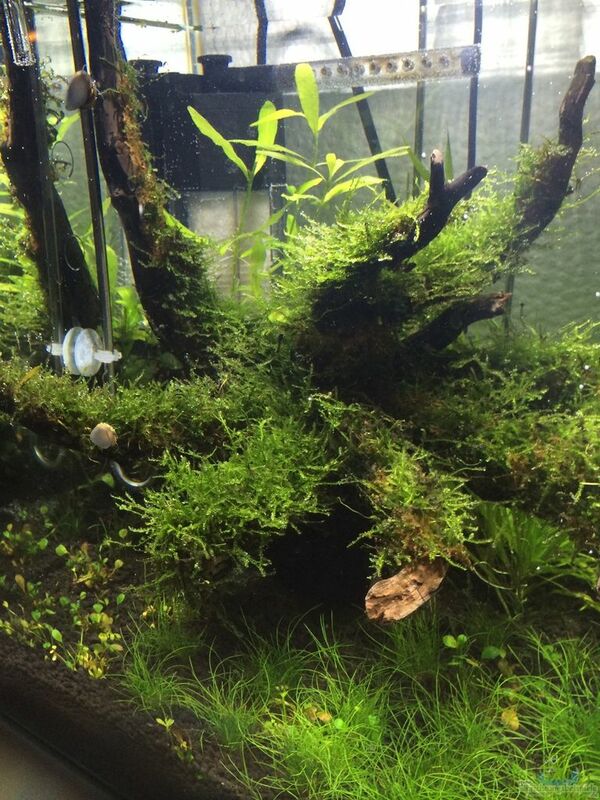 After a few years I wanted a Malawi Aquarium plants have - elegant look of Parts and tank were mandatory, so that it is recognized as a deliberate furnishing. 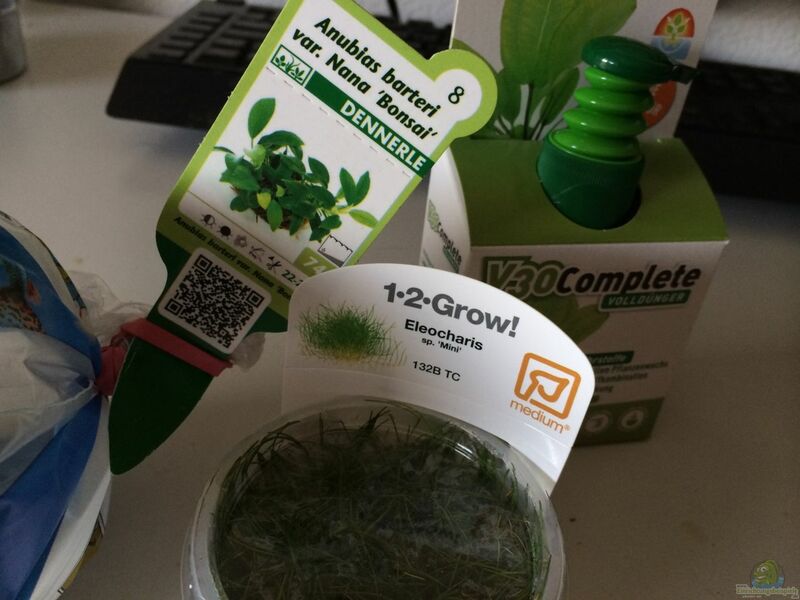 I wanted a good ground, not to annoy me afterwards about need. 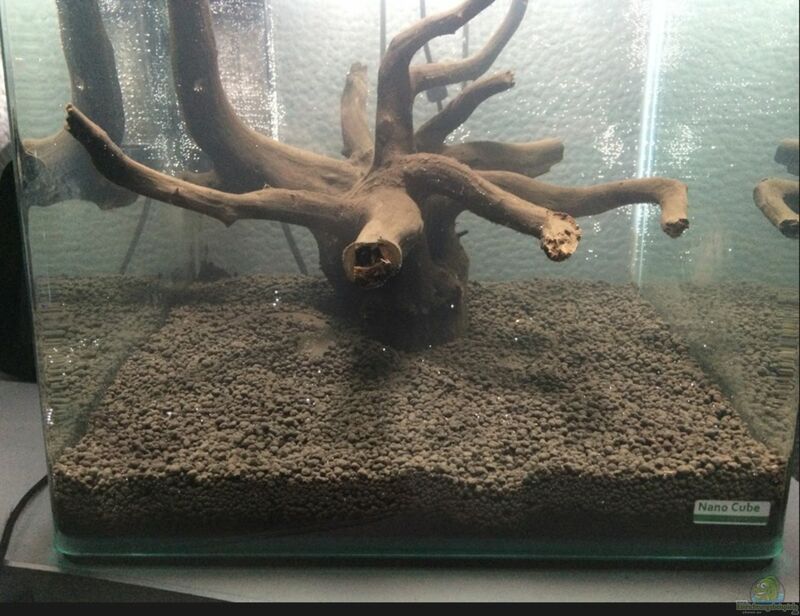 Power Sand and substrate additives I have omitted. 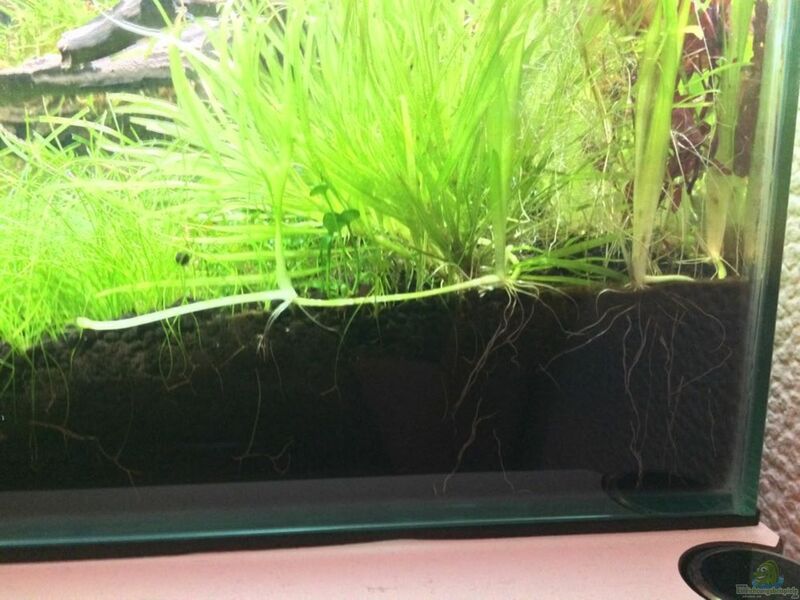 Since I did not know Soil, it reminded me initially to a seramis-like potting soil. 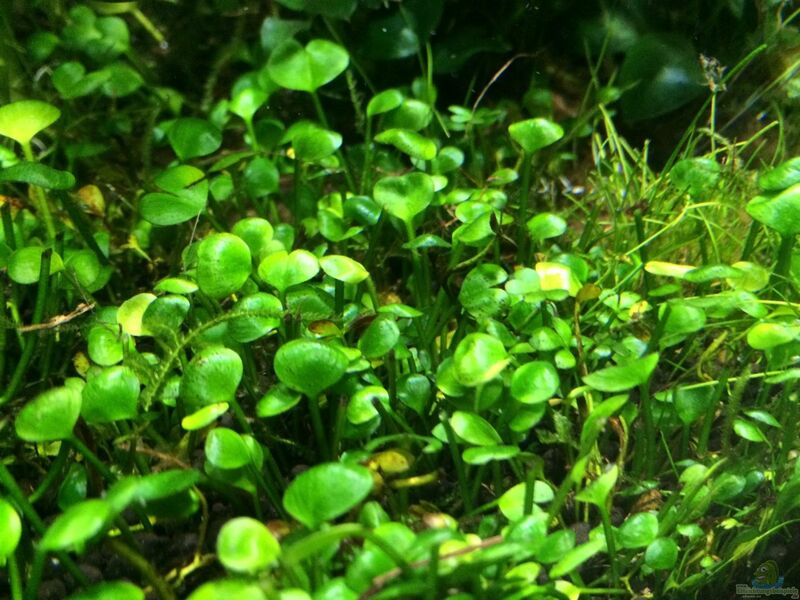 Groundcover like mini-needle ledges or Zergkleefarn however Tuen is a bit heavy at the beginning. 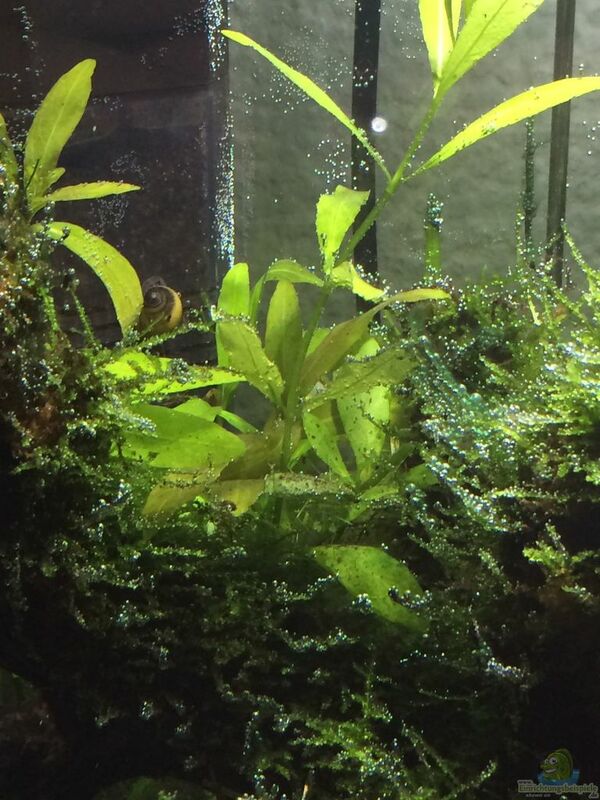 Anubia barterii var. 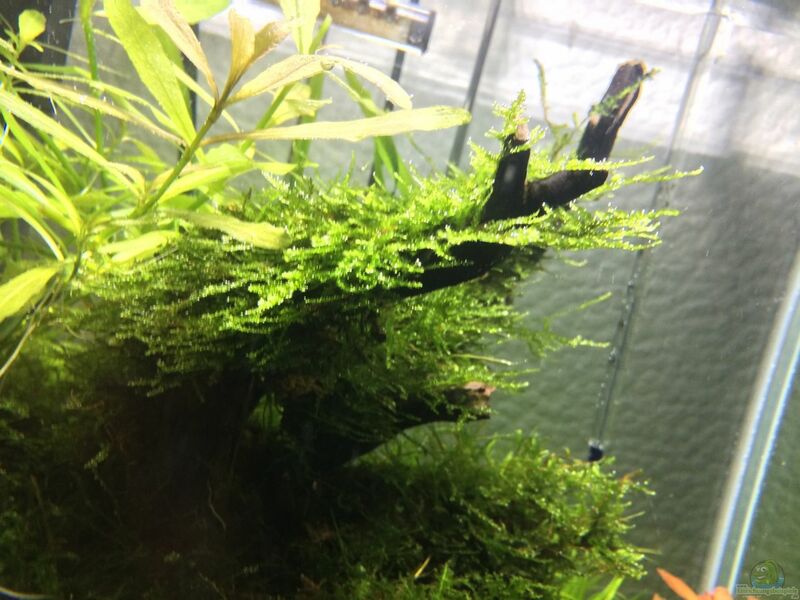 Nana "Bonsai"
Anubia barterii var. 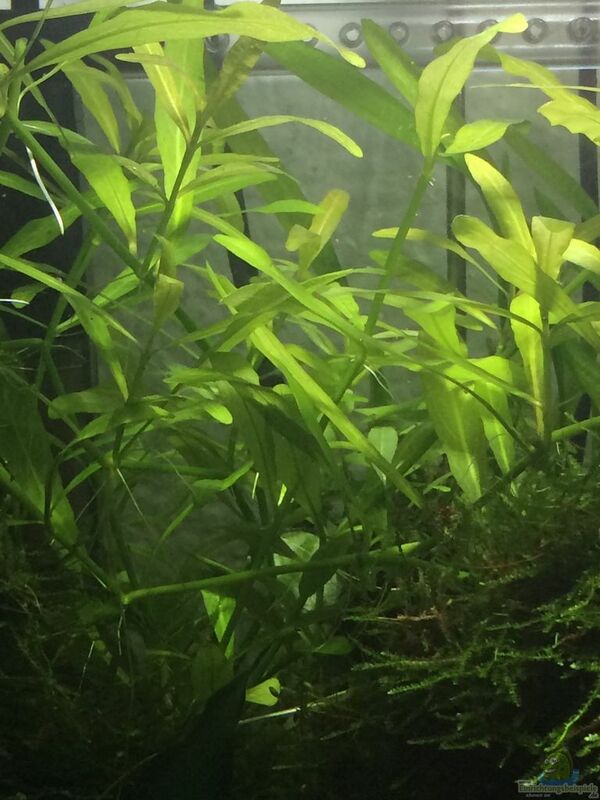 Nana "Petite"
-Hygrophila Polysperma "Little Indian water friend"
Focus is on simple plants which do well in low light and love. 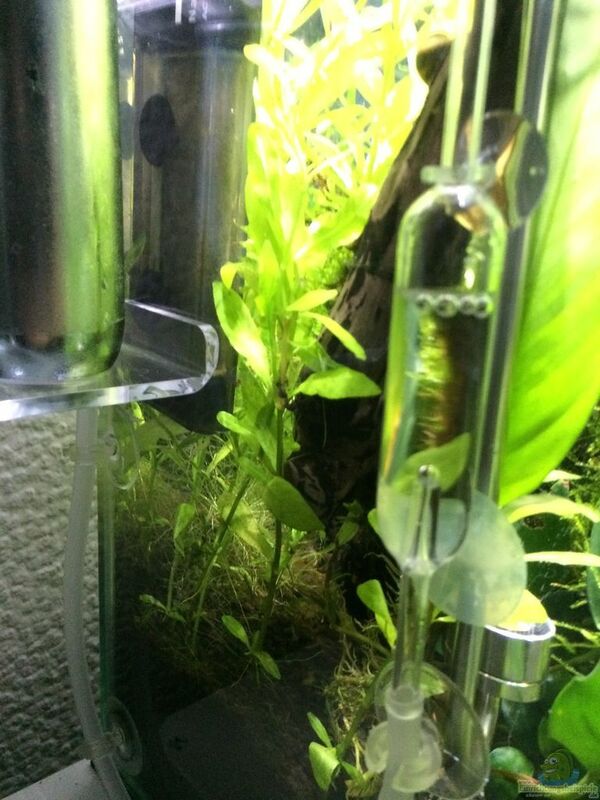 A bit of self-reliance of Aquas must be given. 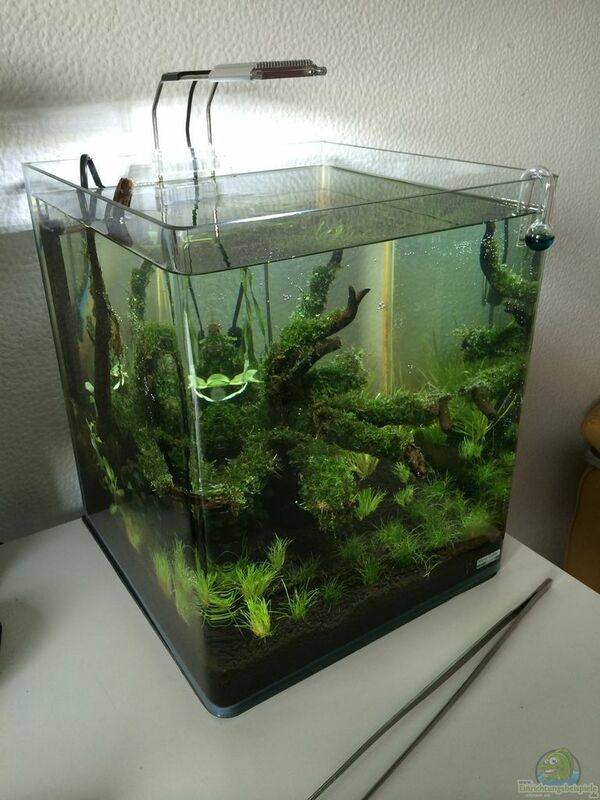 30ltr water are difficult enough. 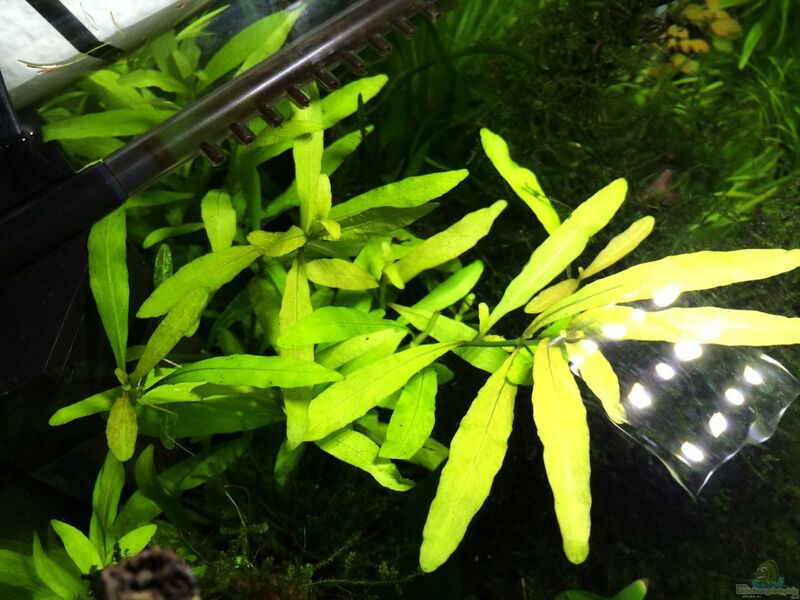 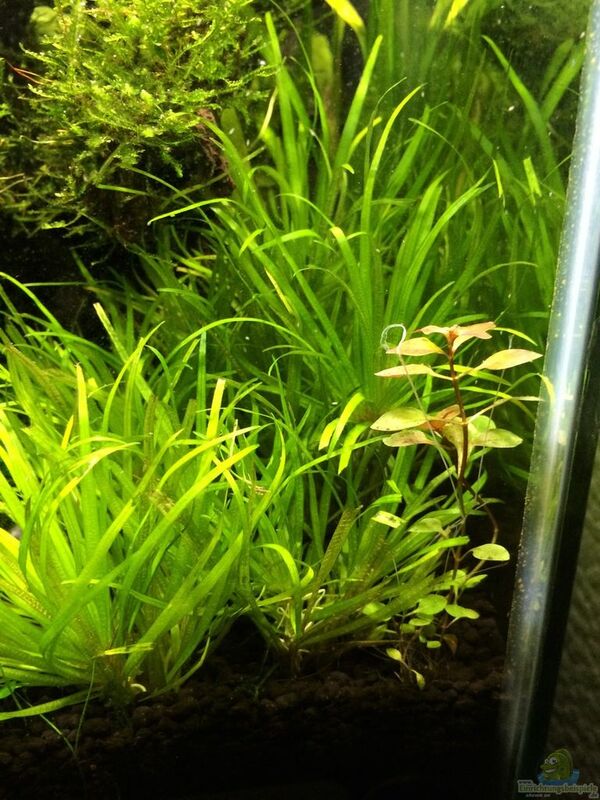 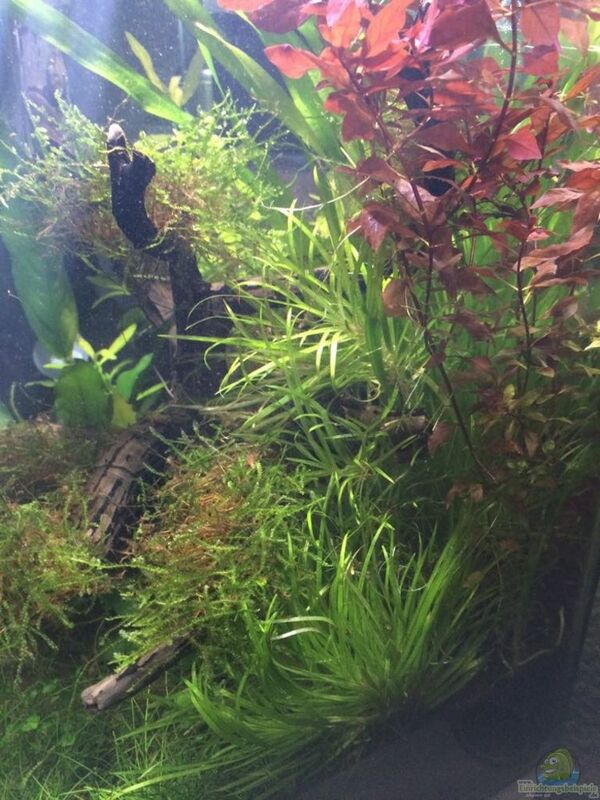 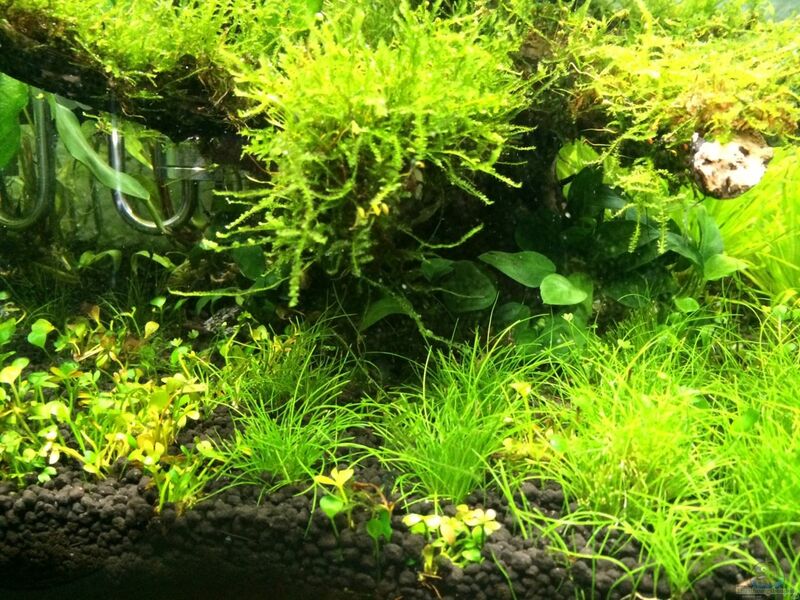 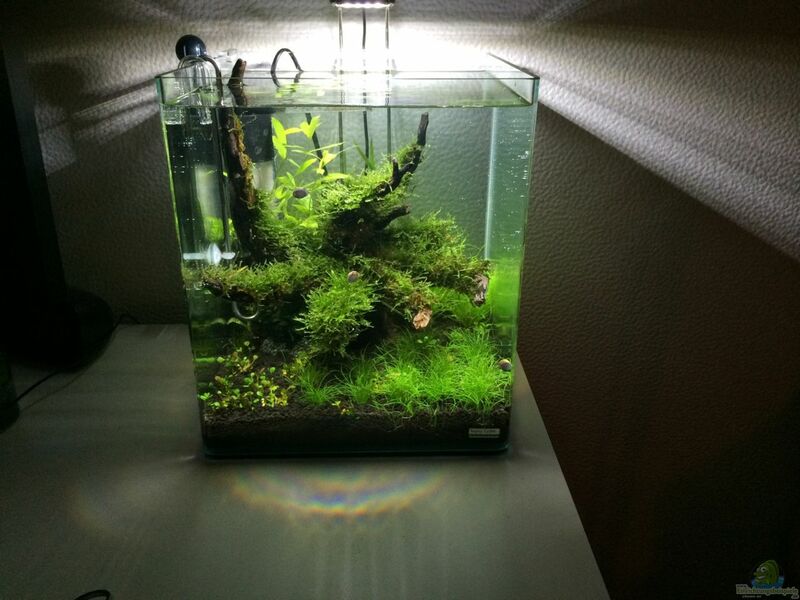 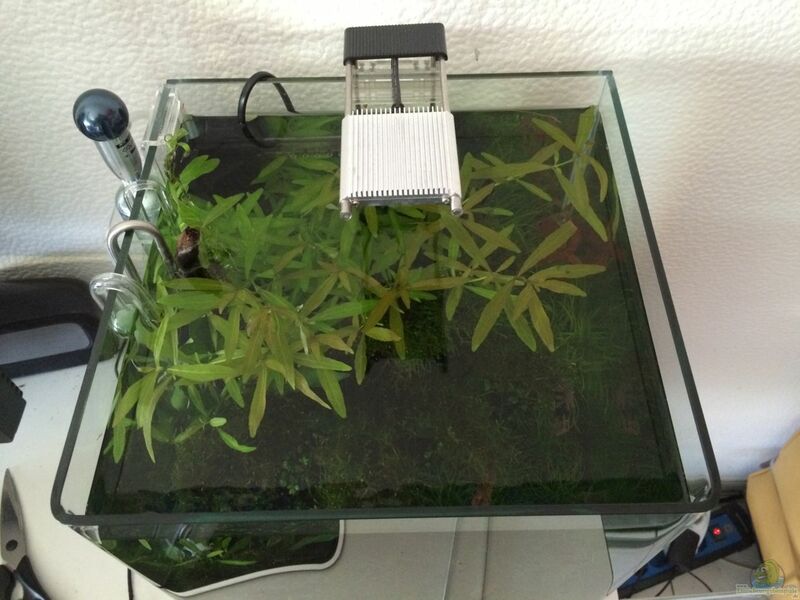 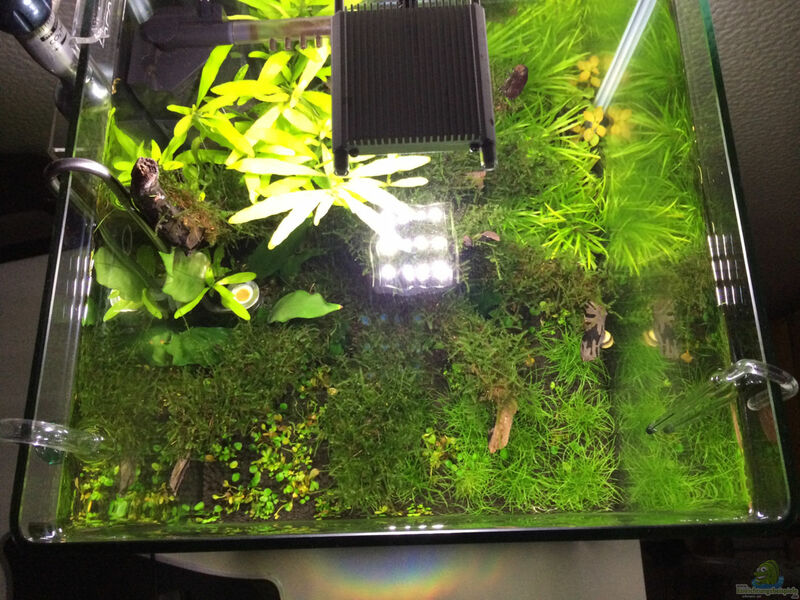 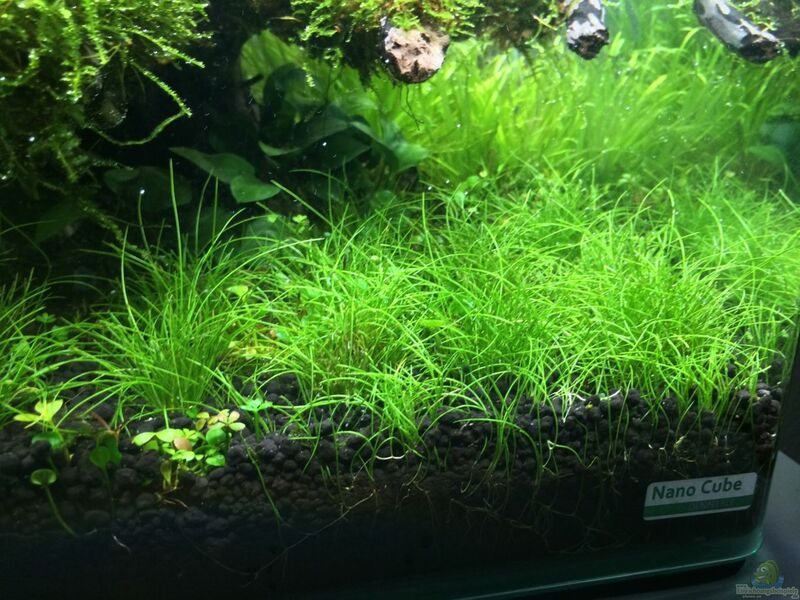 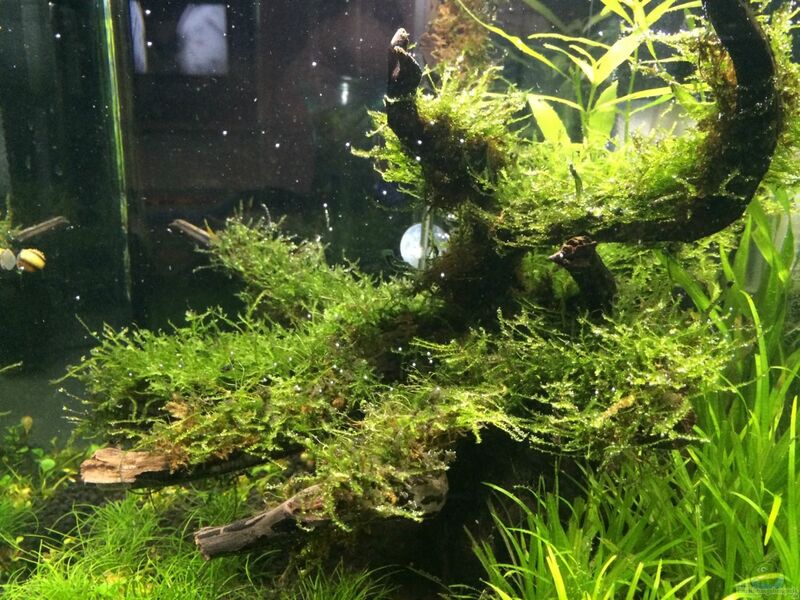 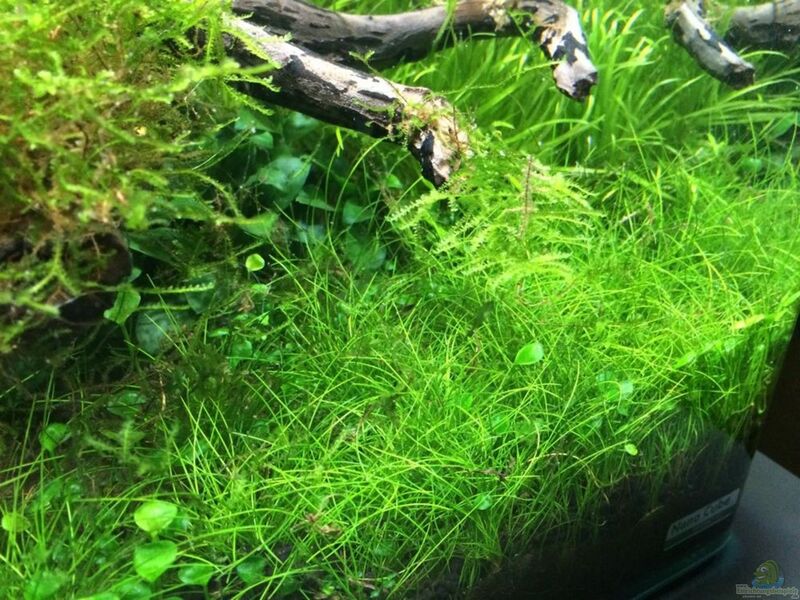 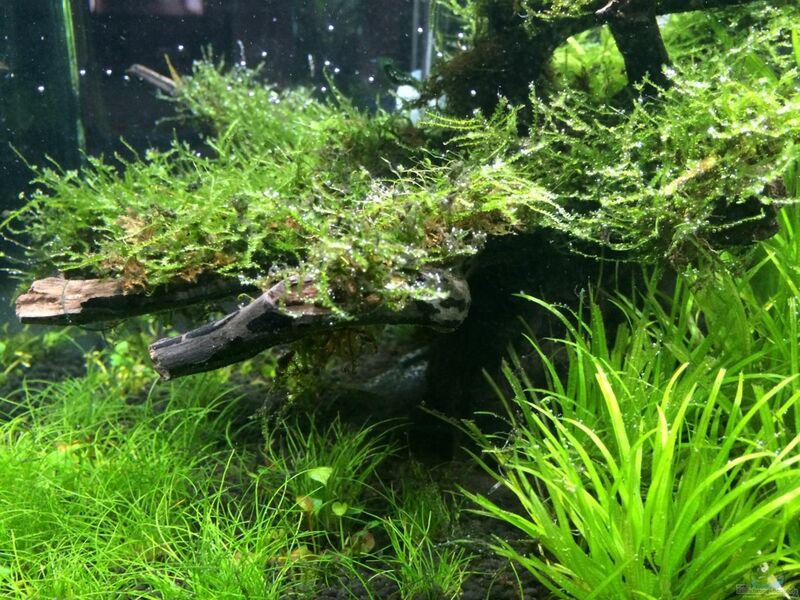 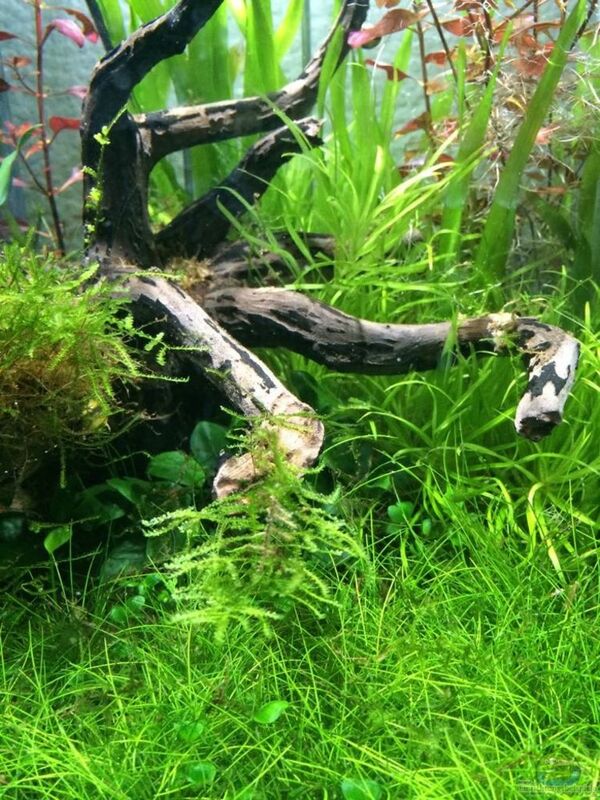 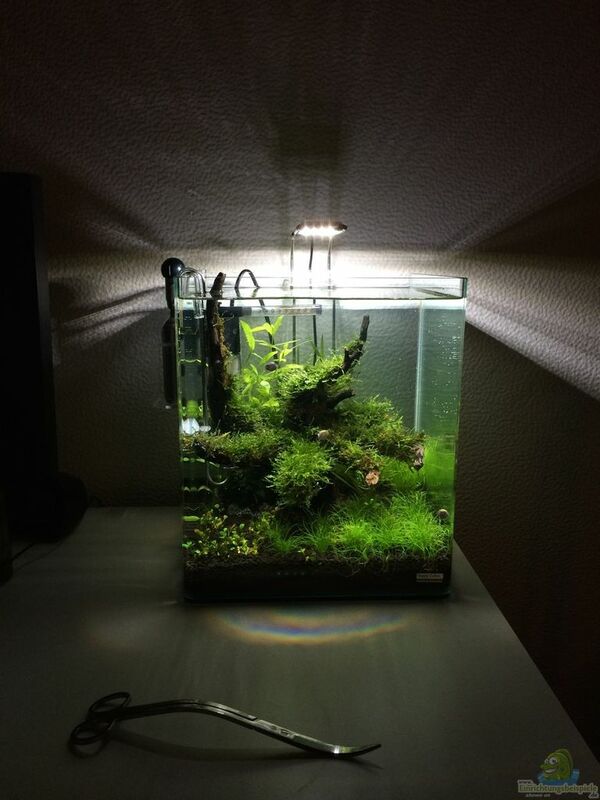 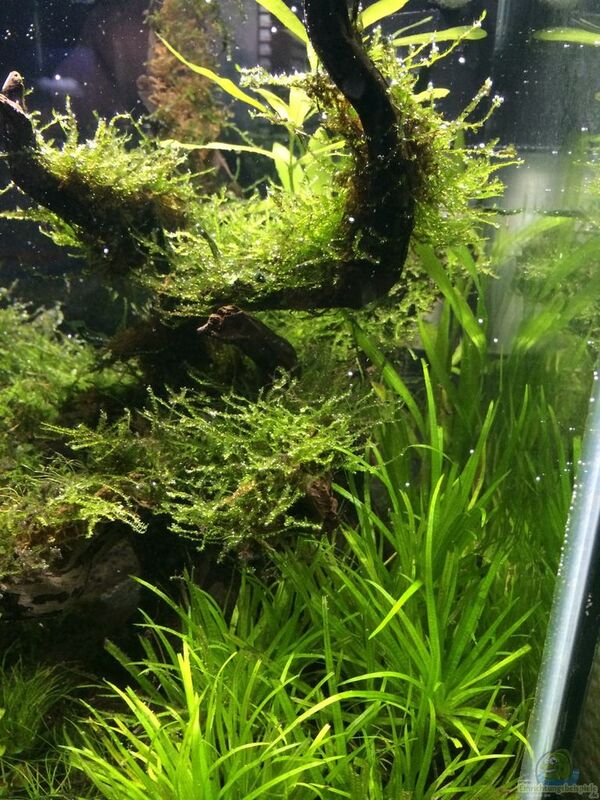 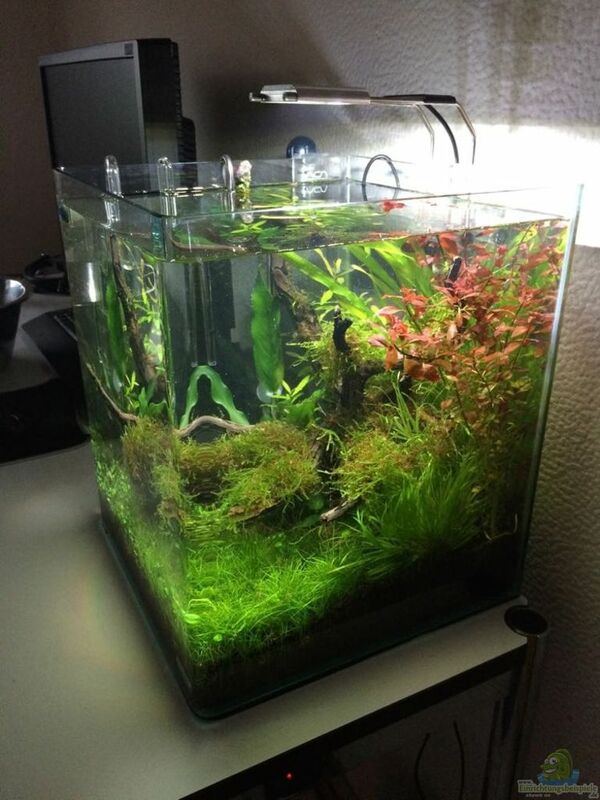 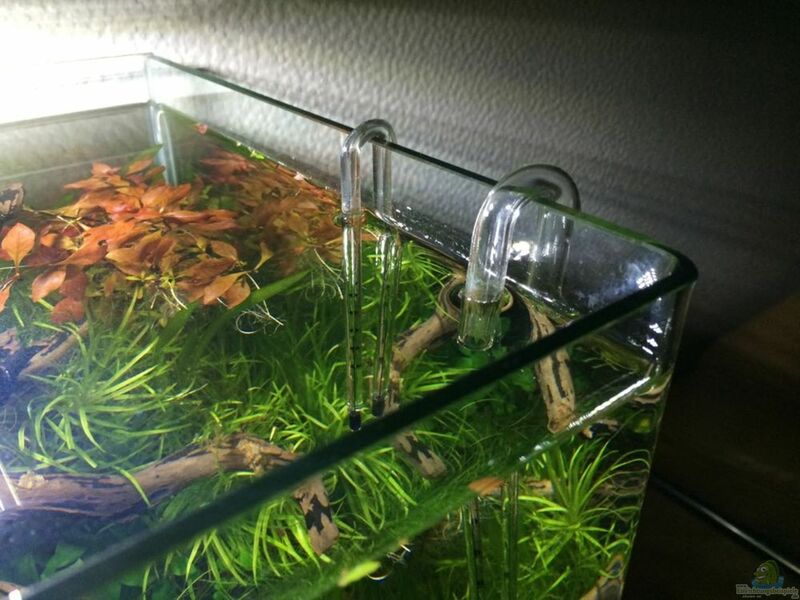 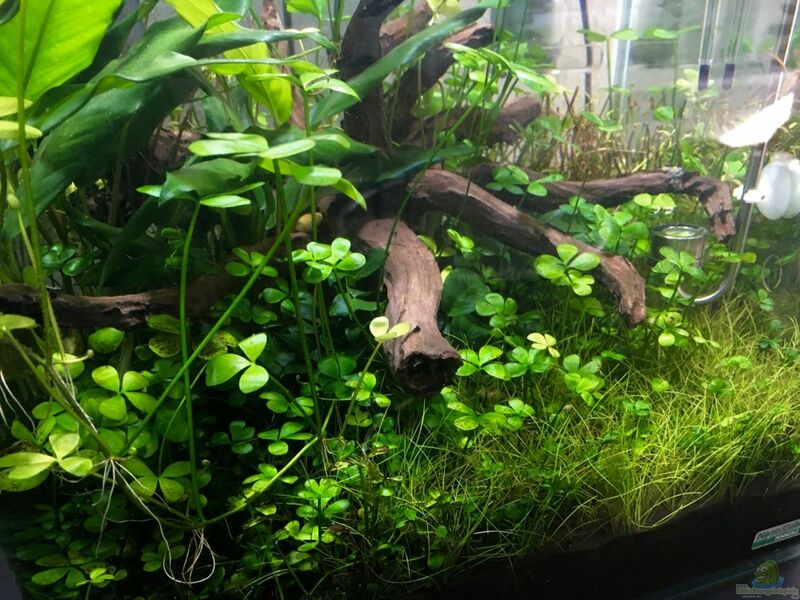 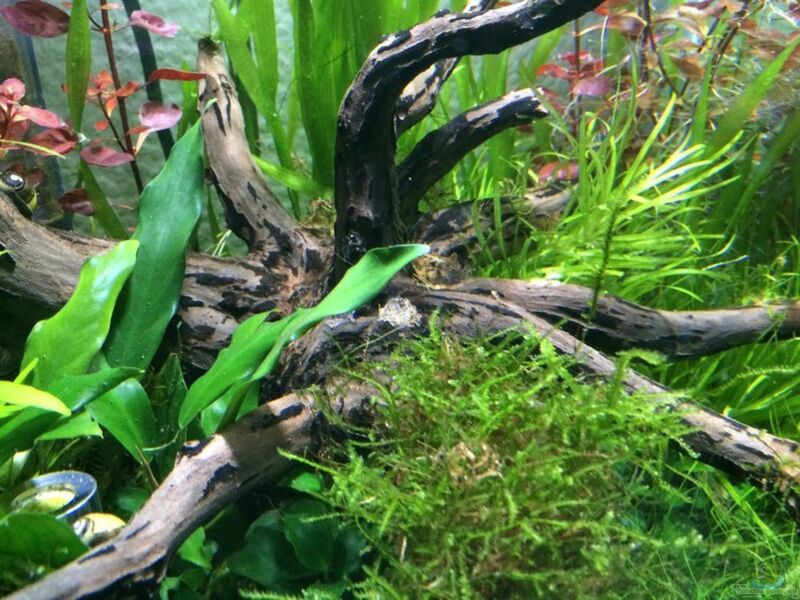 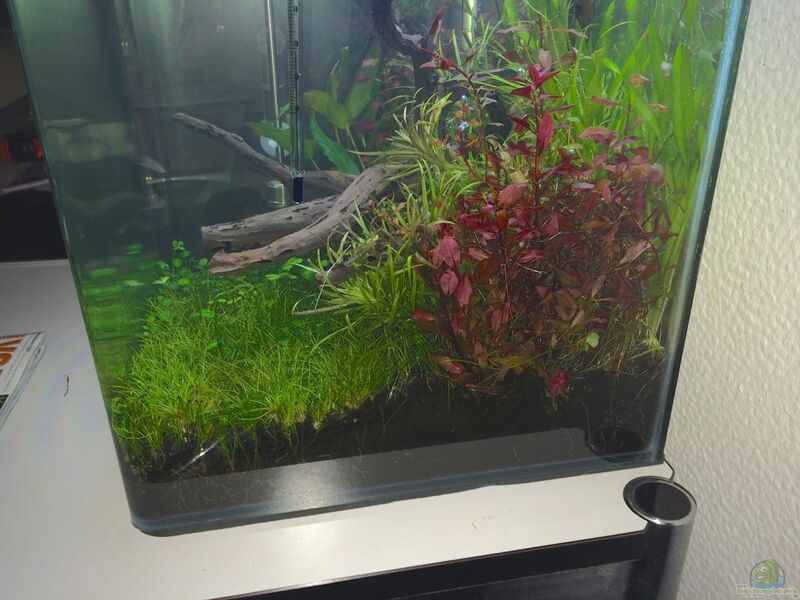 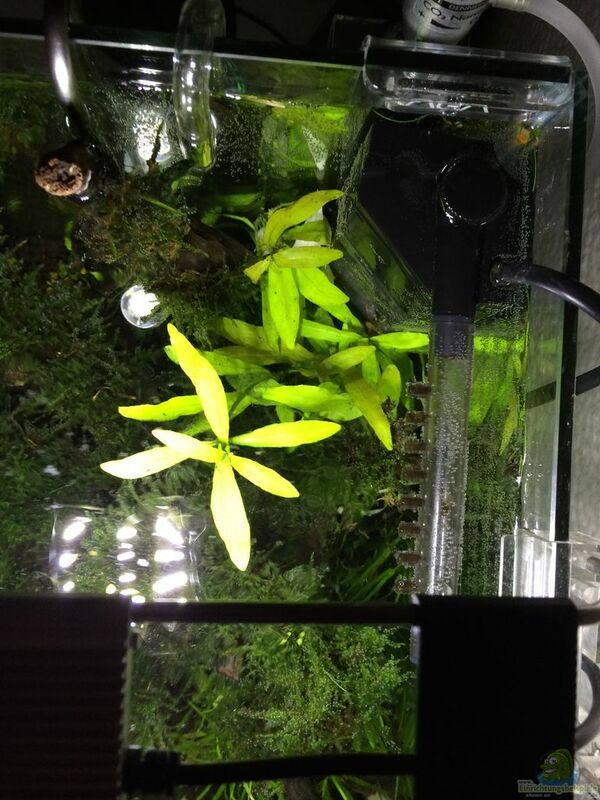 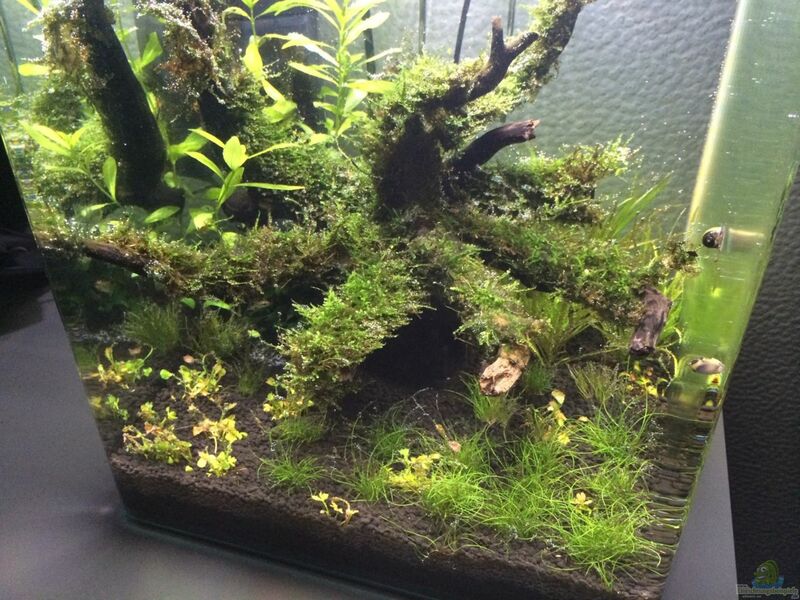 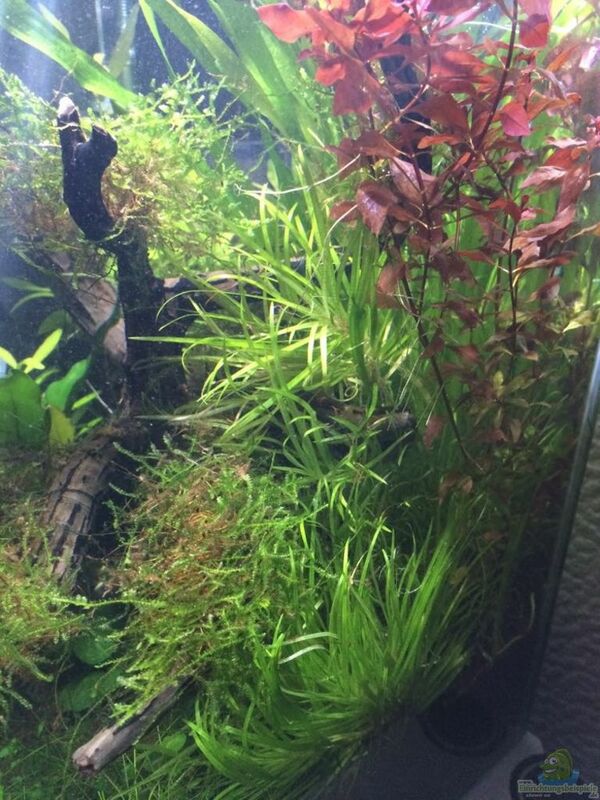 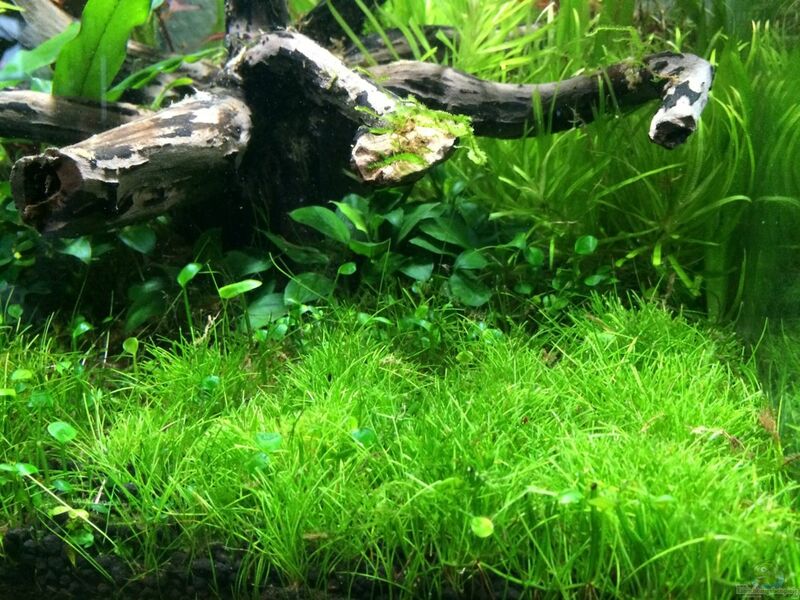 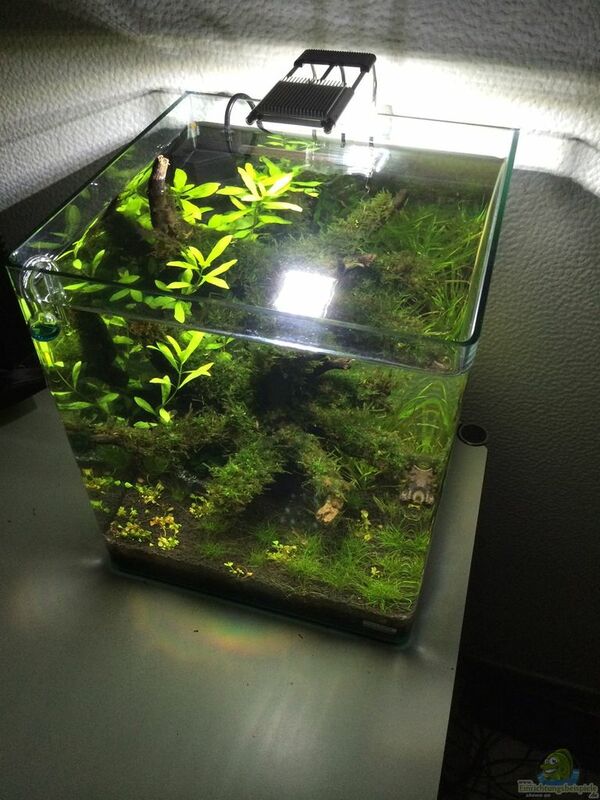 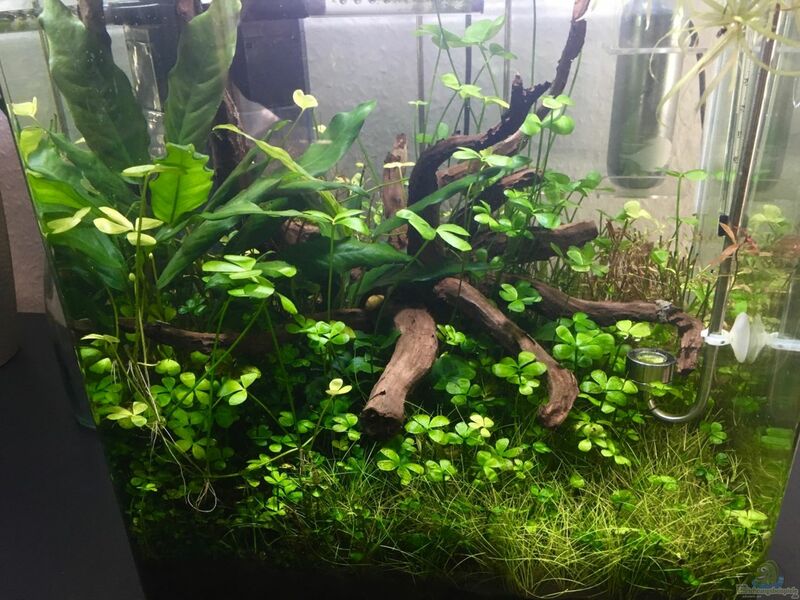 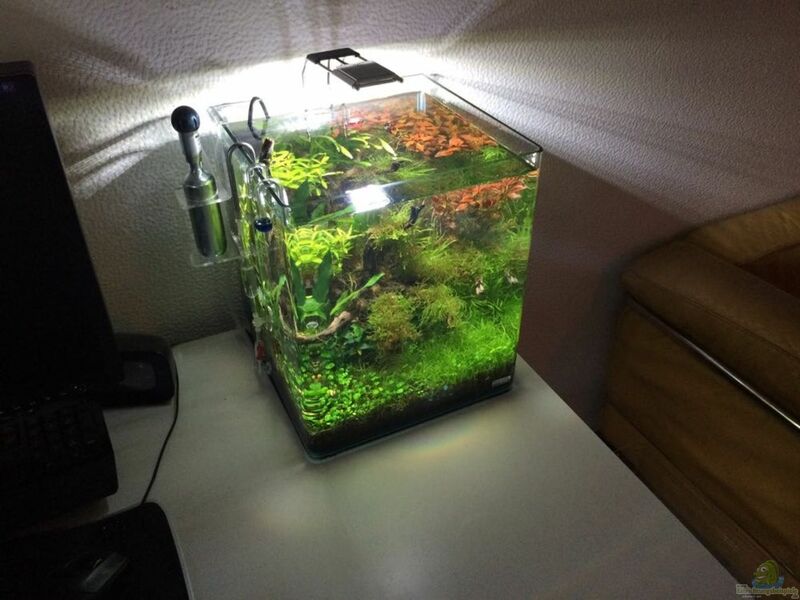 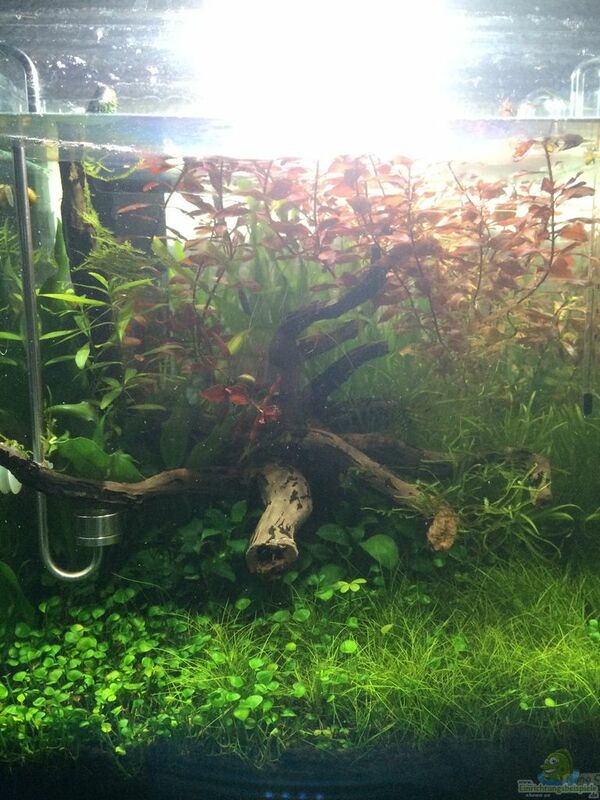 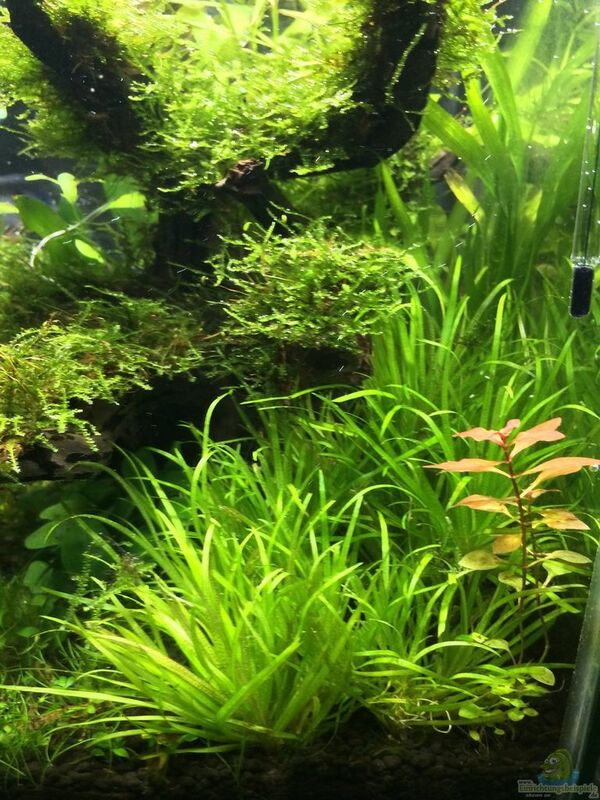 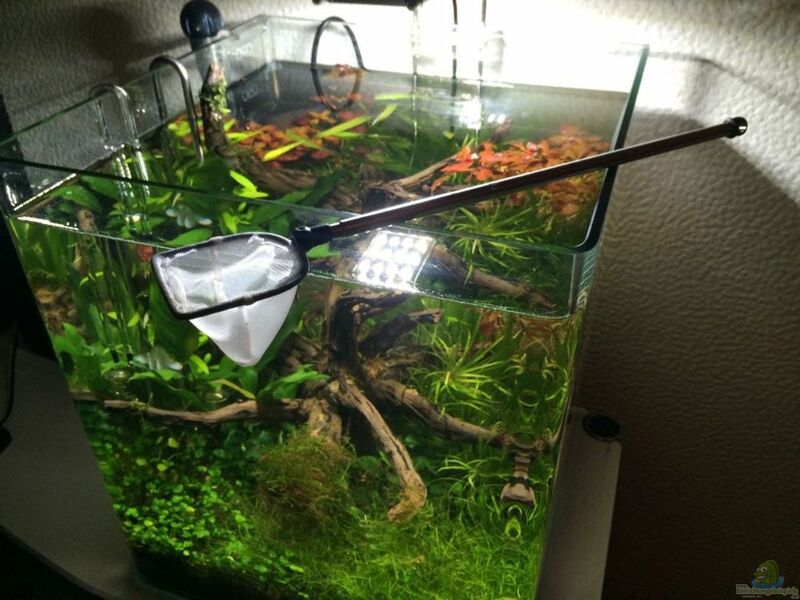 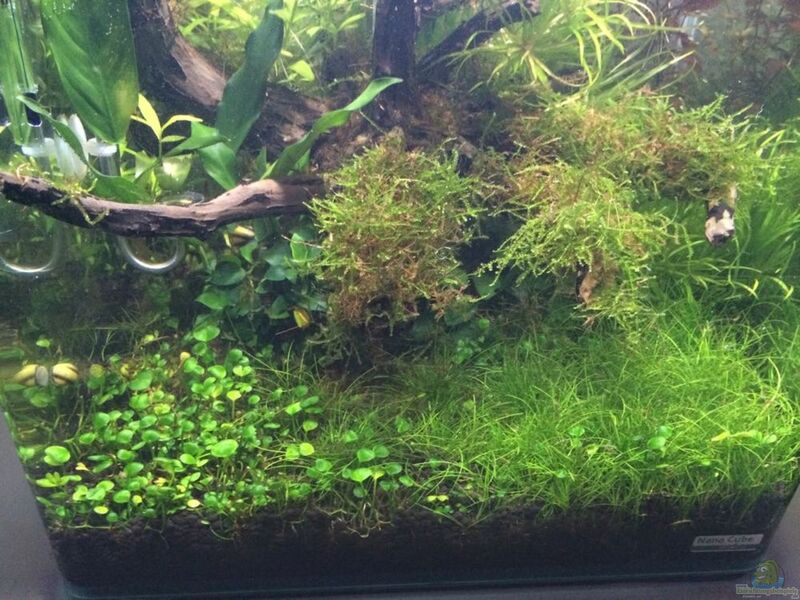 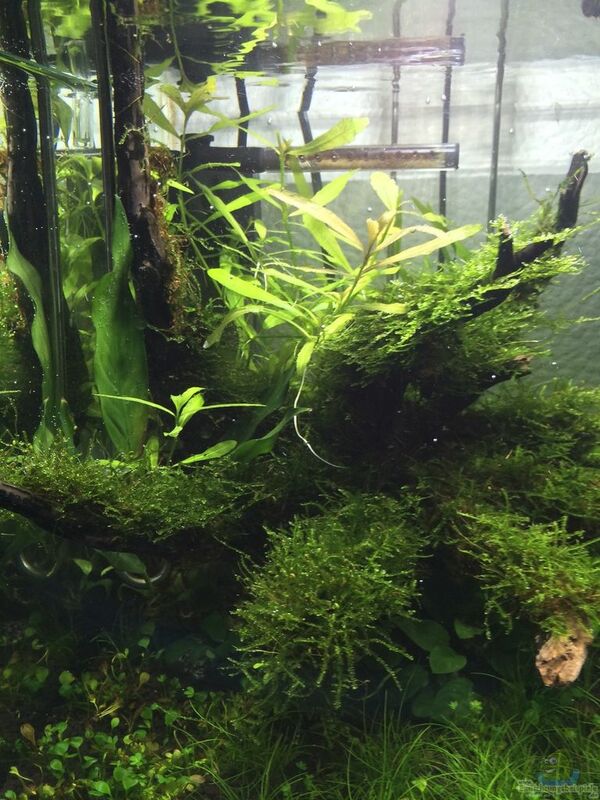 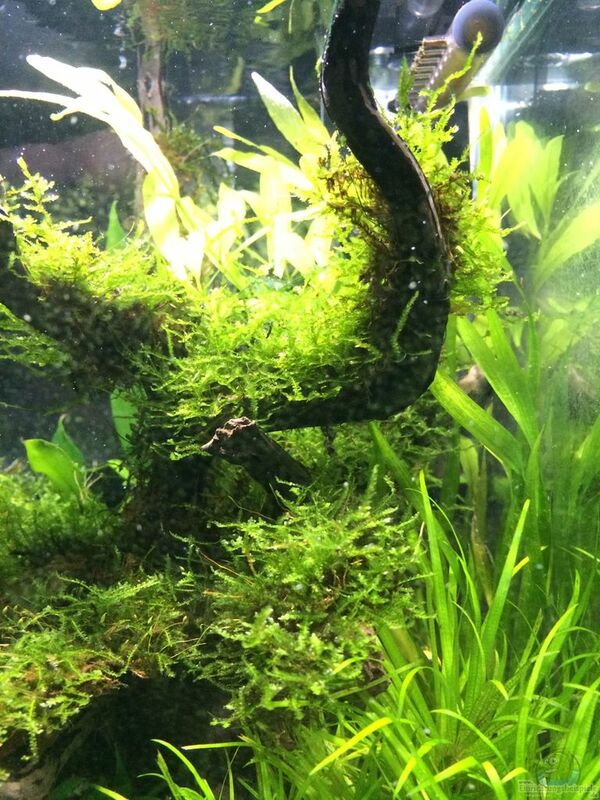 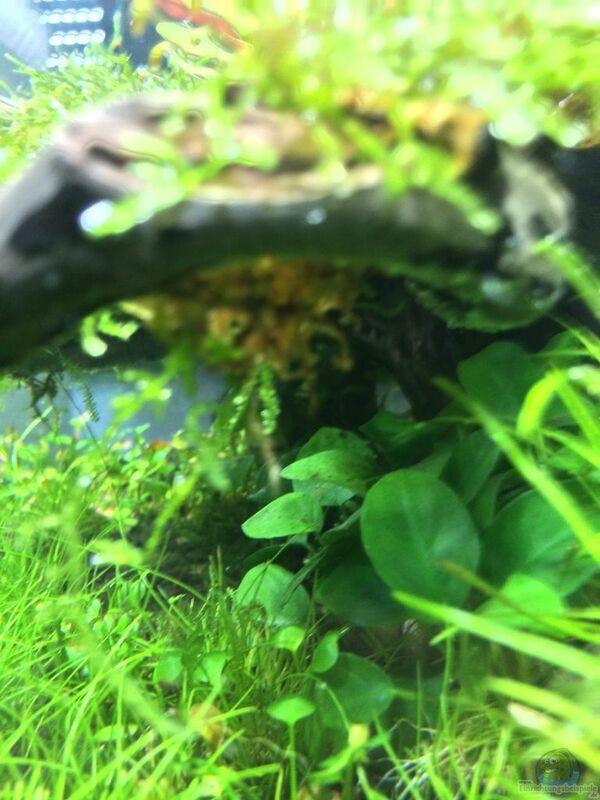 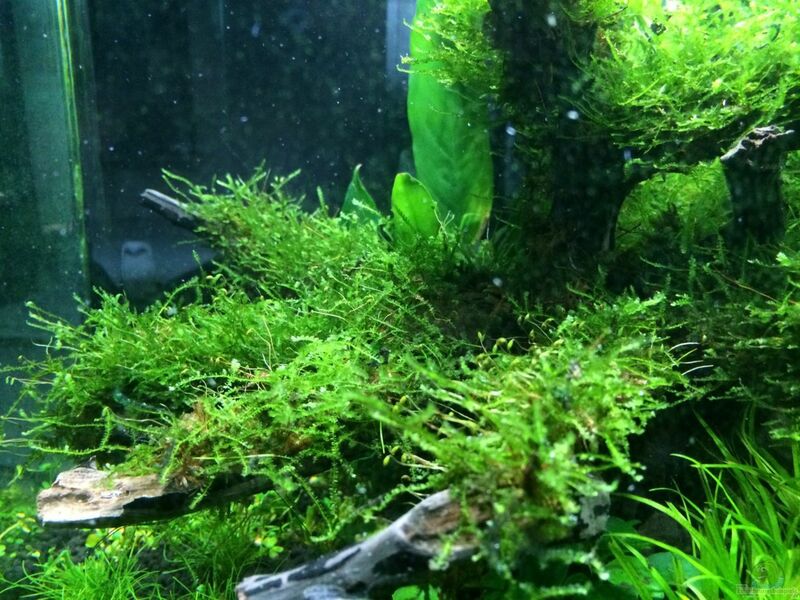 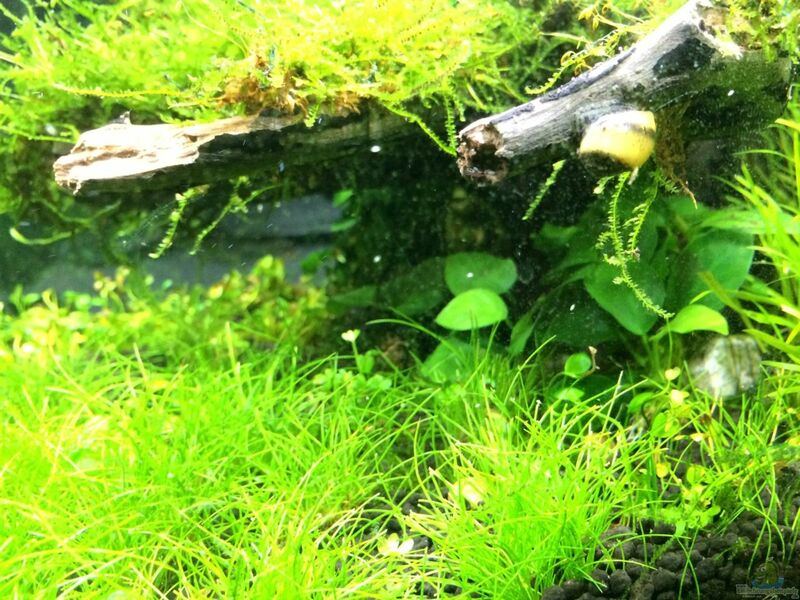 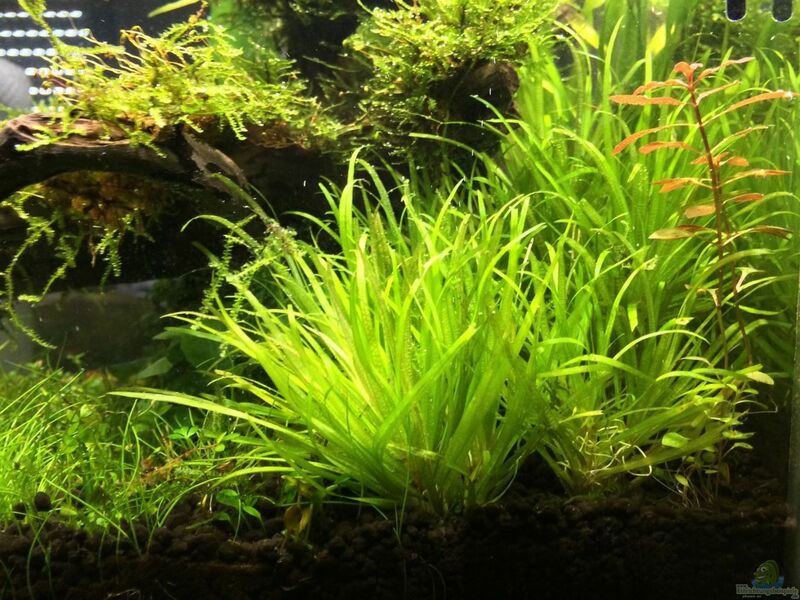 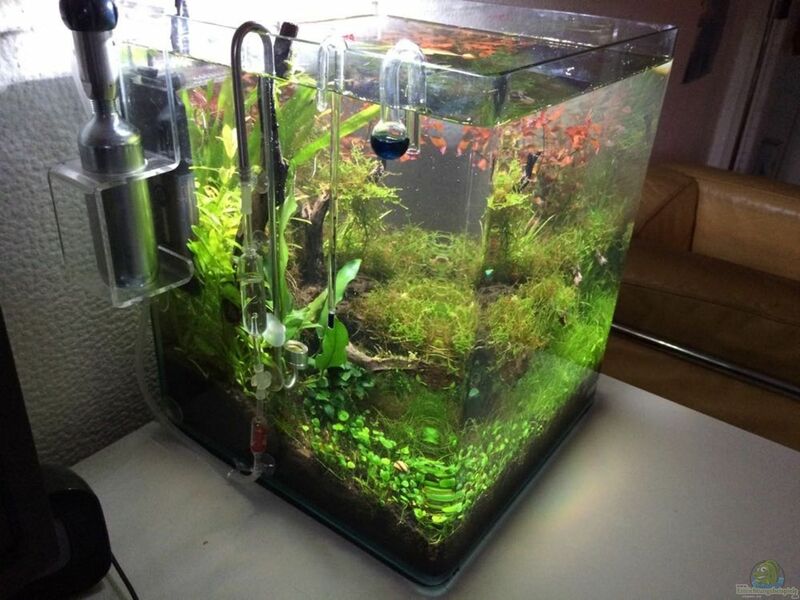 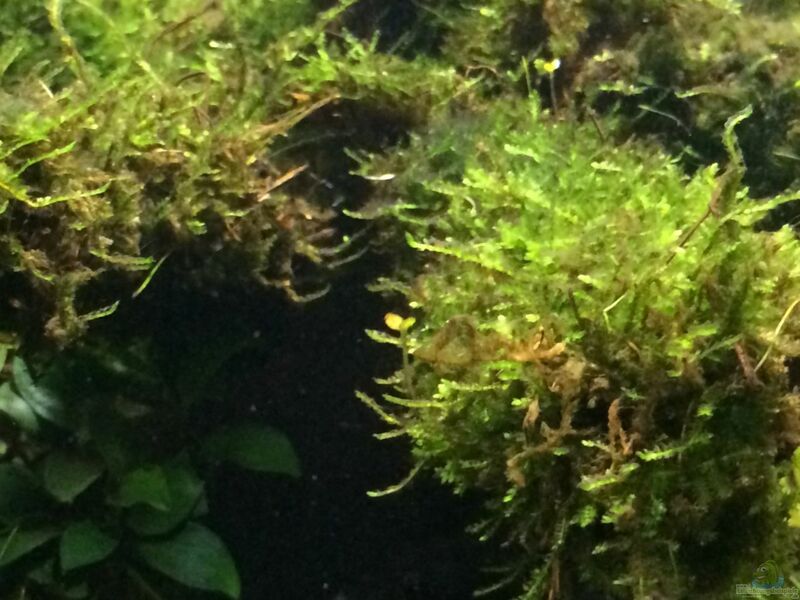 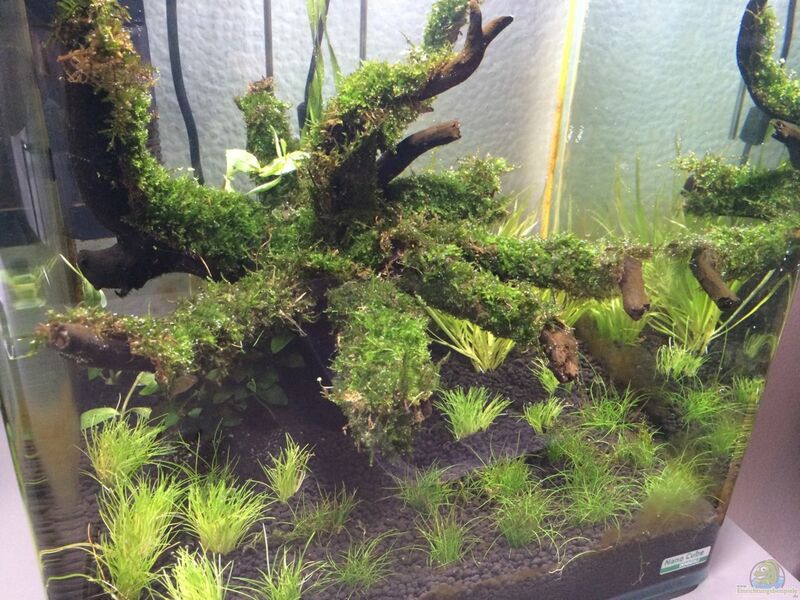 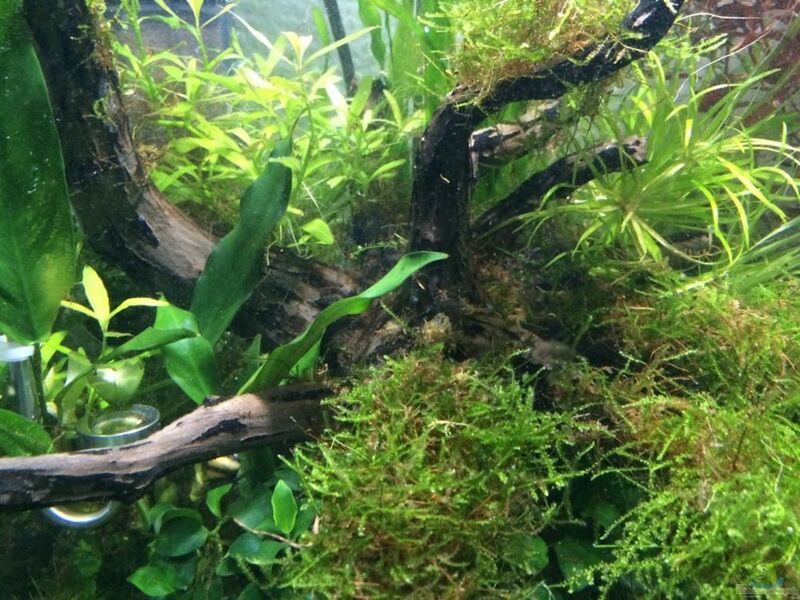 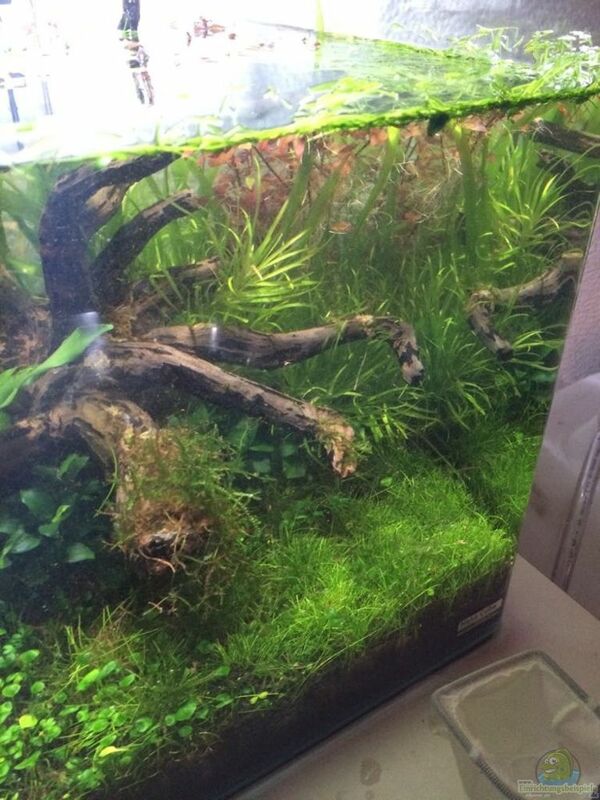 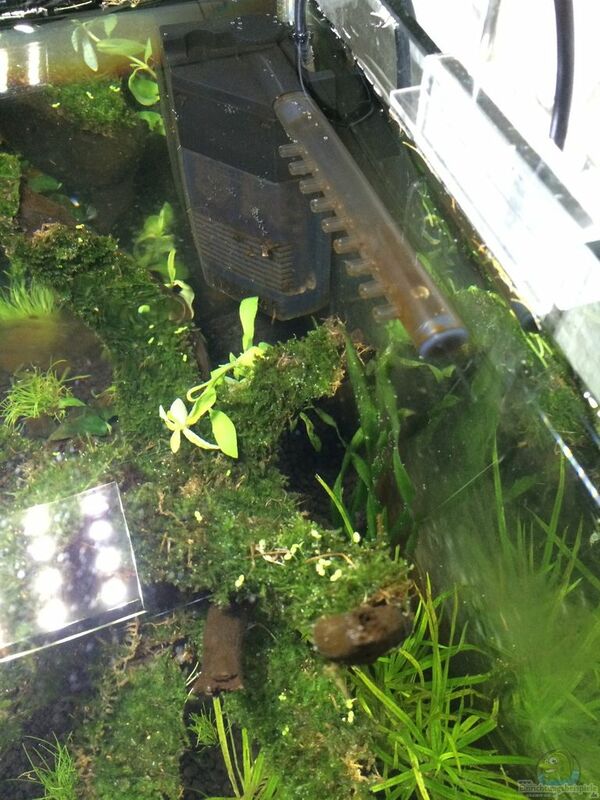 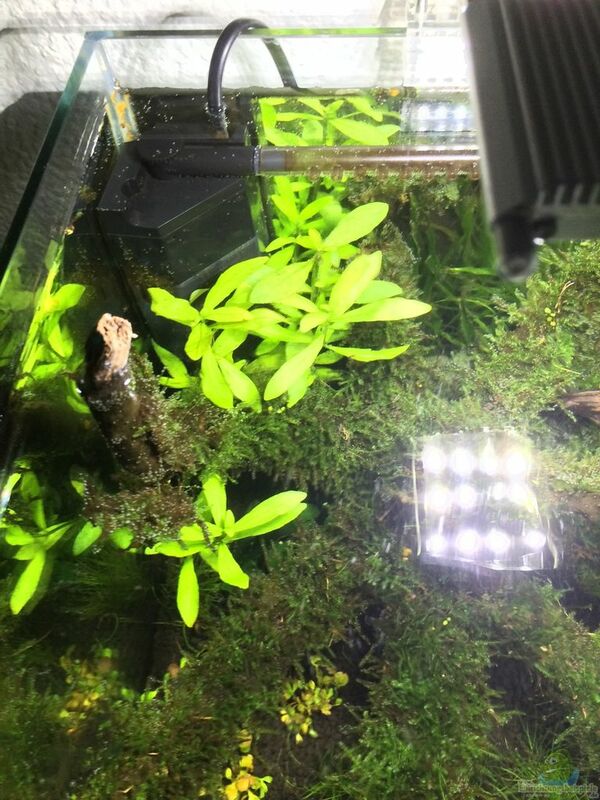 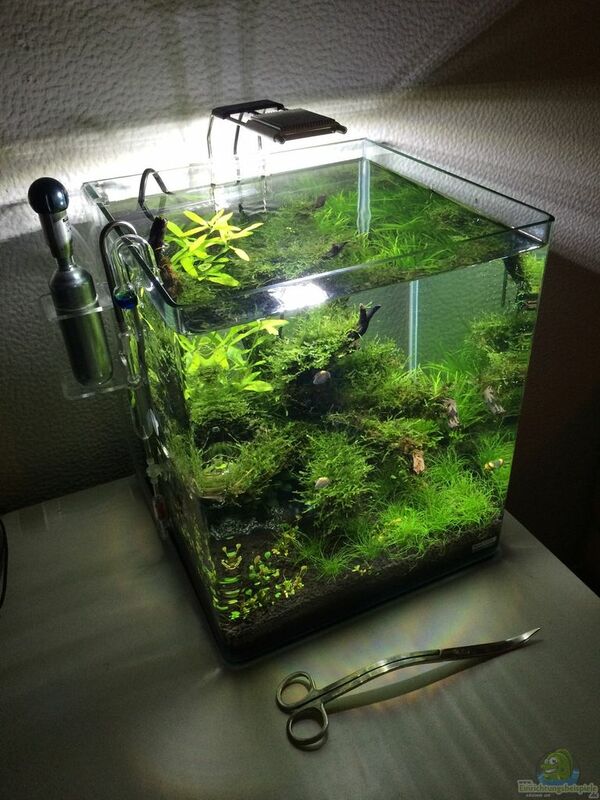 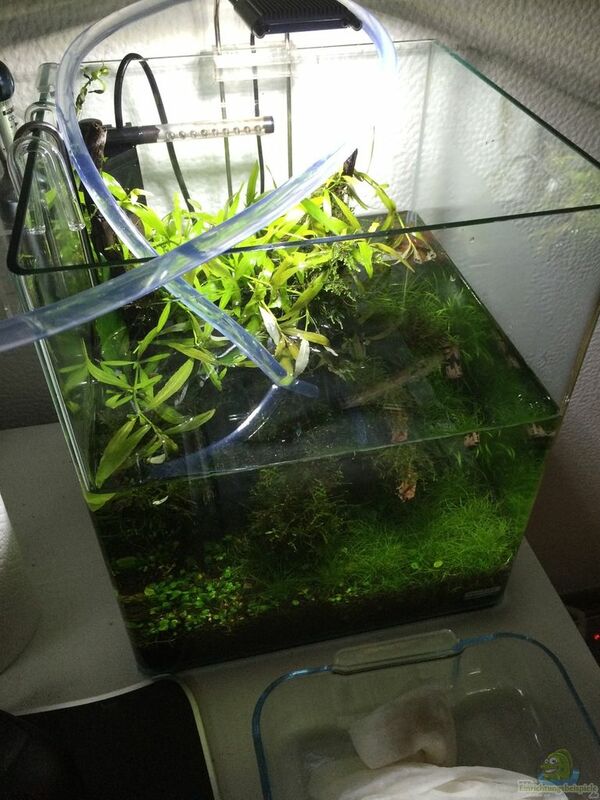 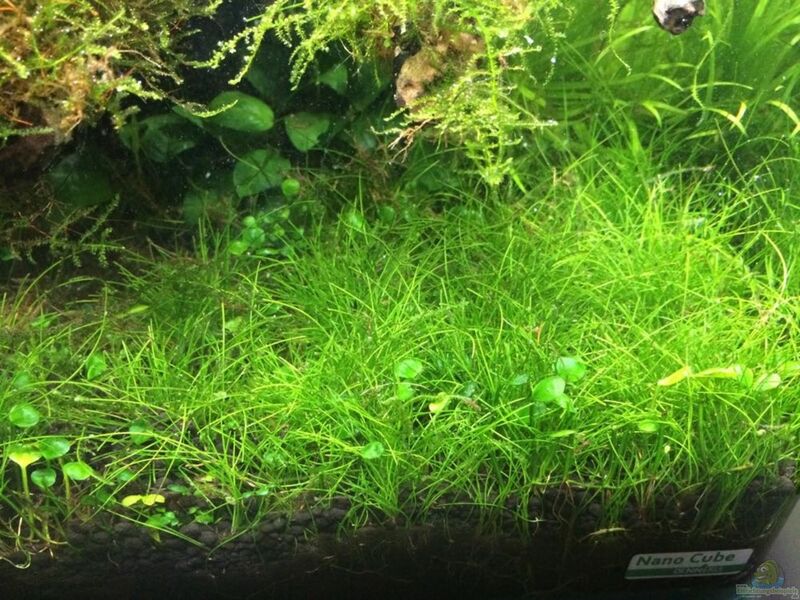 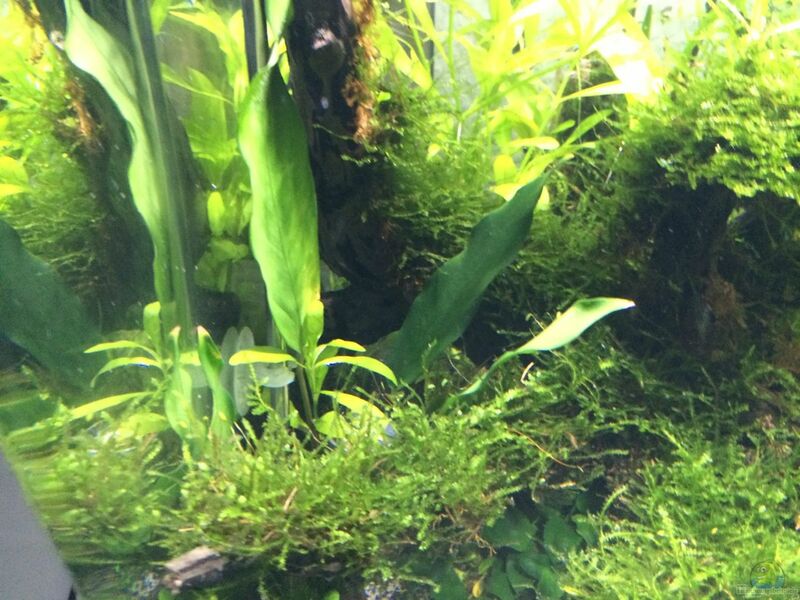 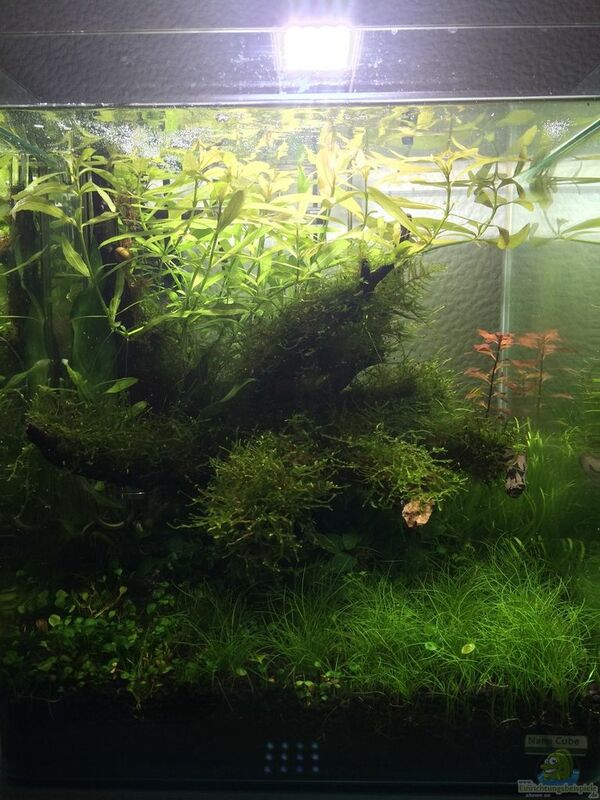 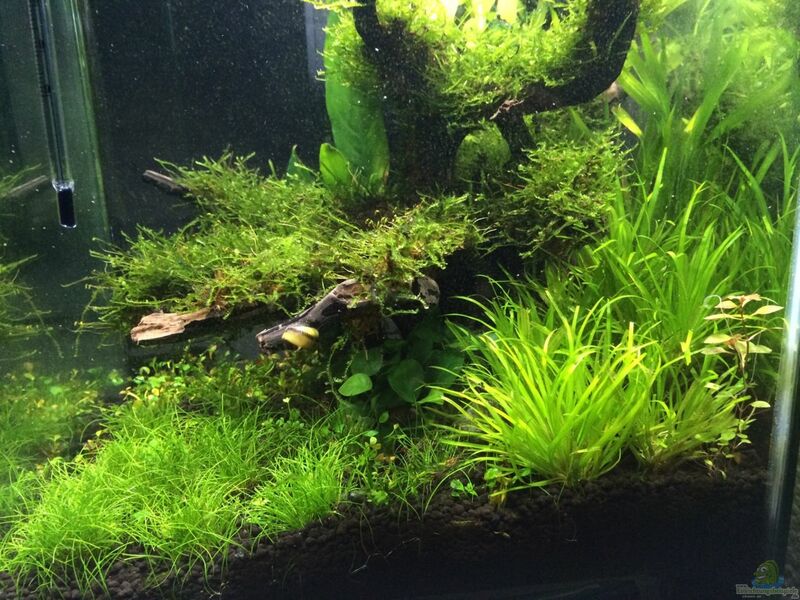 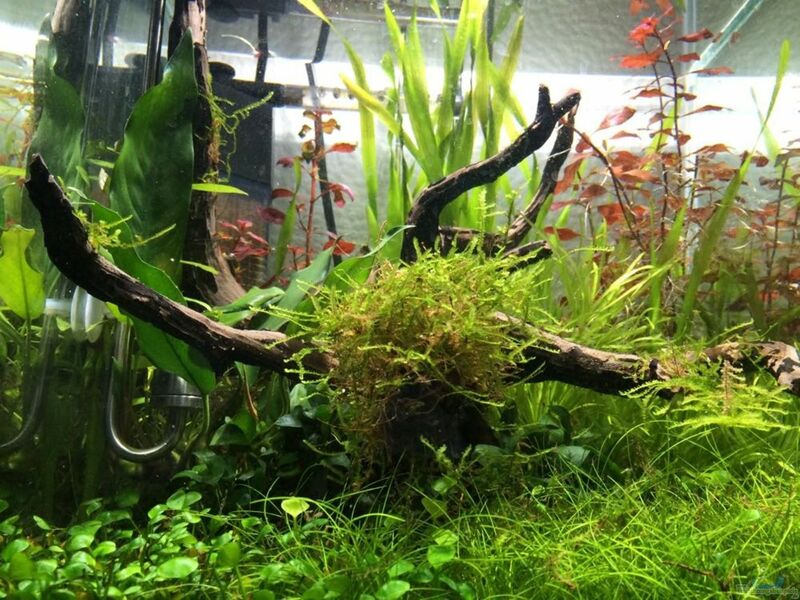 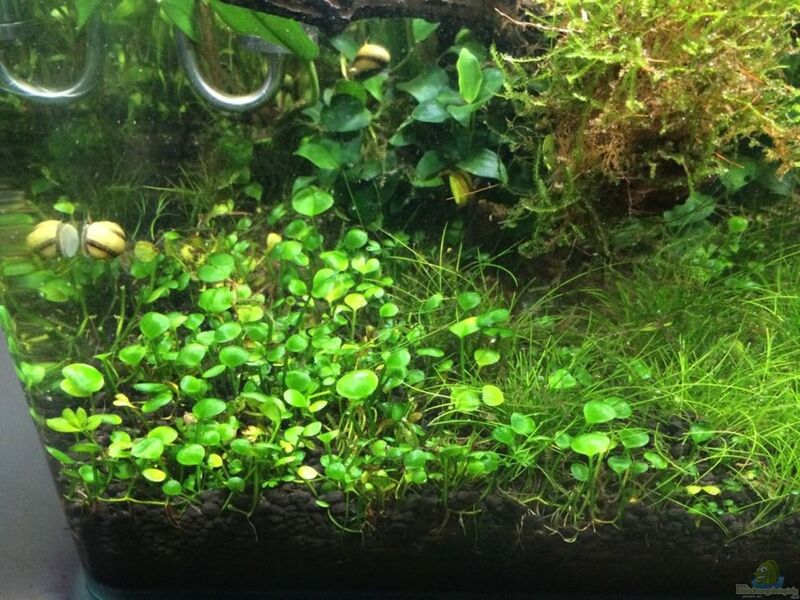 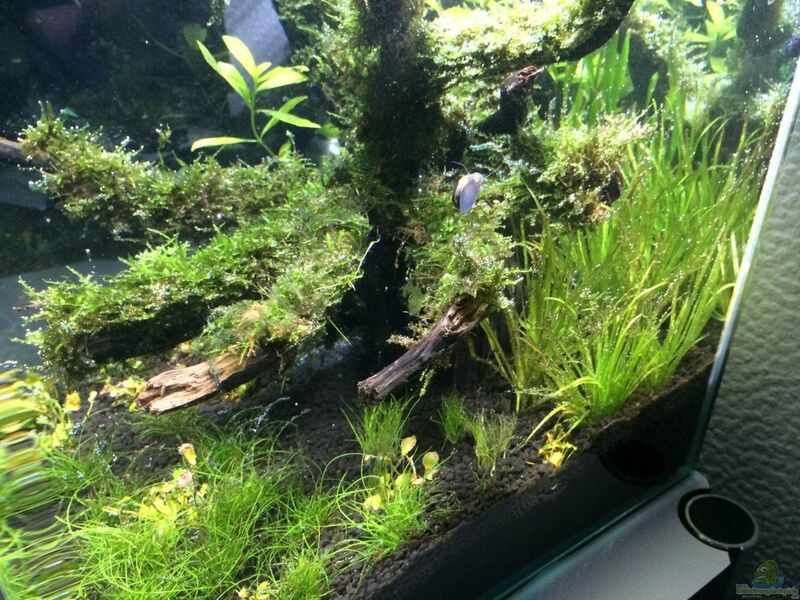 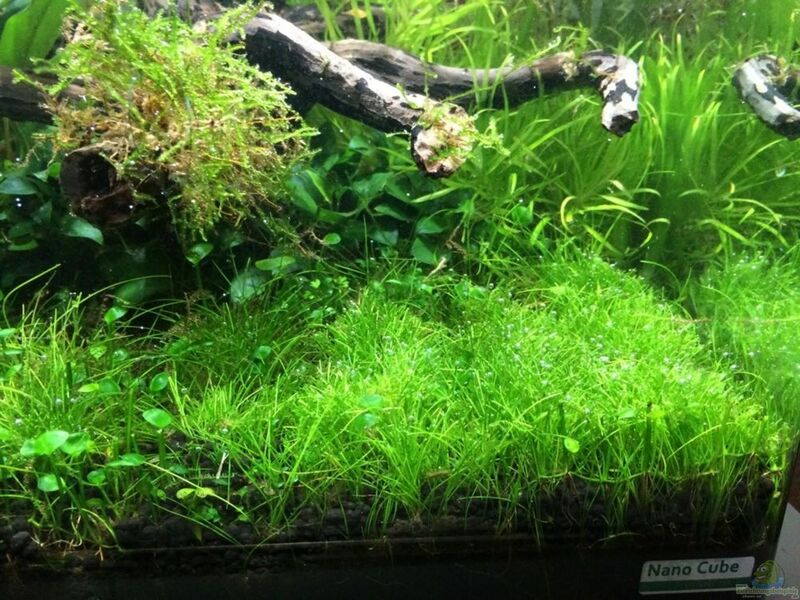 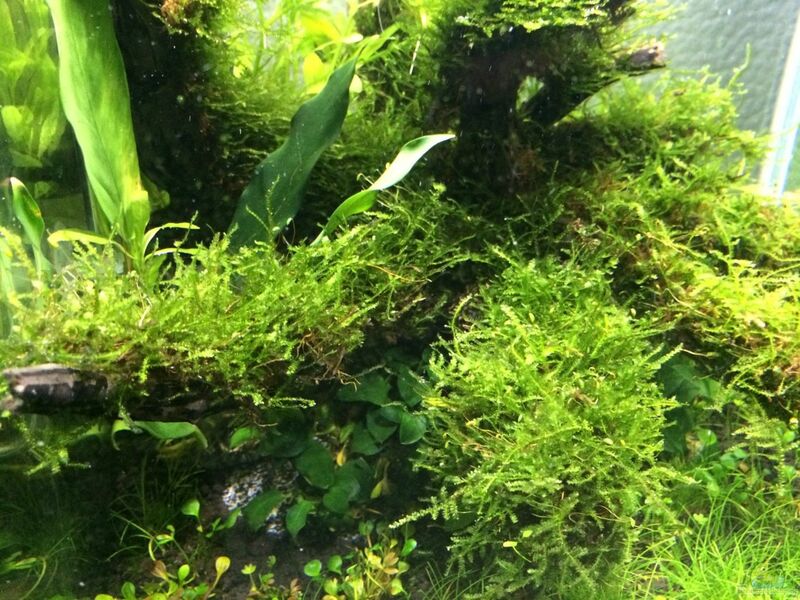 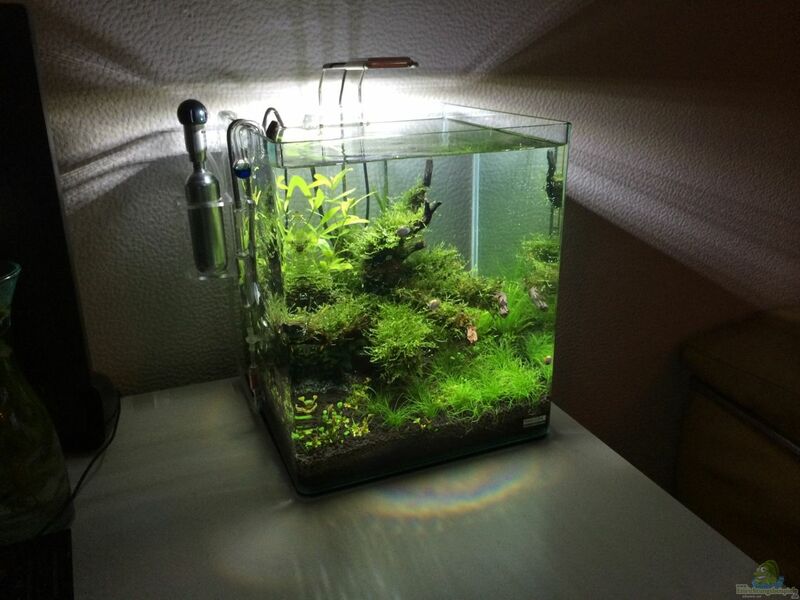 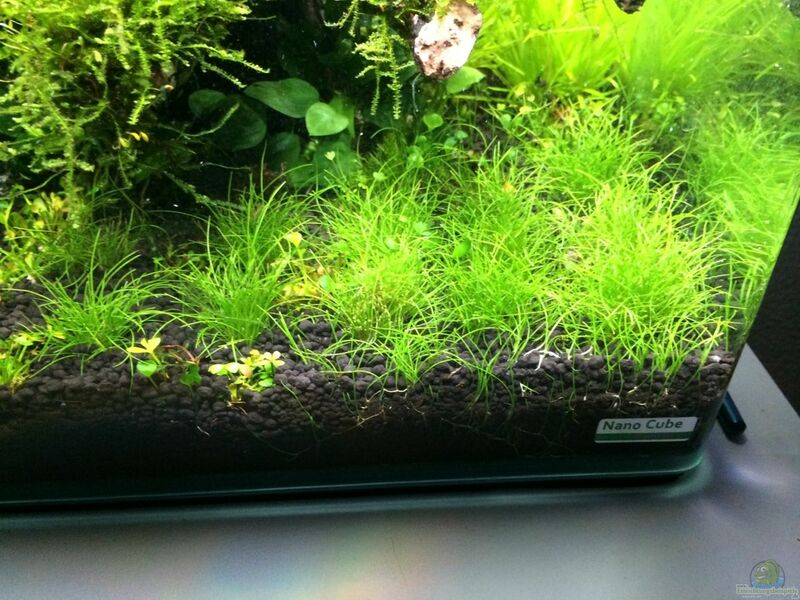 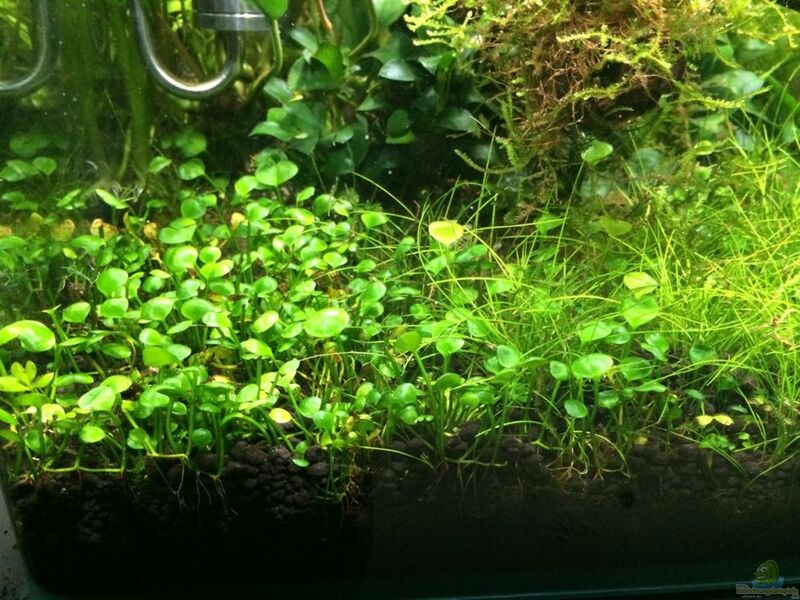 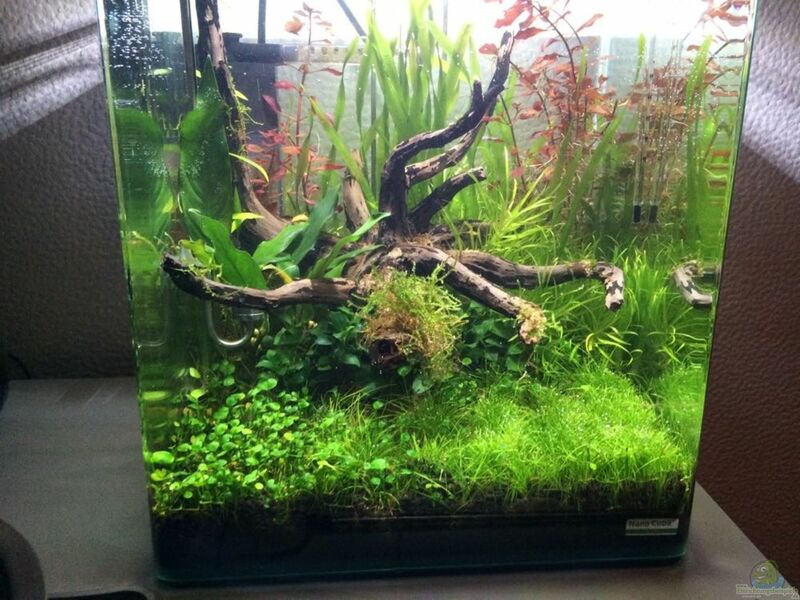 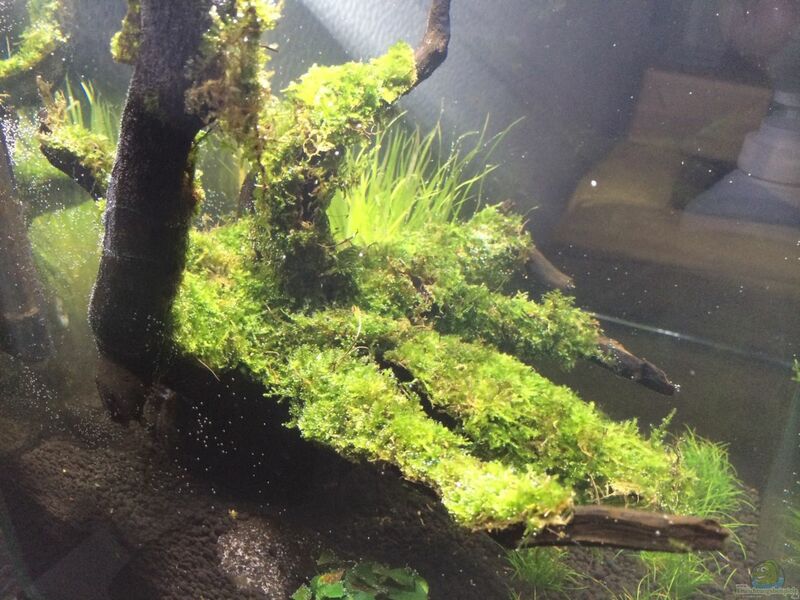 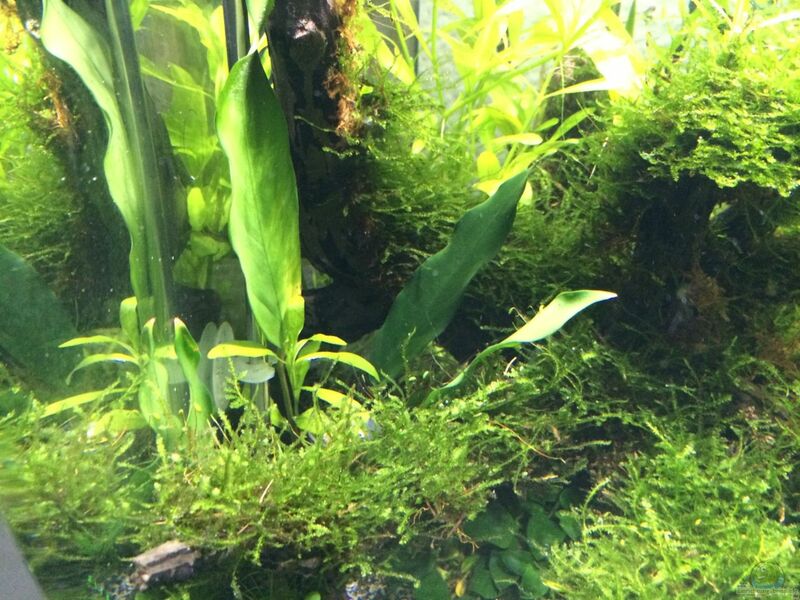 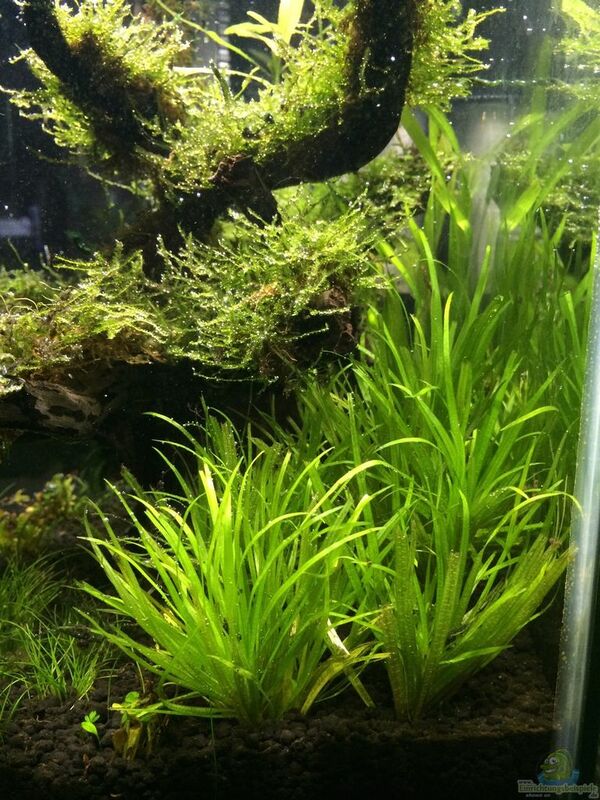 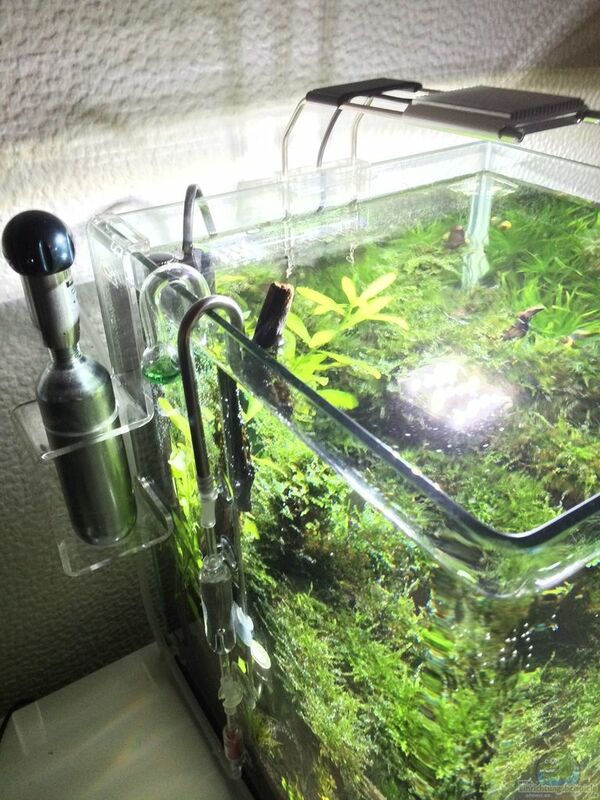 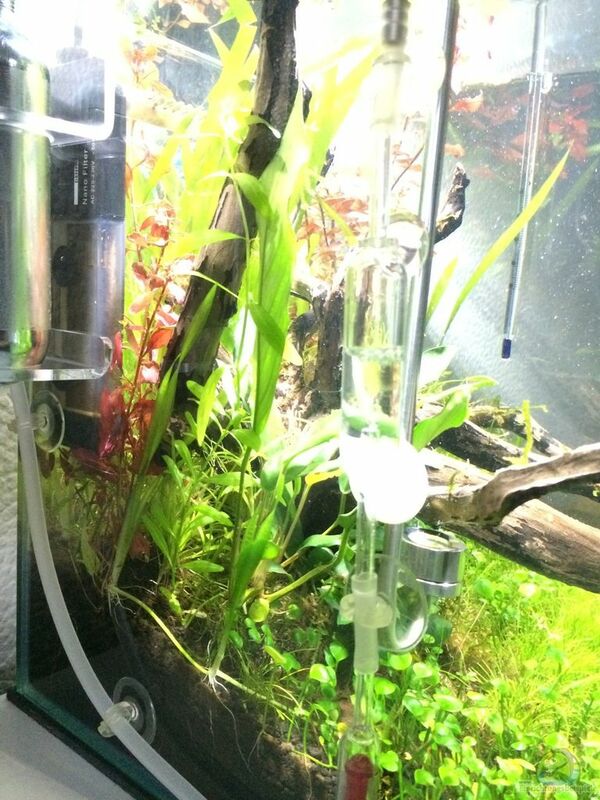 The Indian water friend you have to even cut at the beginning, pretty he is initially not really sure he drives continuously and thus contributes to the stability of the Aquas - gradually I tear it out and let the Valli and the Ludwigia more space. 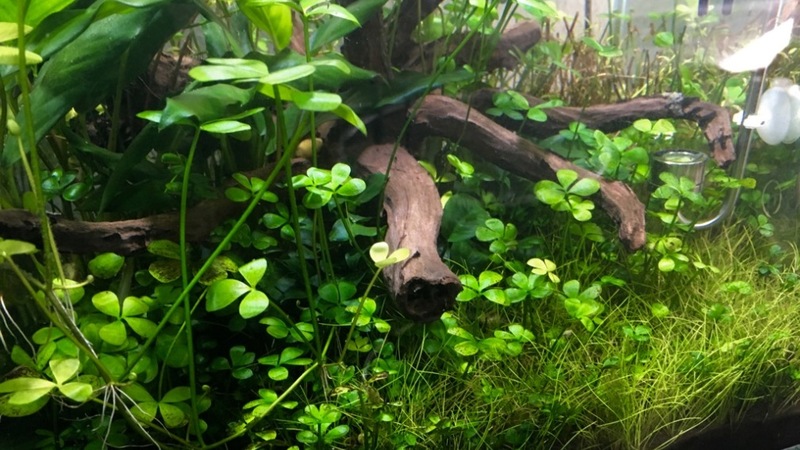 Anubias I sat on the shady places close to the trunk. 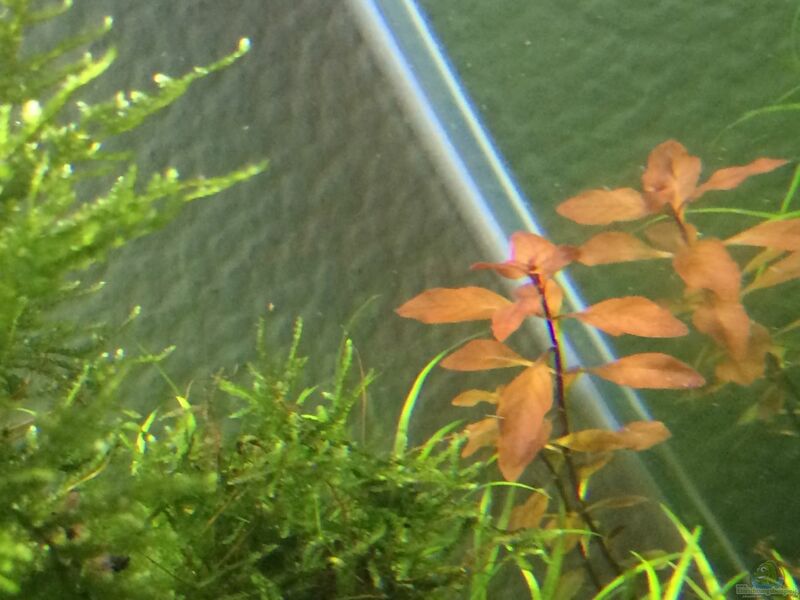 The Ludwigia is a very delicate plant, bringing hope to the red touch. 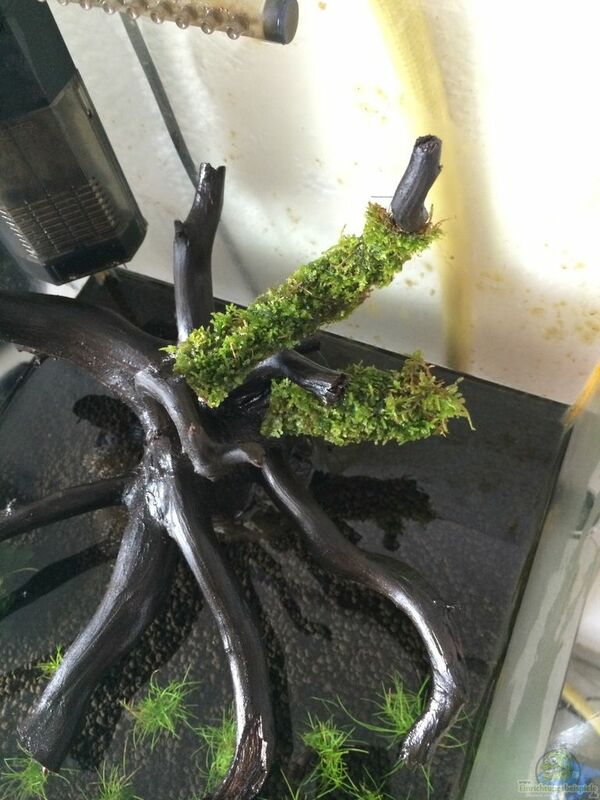 Way too much moss I have gradually removed and leave only from and thrive in the offshoots that are in it remained - the root is visible again. 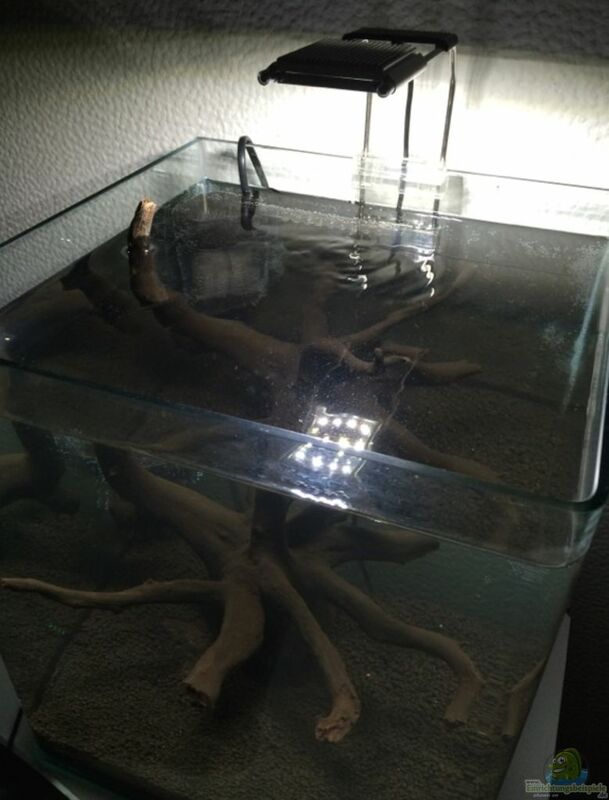 Important to me was that there is a root at a time. 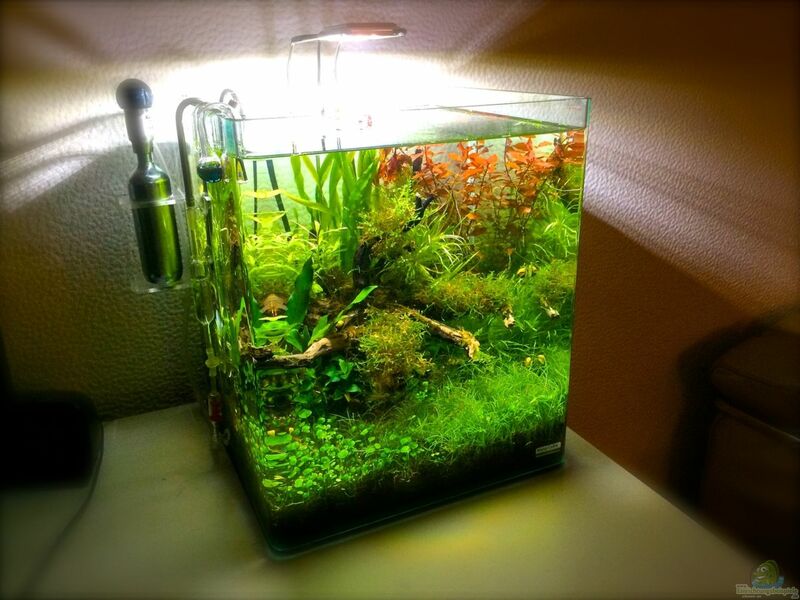 This is apparent in the design later. 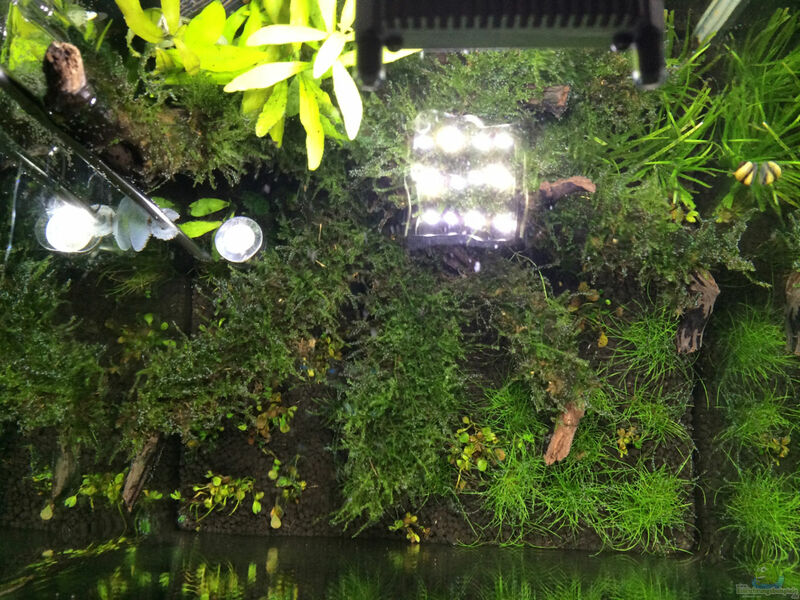 If you will be charged the wattage on the 31 liters 9 Watt LED and more recommended. 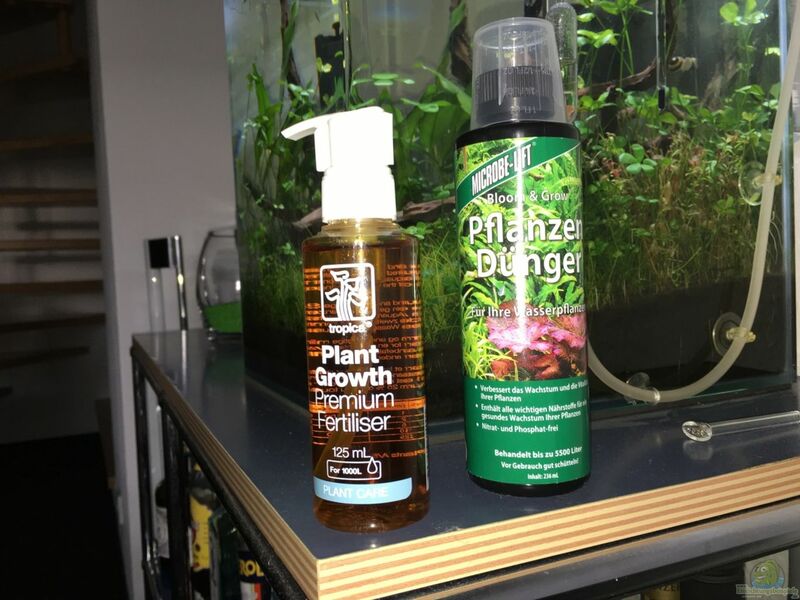 But I hope by choosing plants that first works that way. 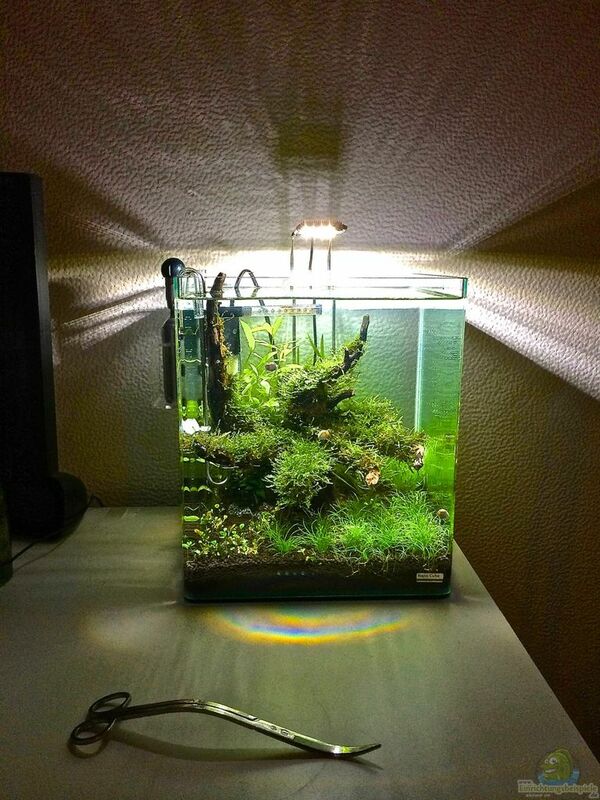 Maybe I'll build me once a LED lamp itself, have very cool DIY instructions found. 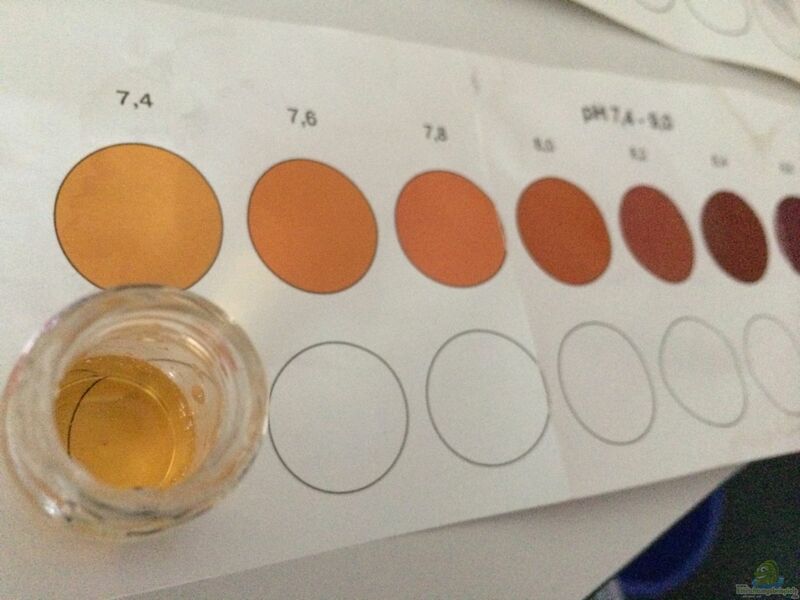 Alternatively again a NanoLED. 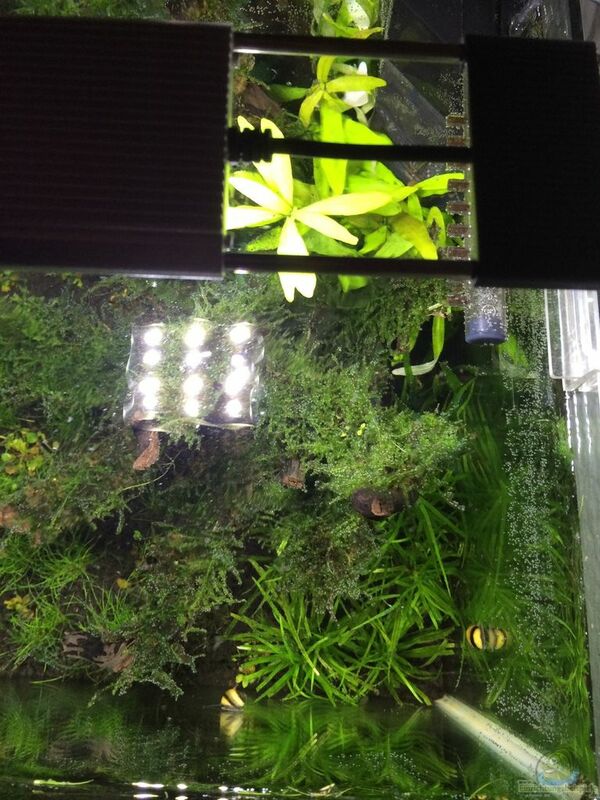 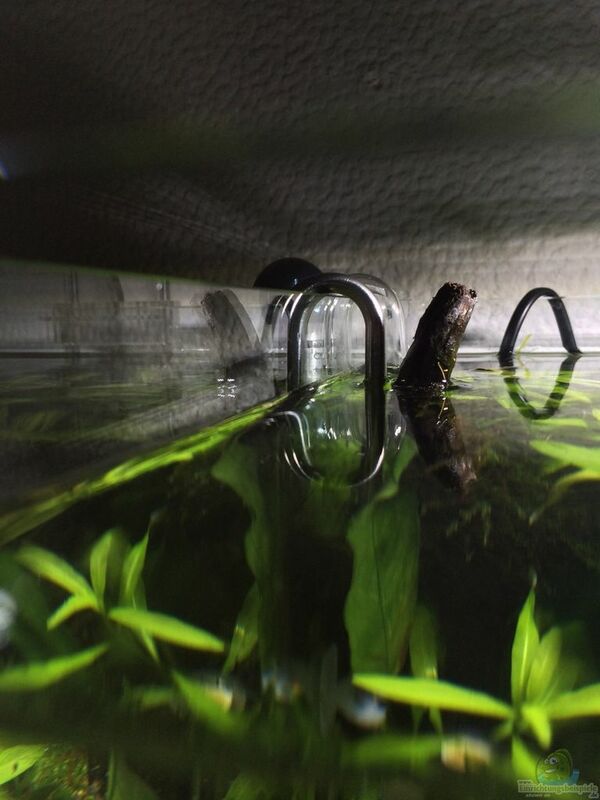 The aquarium is operated without a shield, thus hopefully more light comes into the pool. 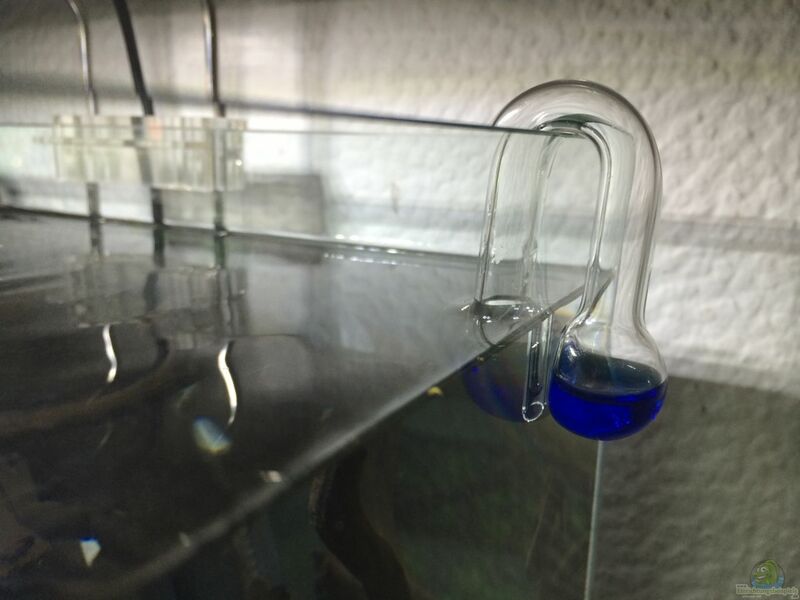 Since currently only 4 screws are in it, and also about 99% never get fish in the tank, the size of the filter is actually degree matter. 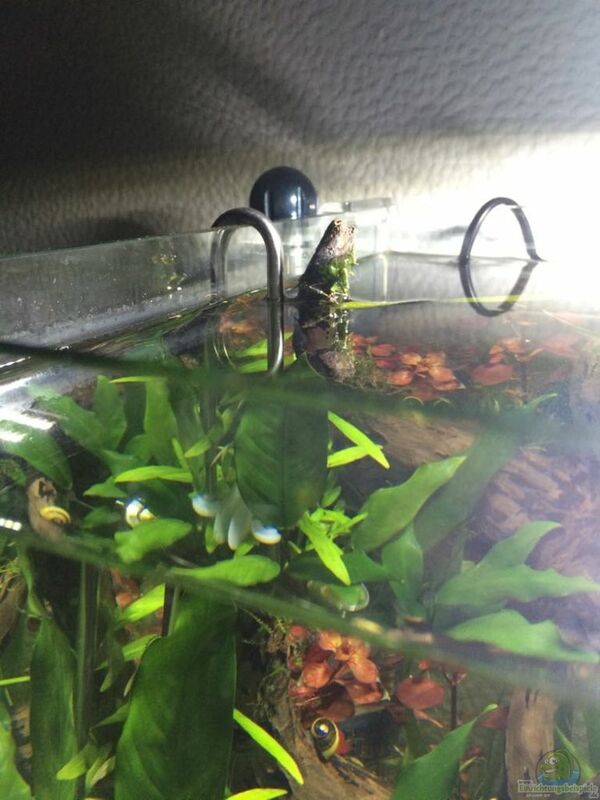 He is basically just to move the water. 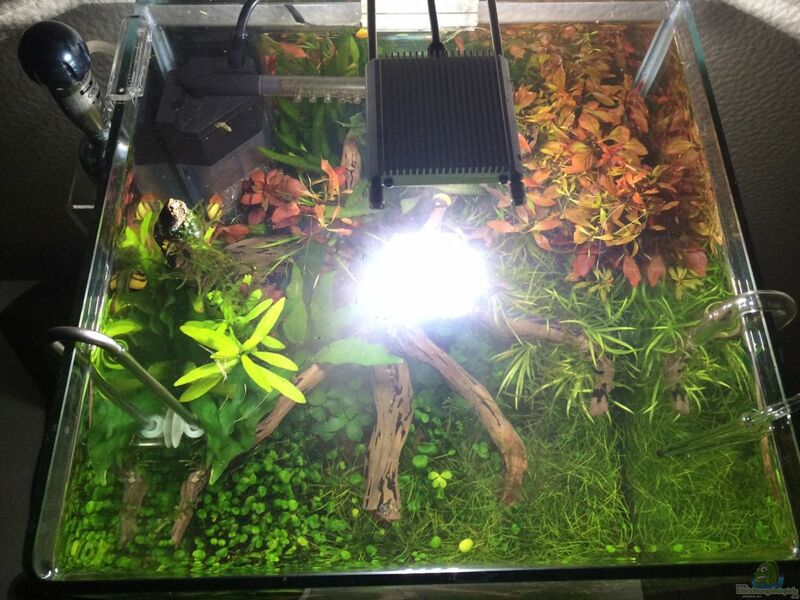 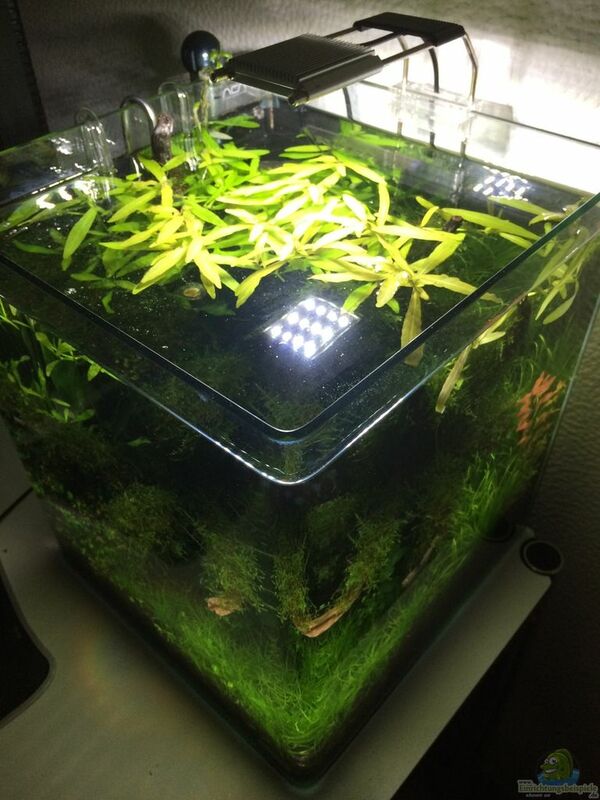 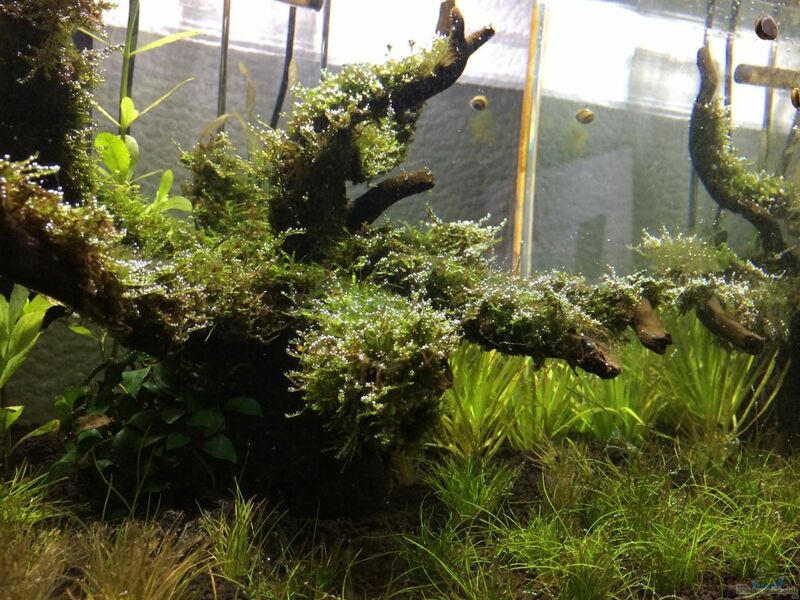 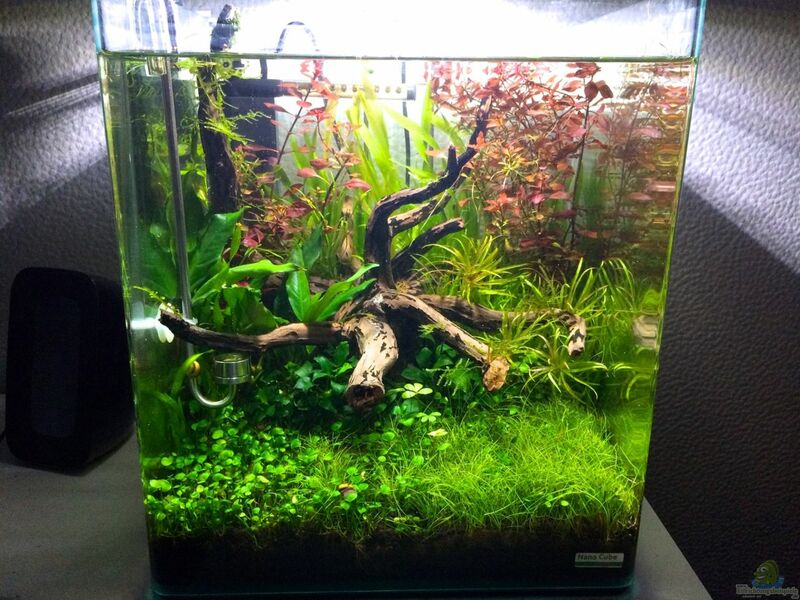 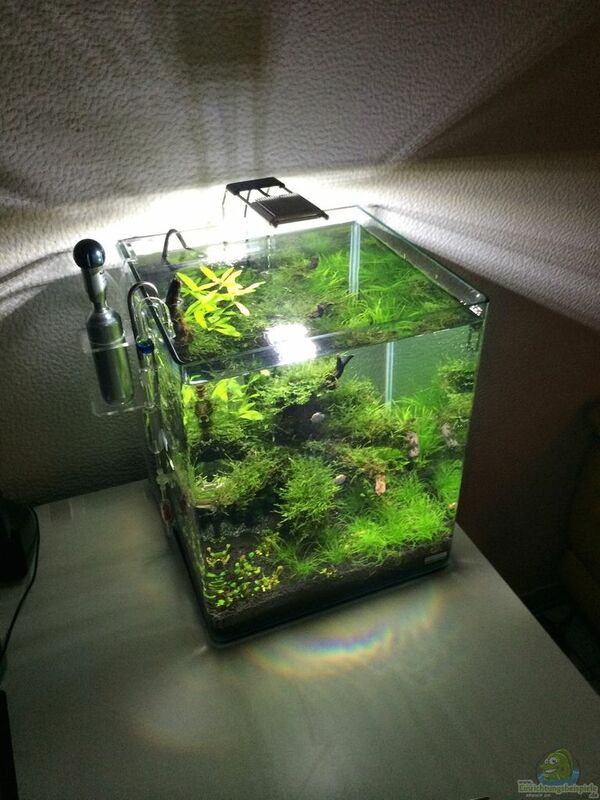 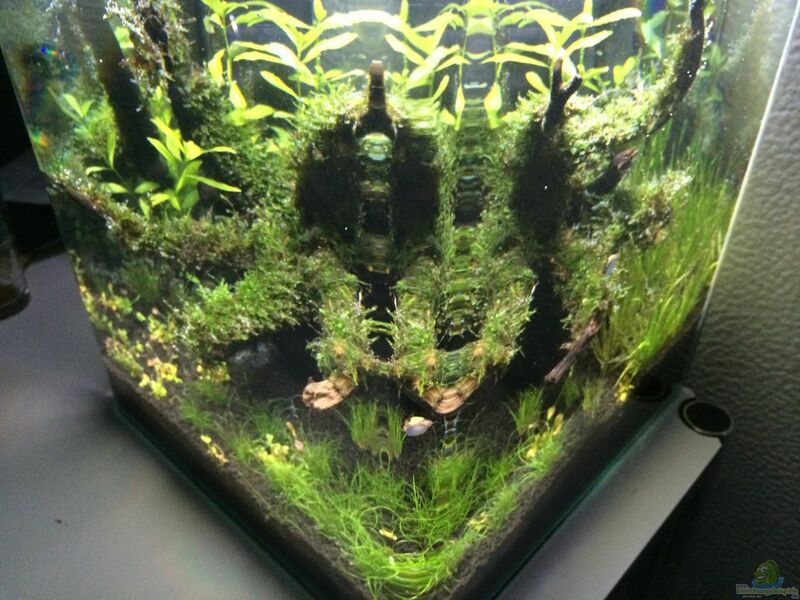 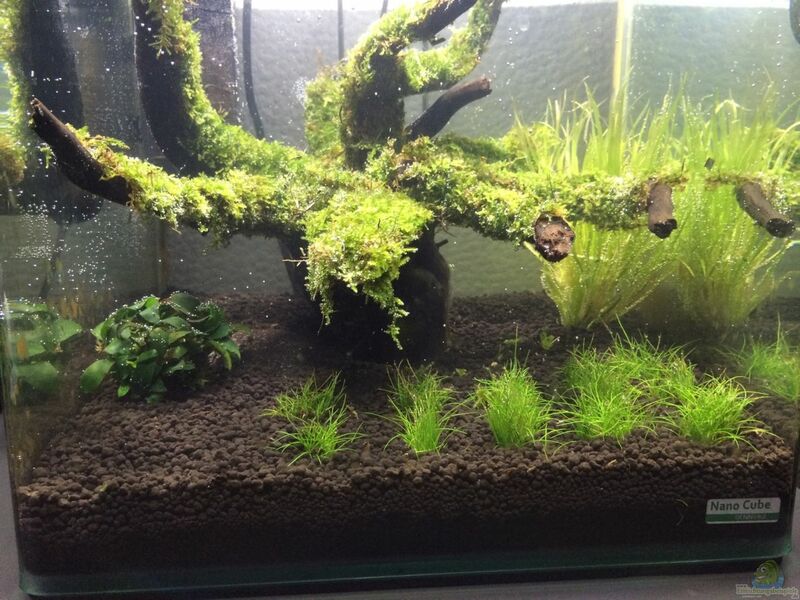 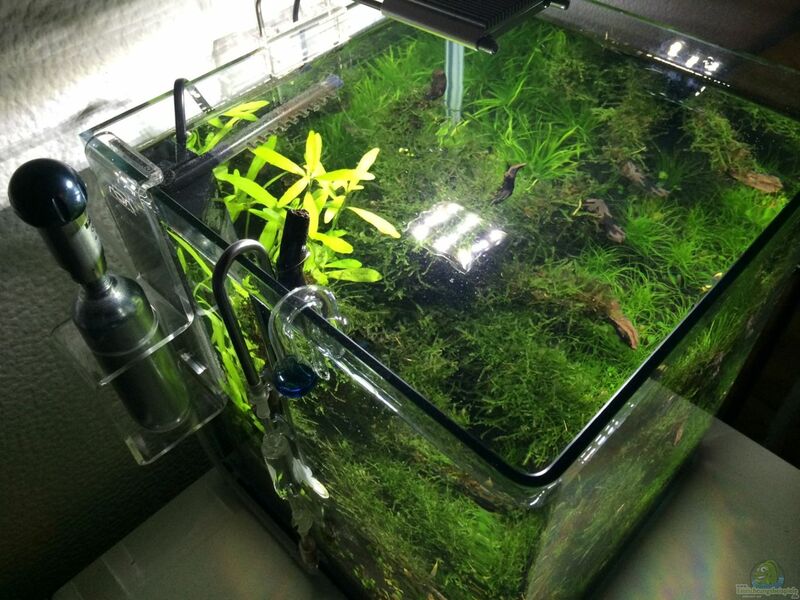 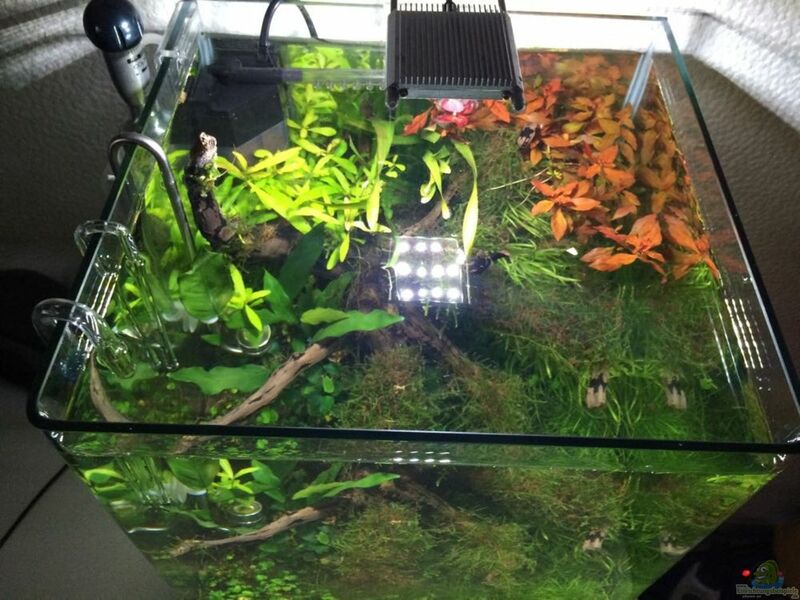 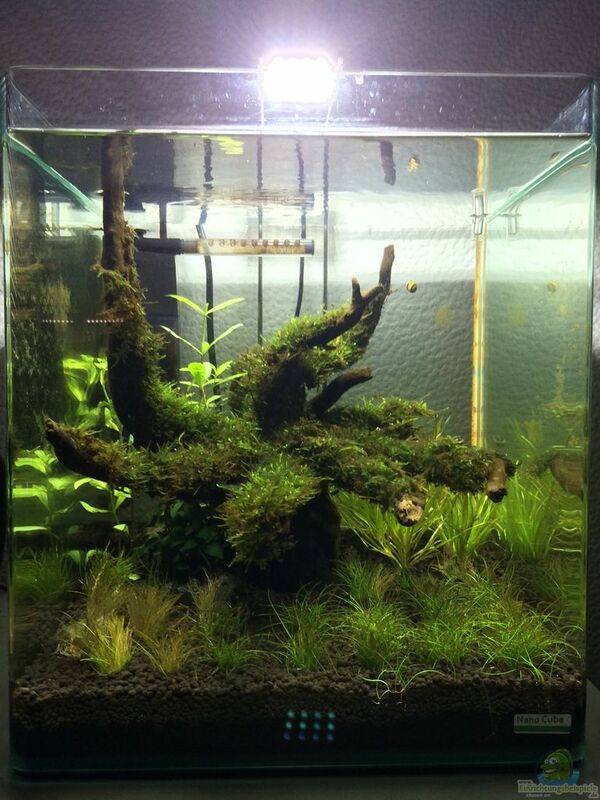 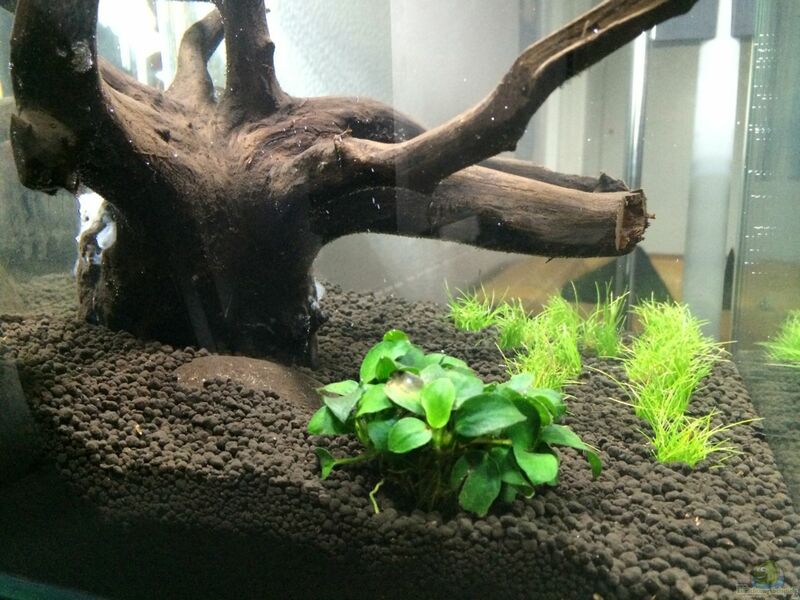 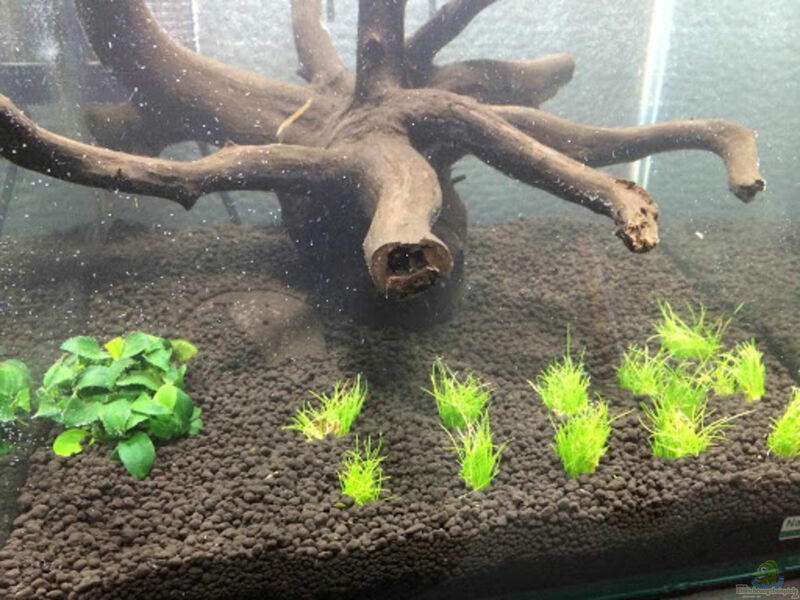 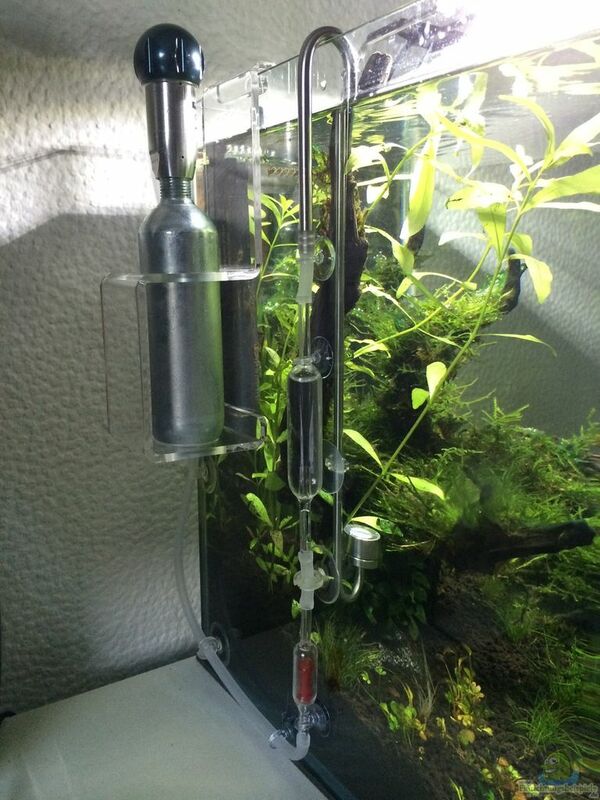 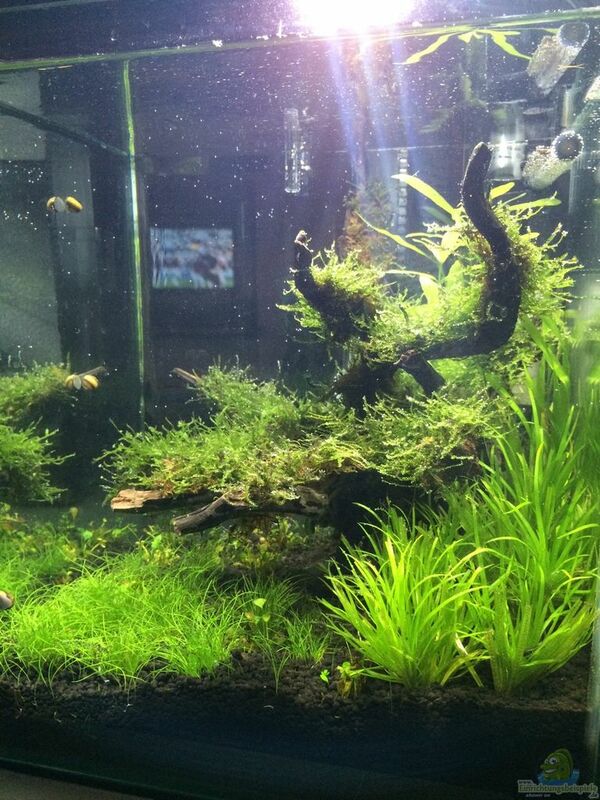 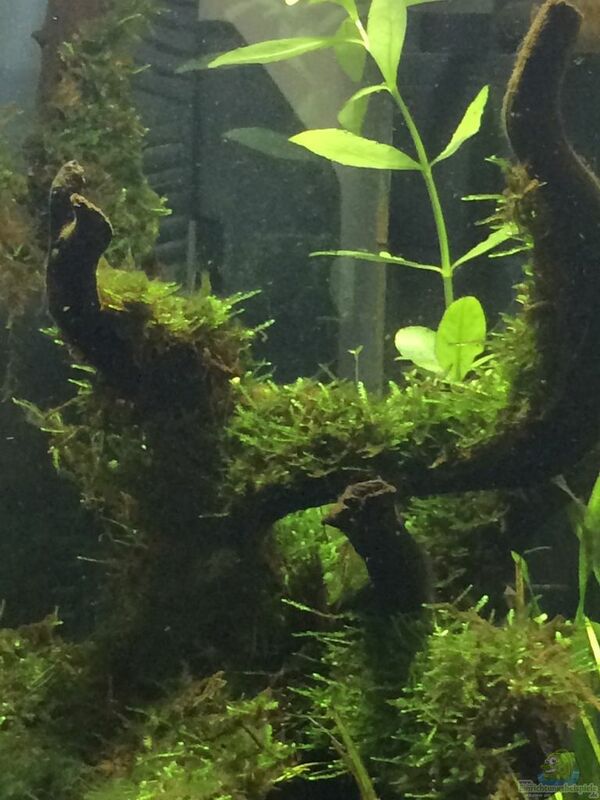 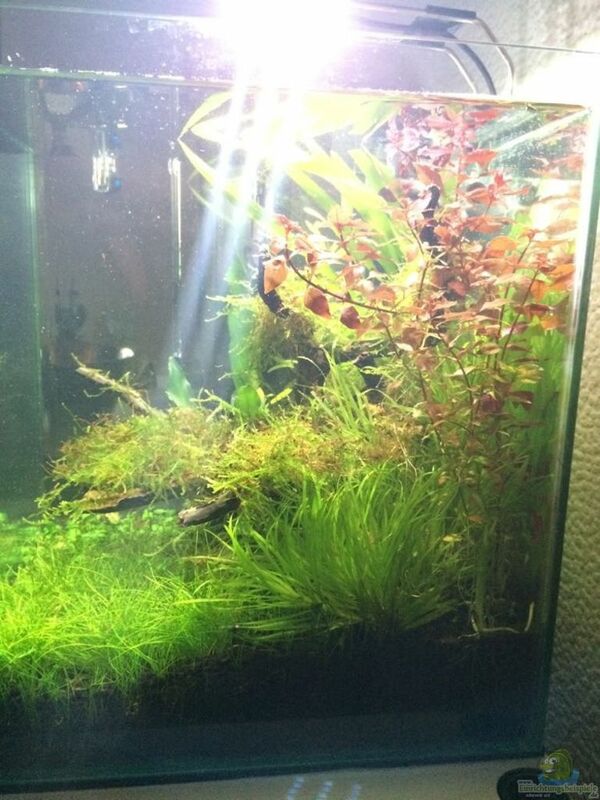 Currently you have eh every 6 days a water change make to remove the pollutants and the unused fertilizer. 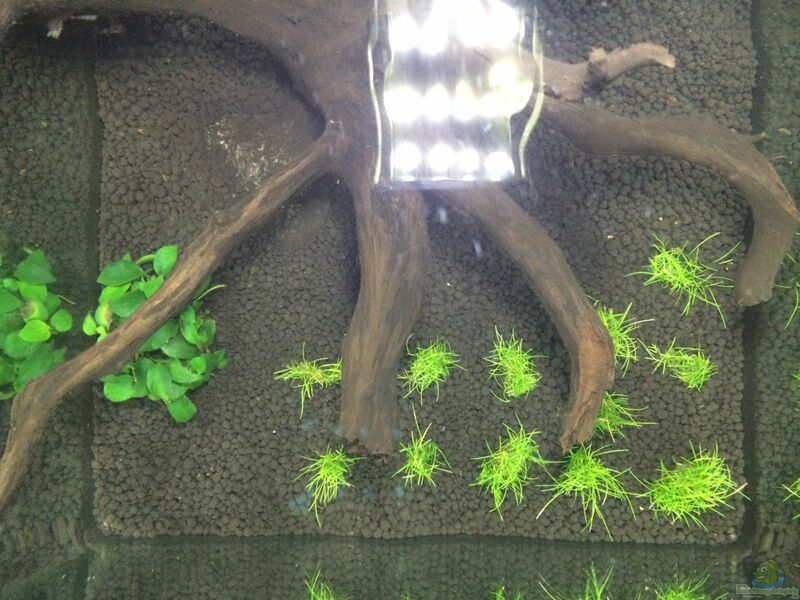 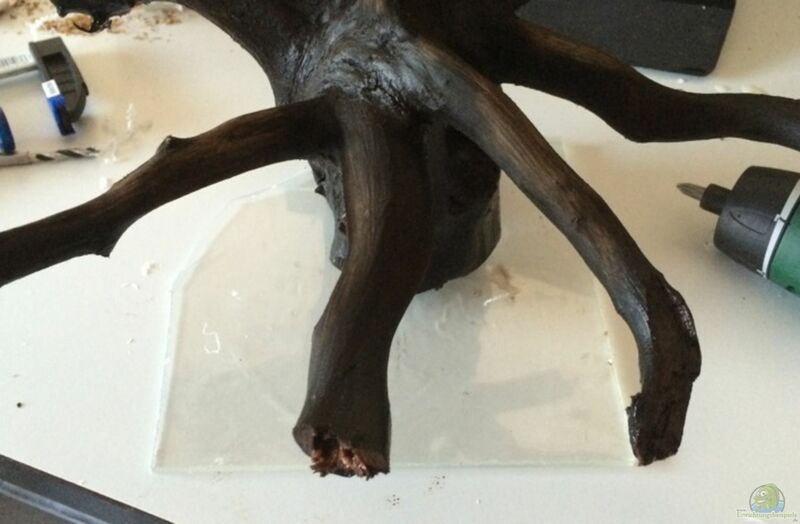 Due to the large roots and the soil, you can smell the beginning, when you are near the water surface. 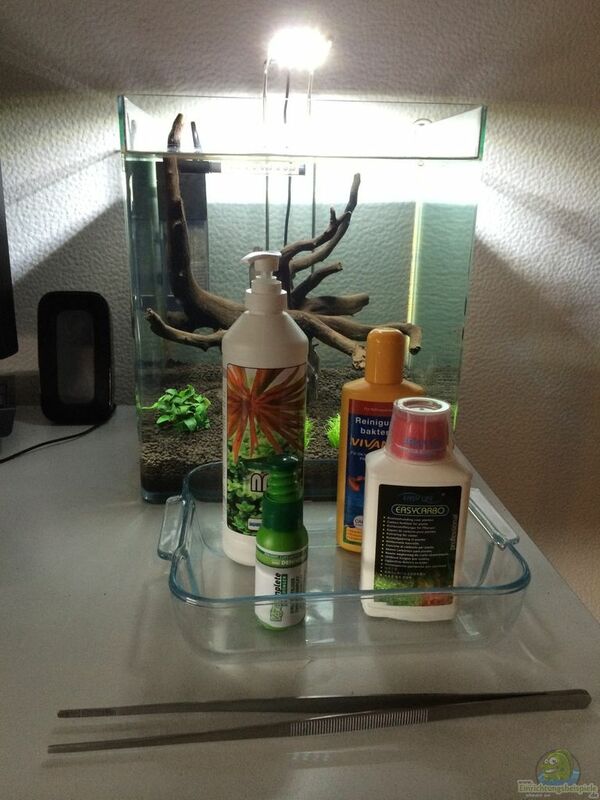 After 3 months, everything smelled fresh and healthy. 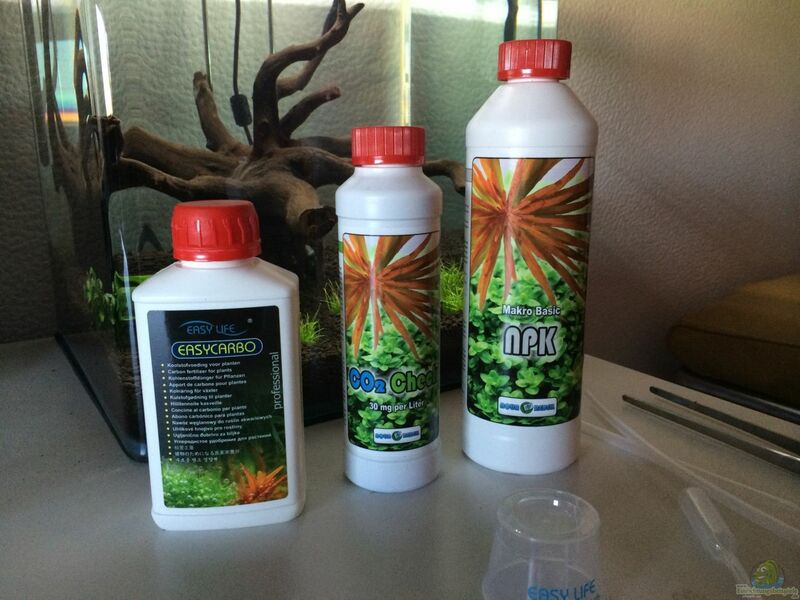 The fertilizer rhythm results from the water change, I stir the water for a week or less and fertilizing nachh only after with NPK. 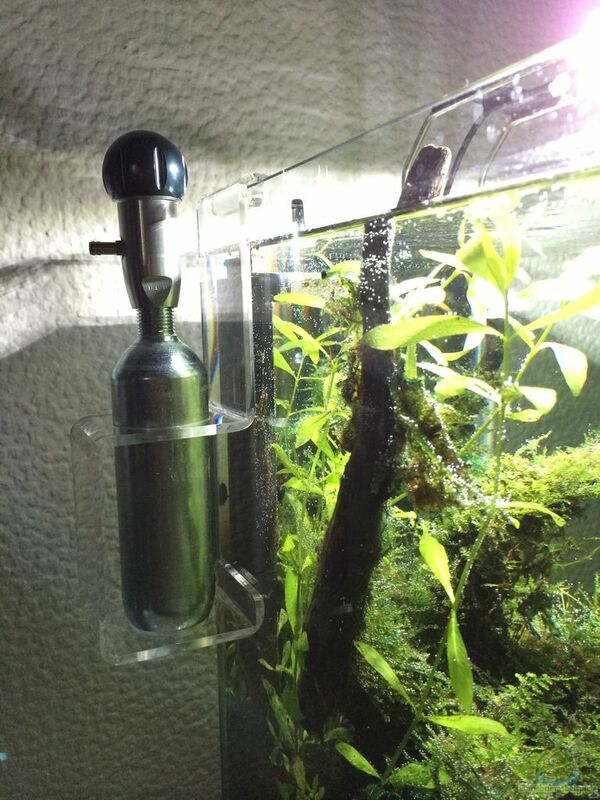 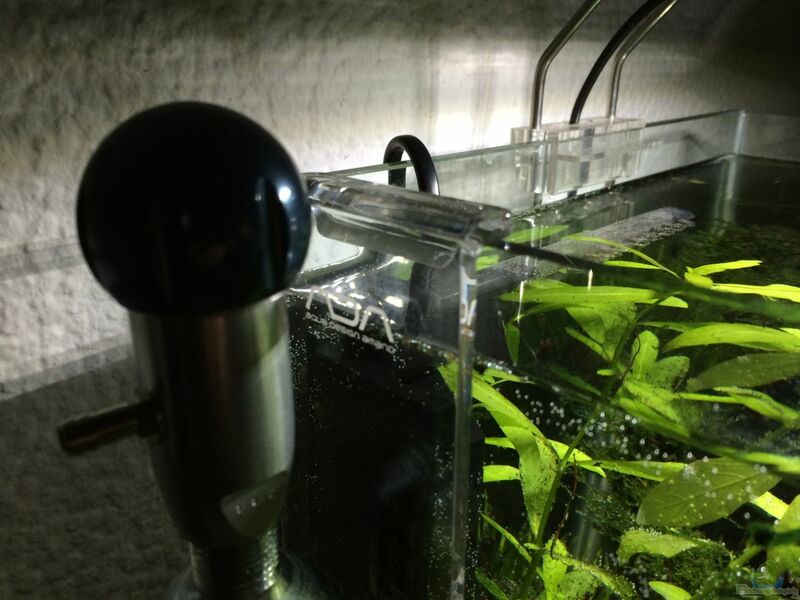 In my Malawi Aqua I was used to that maximum surface movement is good enough - to get as much as possible of oxygen in the tank - thereby but is also Co2 expelled from the water, which of course is a disadvantage when using a CO2 system. 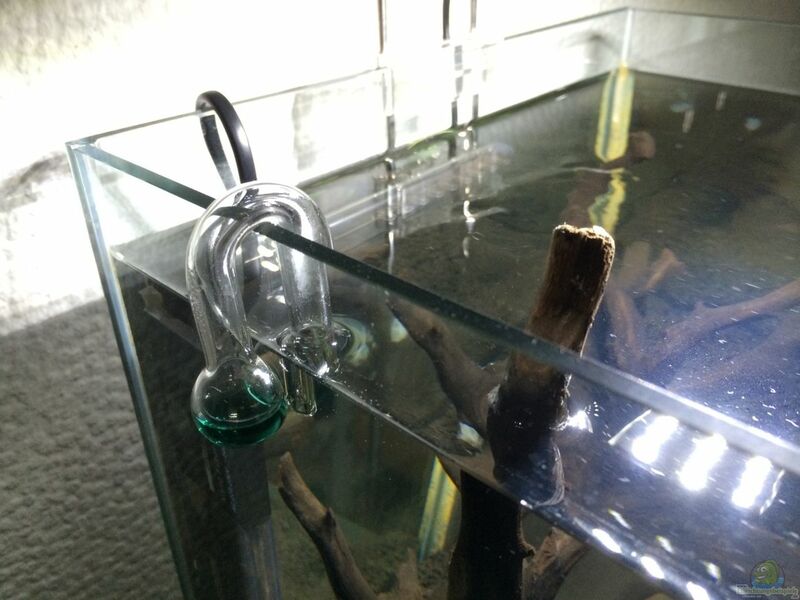 Here it is important to find the middle ground precisely in order to have just a bit of surface movement. 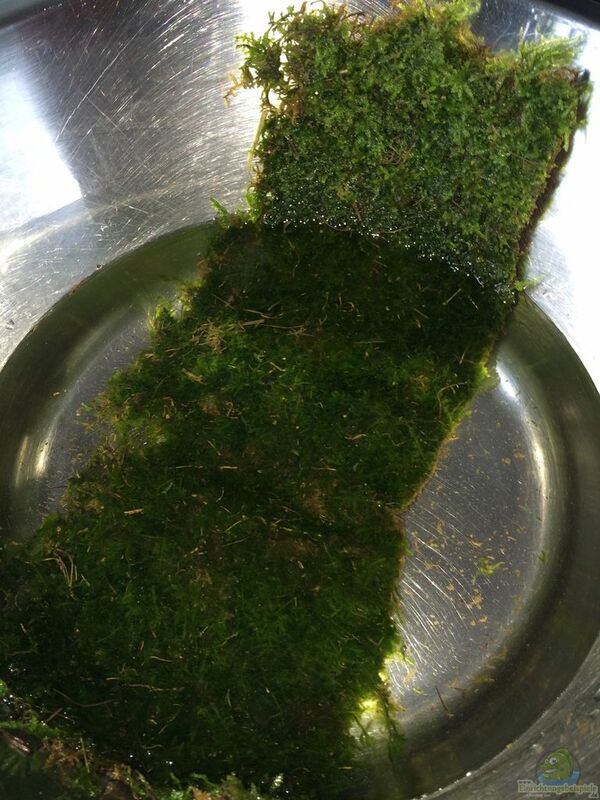 The scum I remove regularly with kitchen towels. 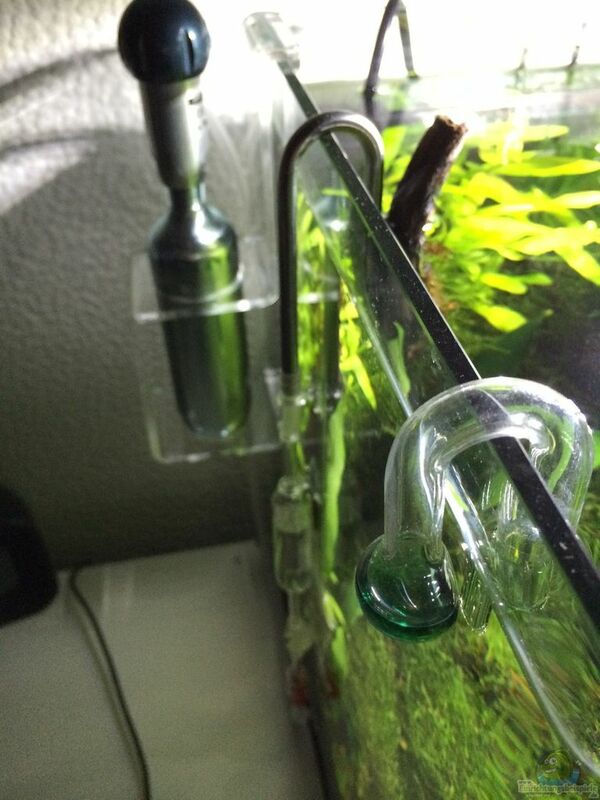 Co2 Checker hanging over the edge of the pool I find the effect skilful because it operates without suction cup. 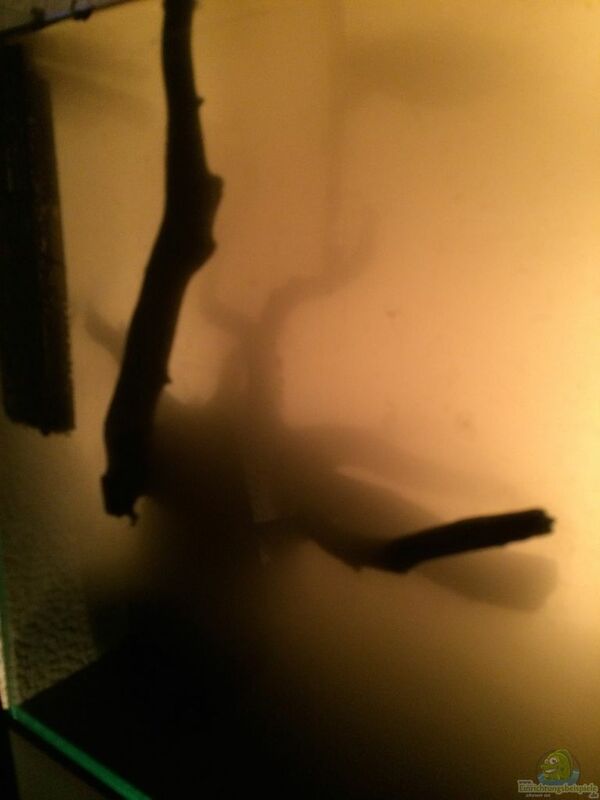 Suckers dissolve with me just now and then, or you miss the day where you would have a new to buy. 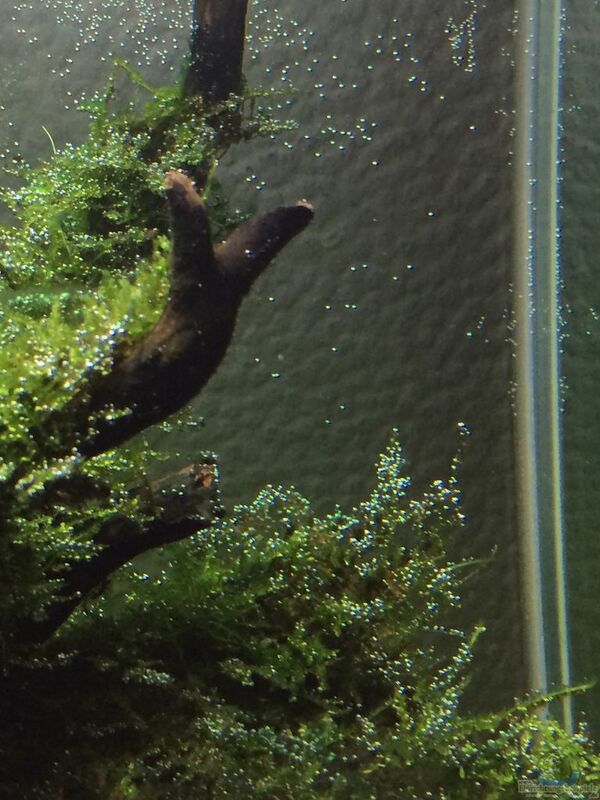 Then the checker is down there in the thicket. 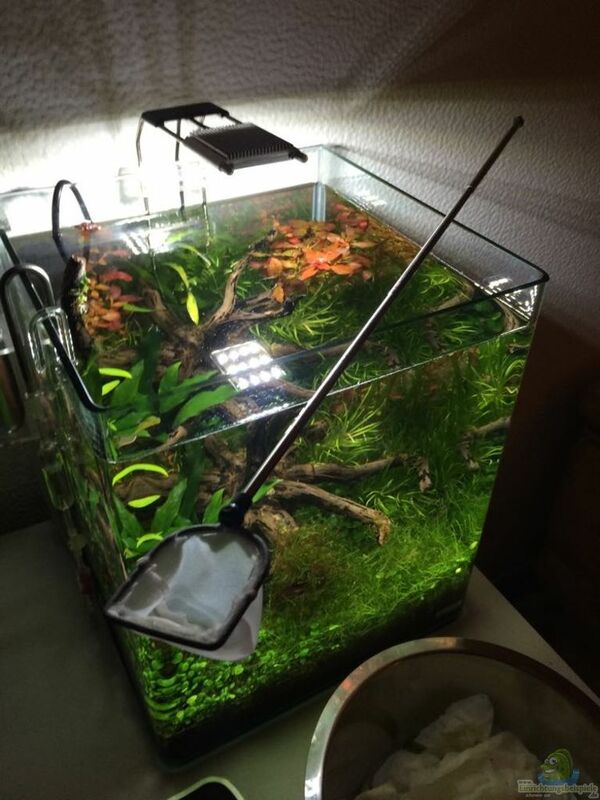 In addition, as a hanging checker is also an eye-catcher. 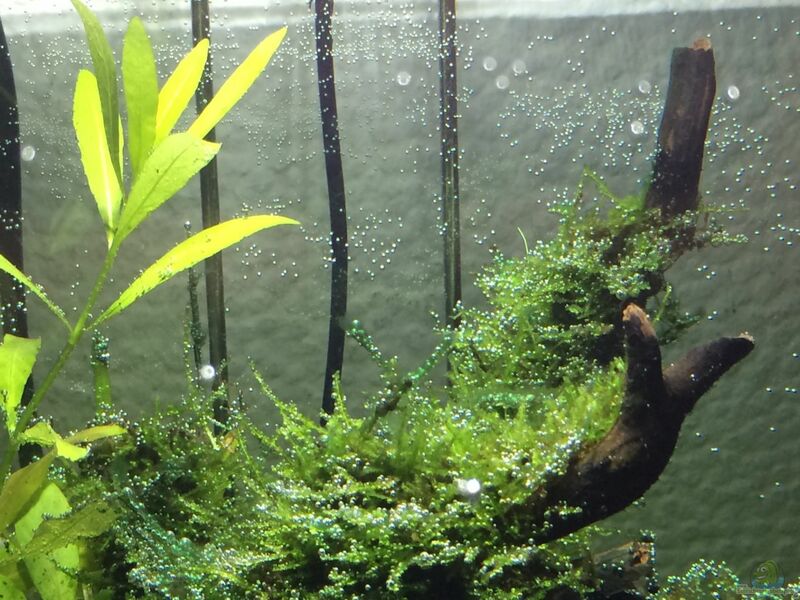 Disadvantage is quite clear when enough water in Aqua, then it hangs above the water surface. 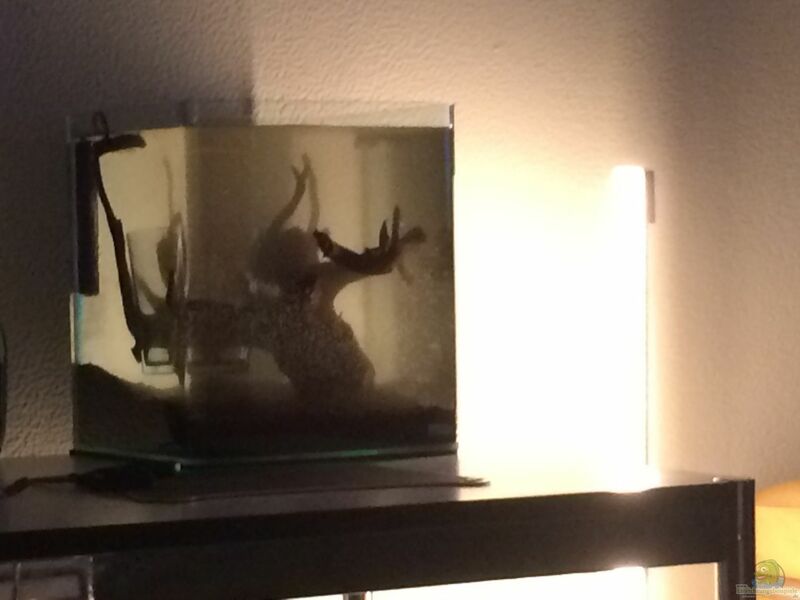 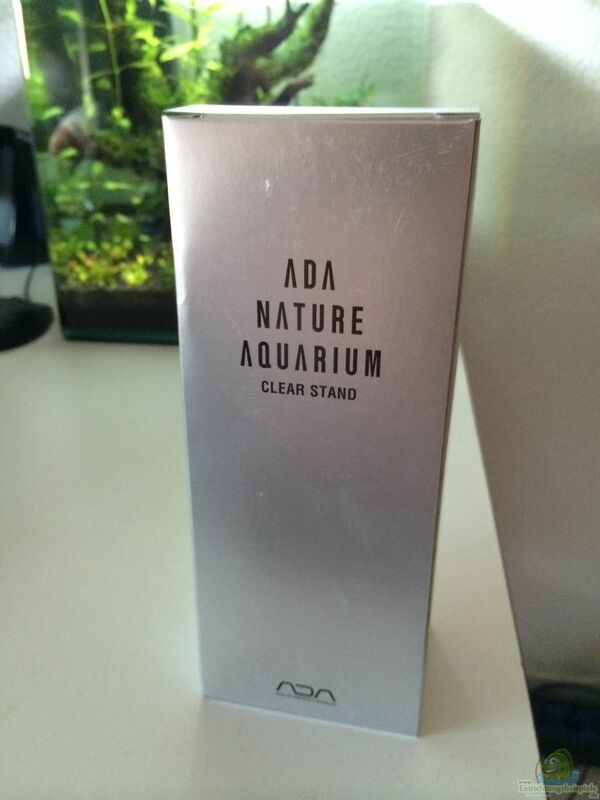 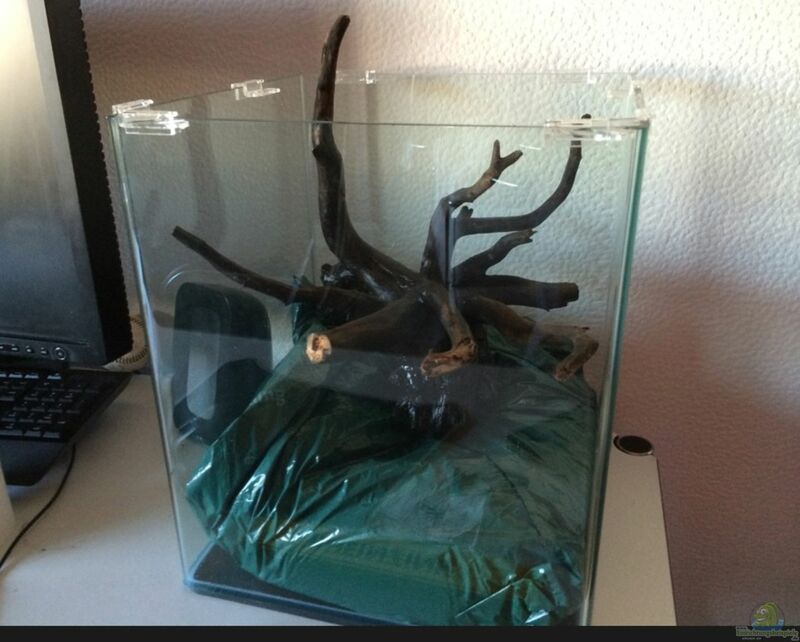 For antlers snails I decided because they keep the aquarium clean even in difficult places. 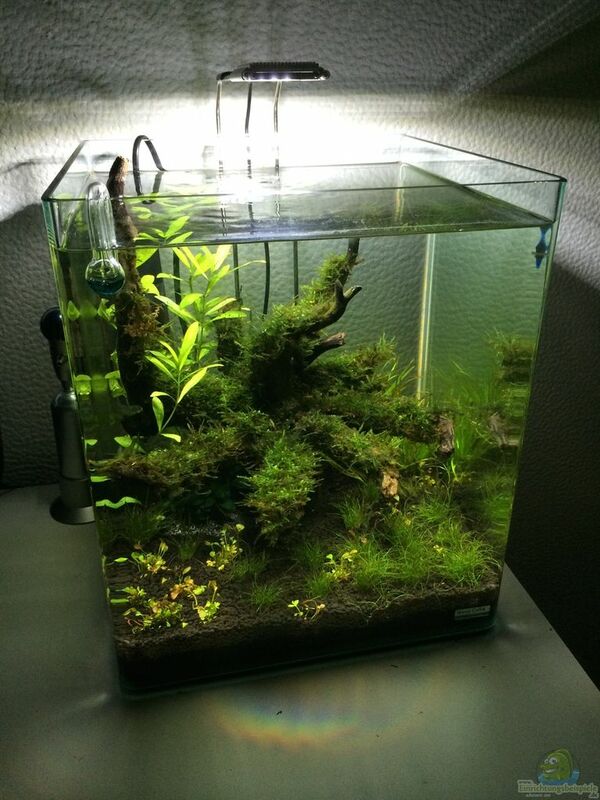 Nice and small and a good counterattack color to green. 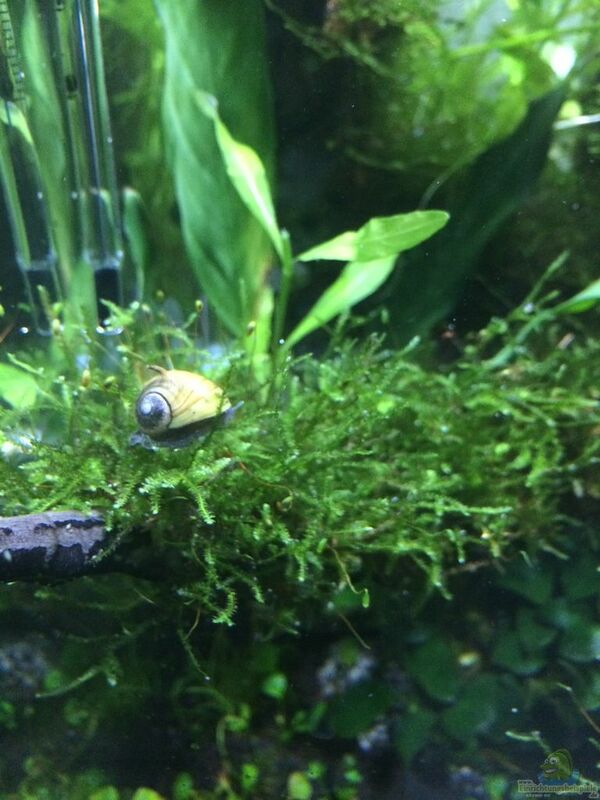 Rum driving under moss. 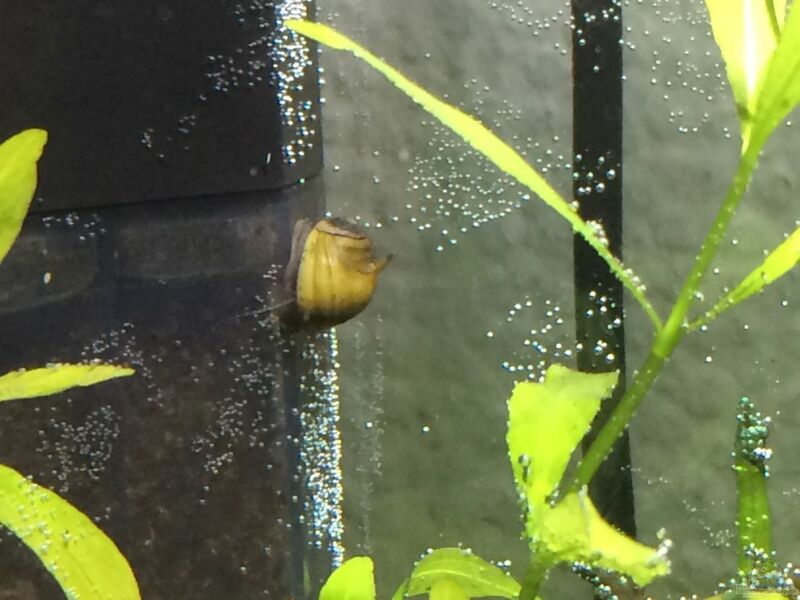 You can watch the snails grow. 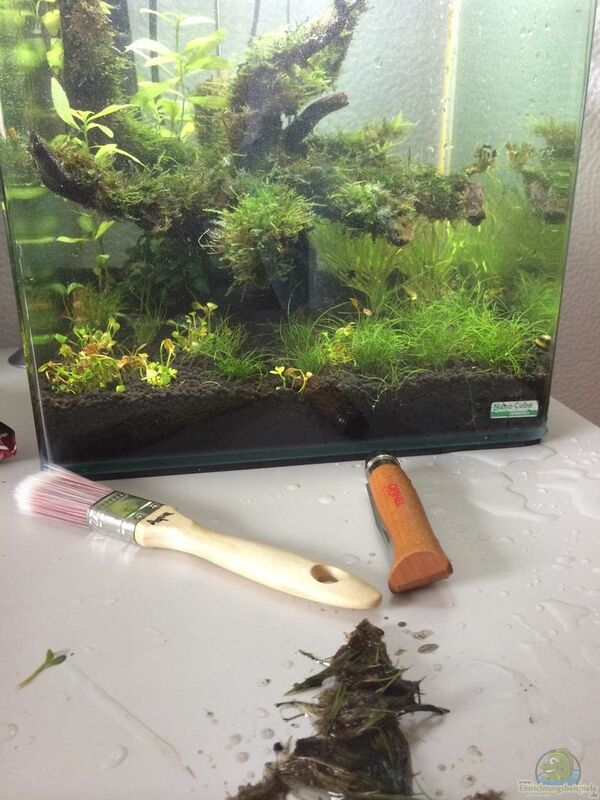 Cleaning the disc is unnecessary even after 5 months almost completely. 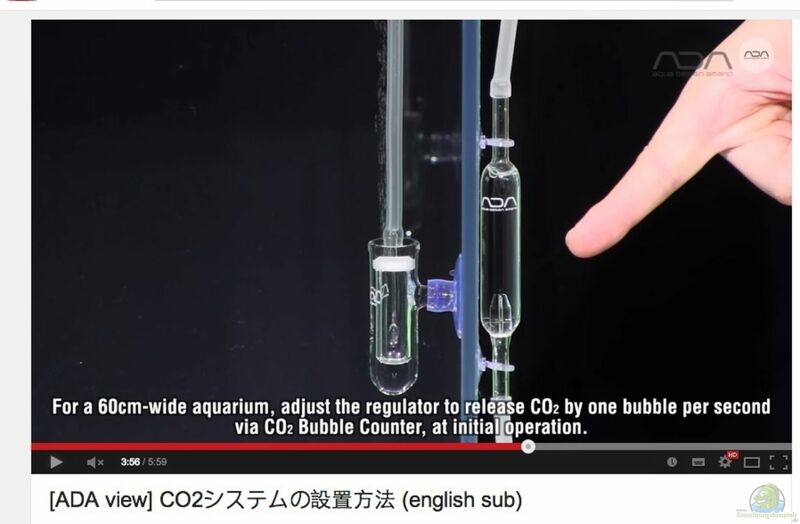 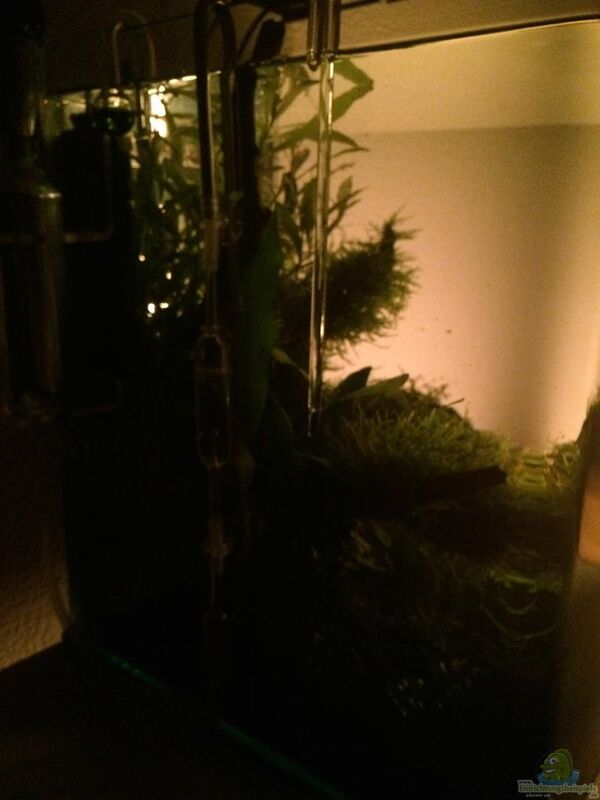 Co2 - almost light green (30 mg / ltr) -> bubble all 5s. 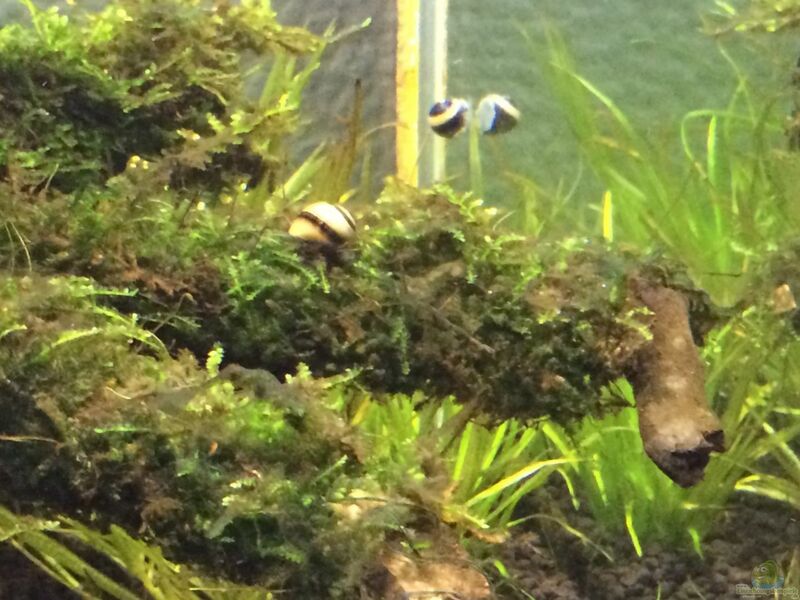 Antler snails eat algae from everything what is in the Nano. 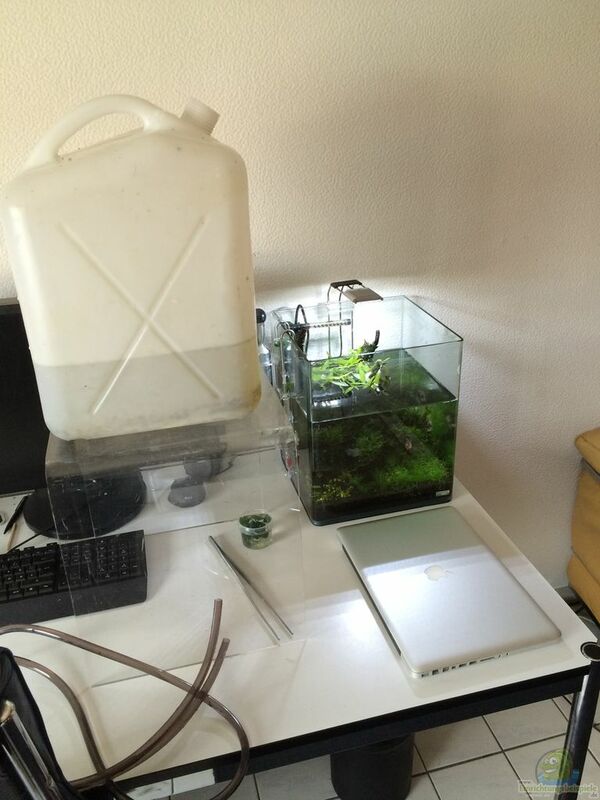 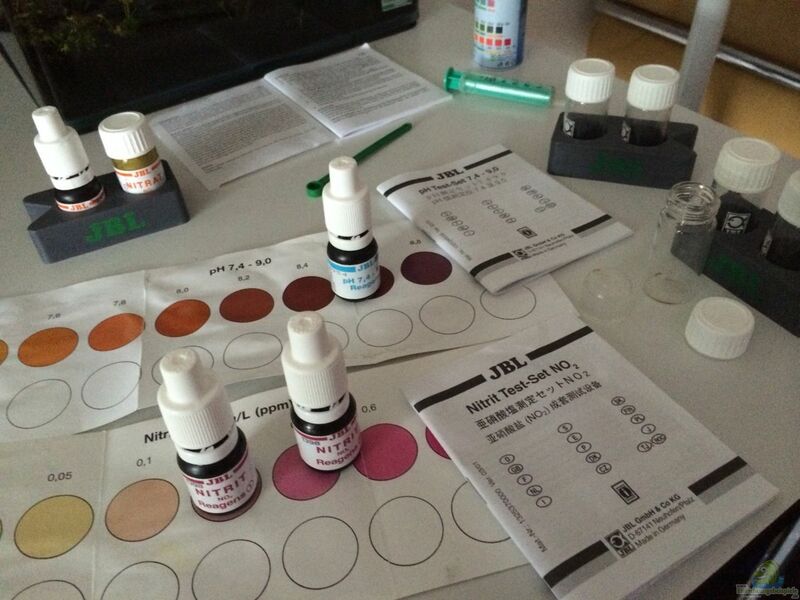 EasyCarbo, helps against algae and was instrumental in the whole case finally running smoothly. 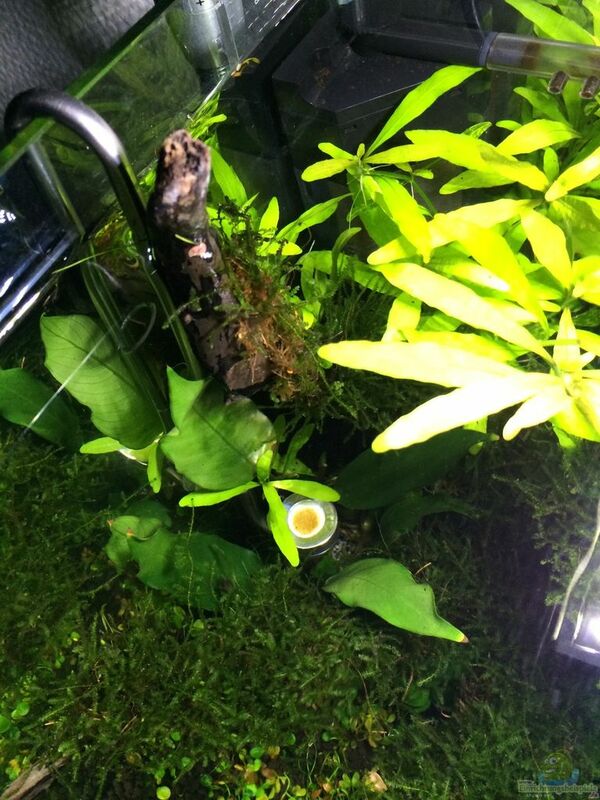 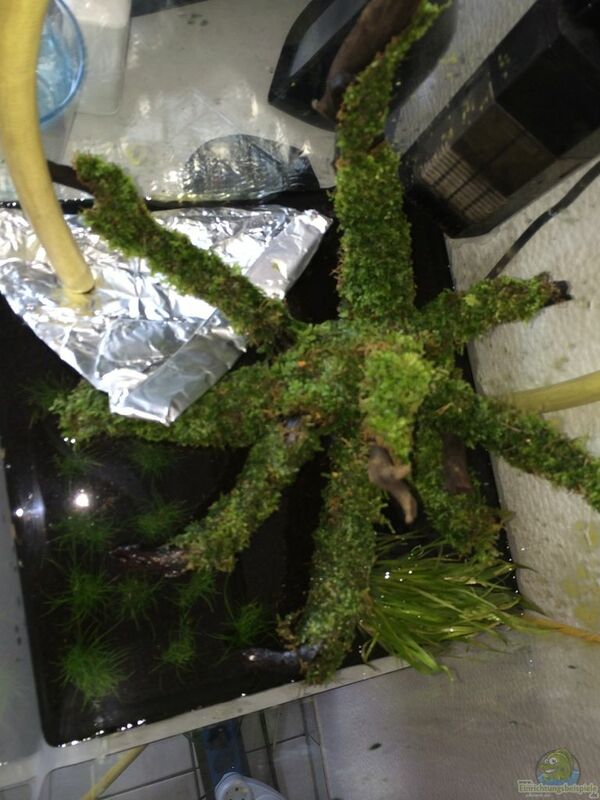 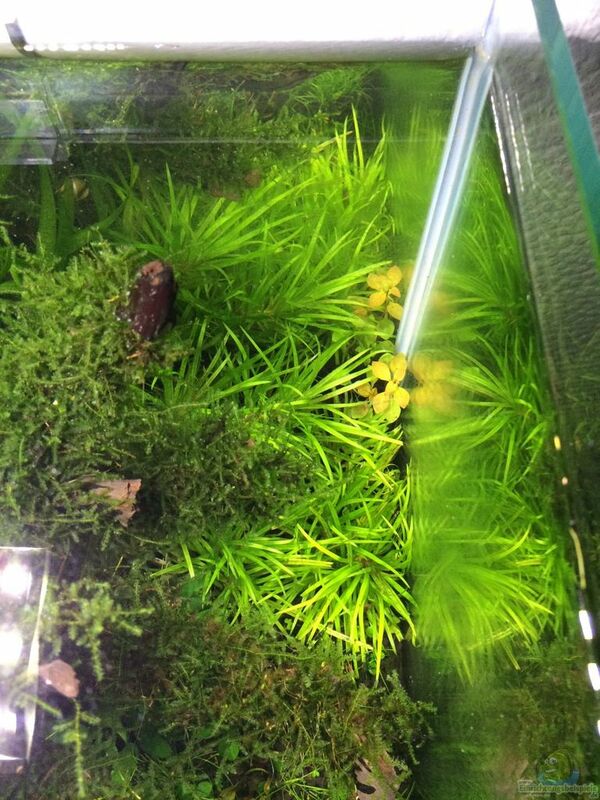 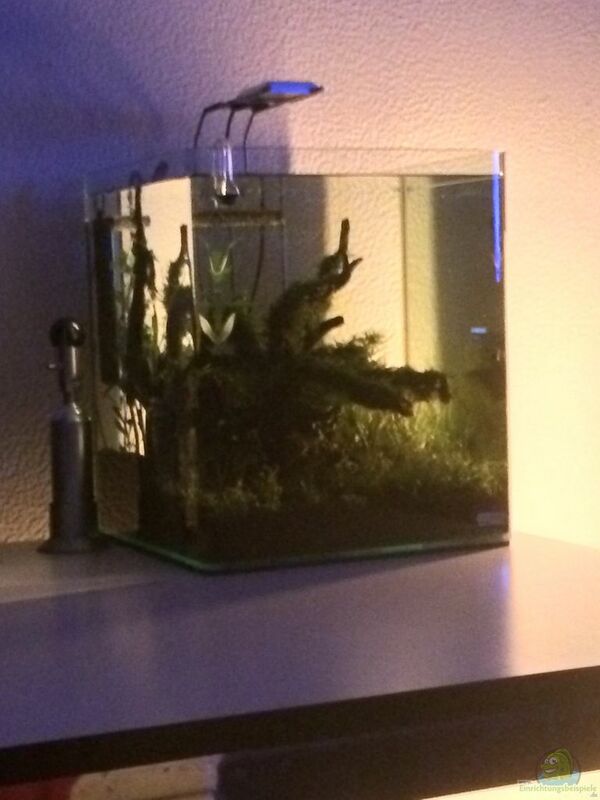 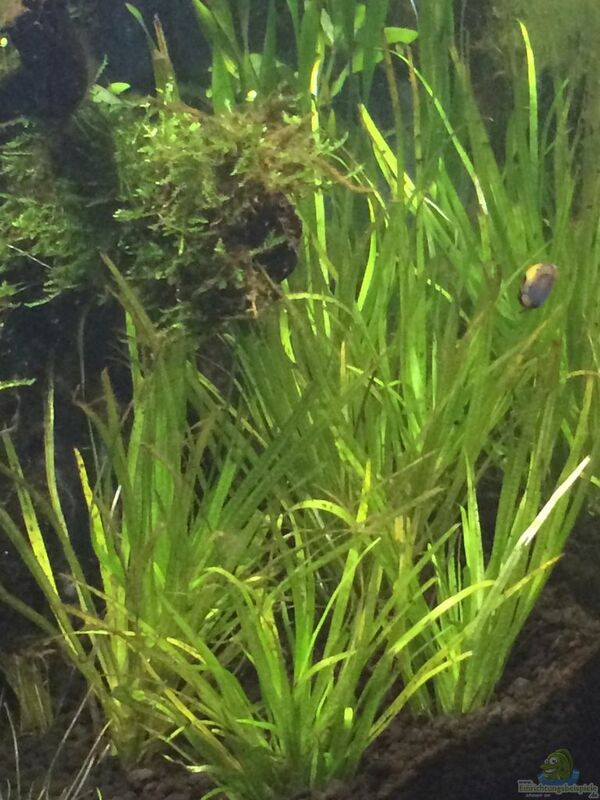 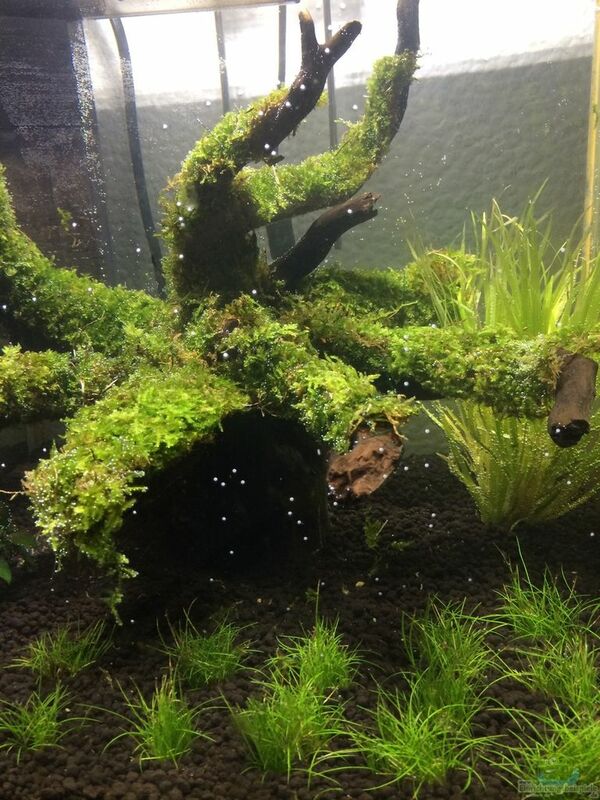 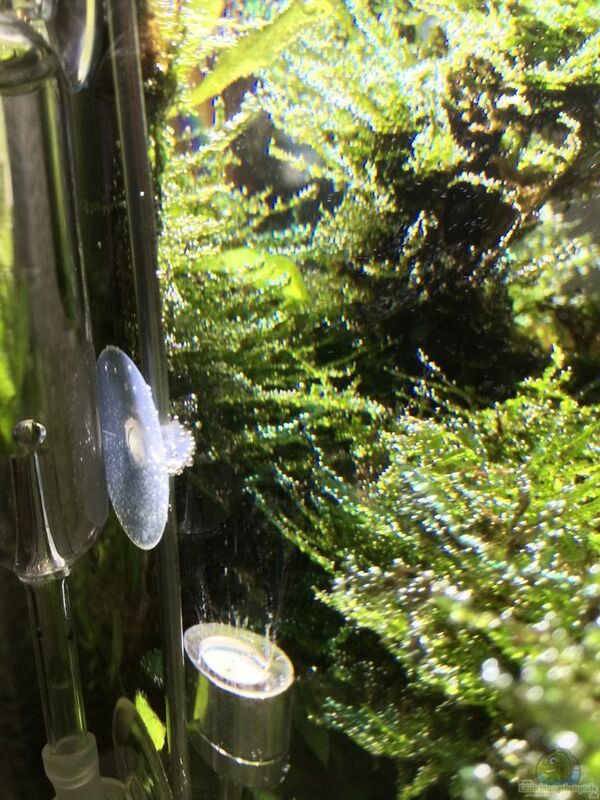 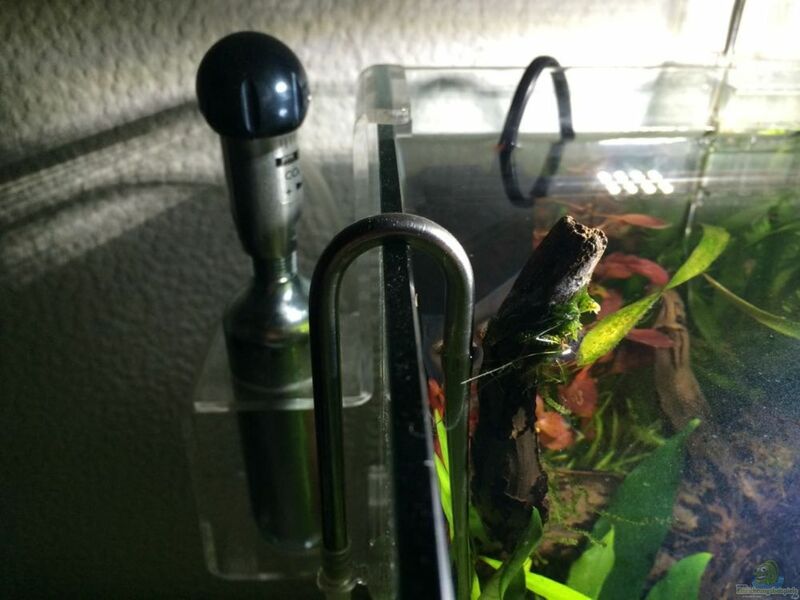 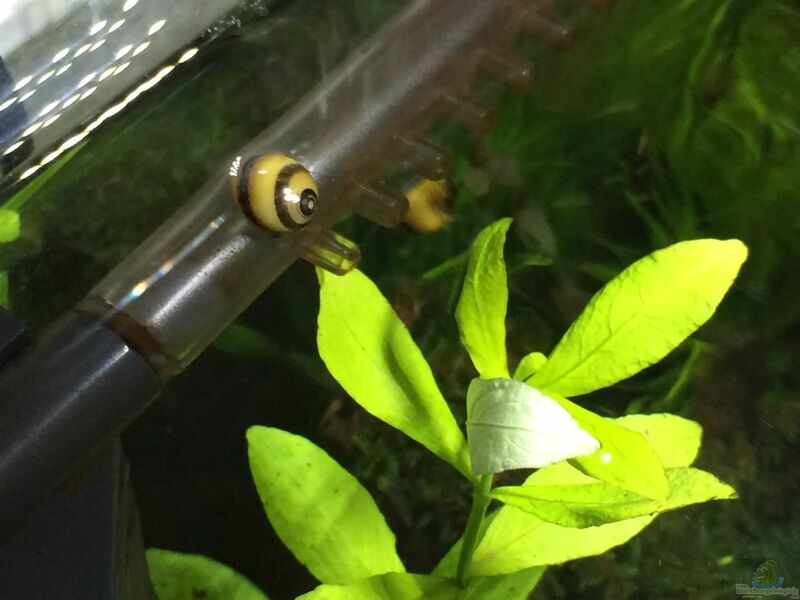 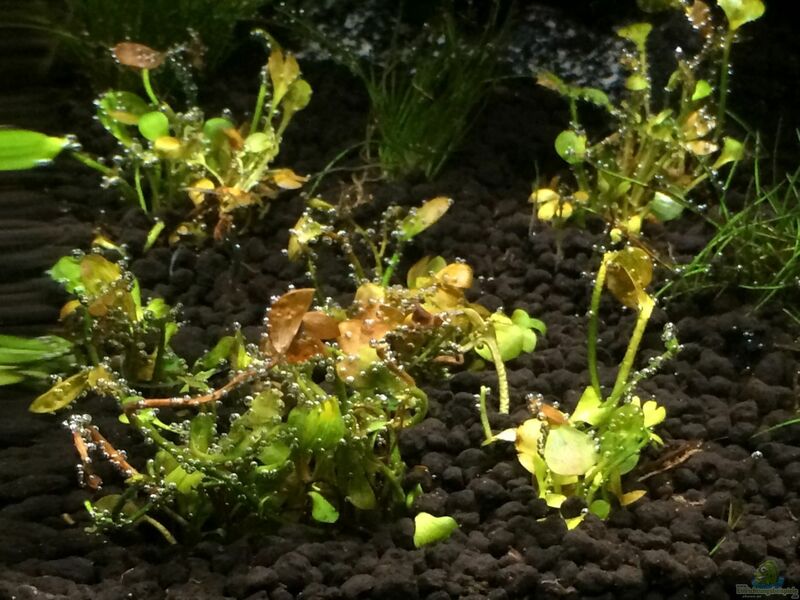 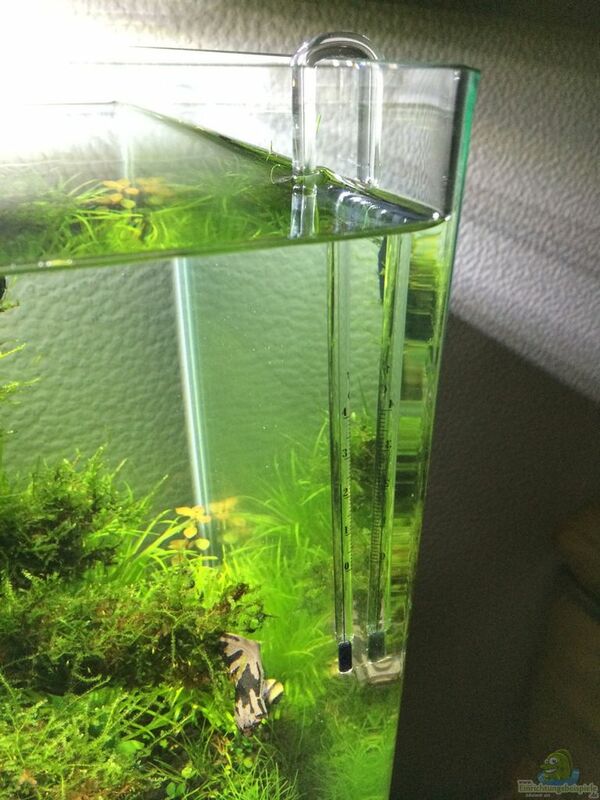 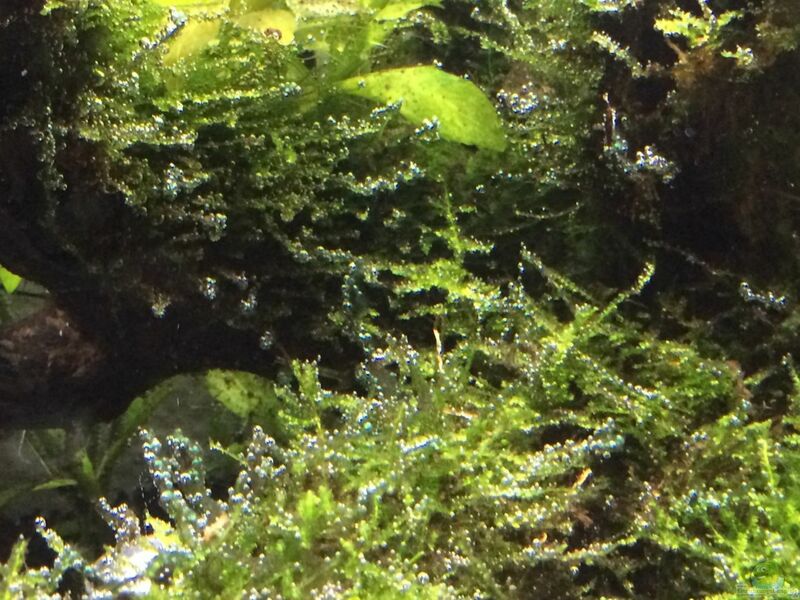 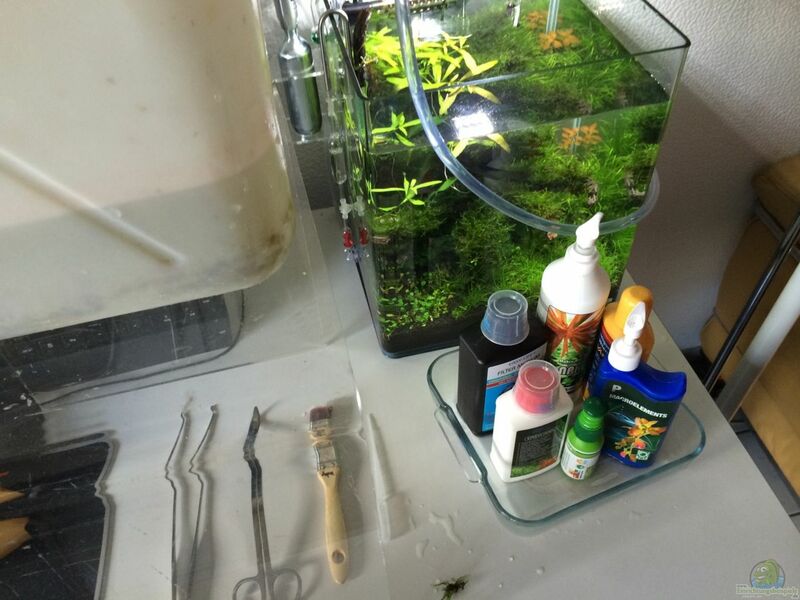 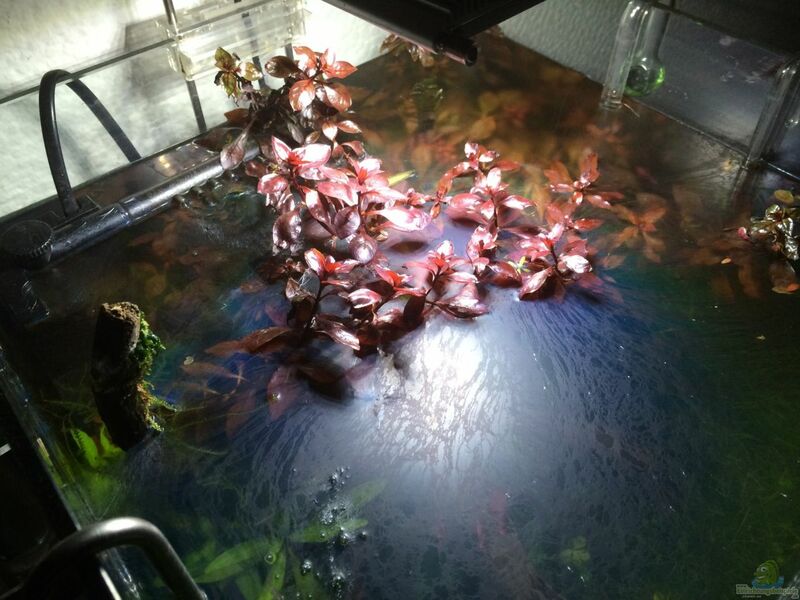 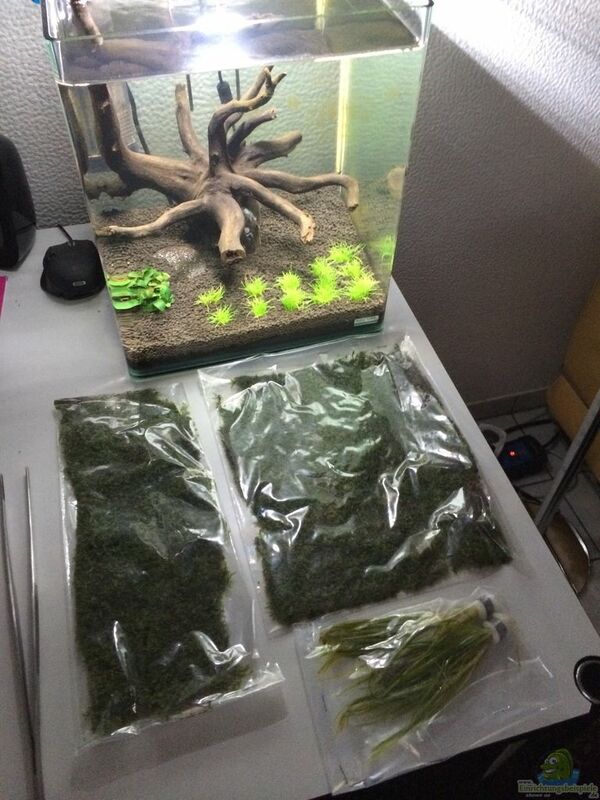 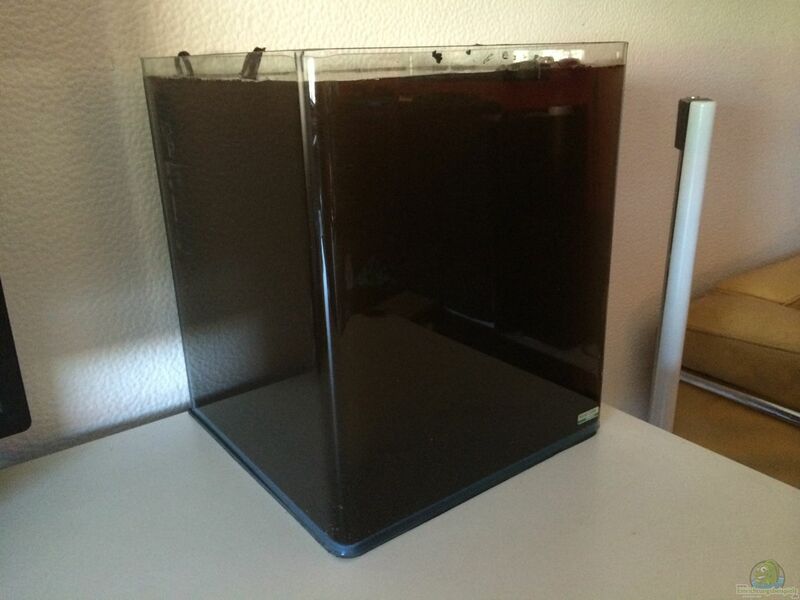 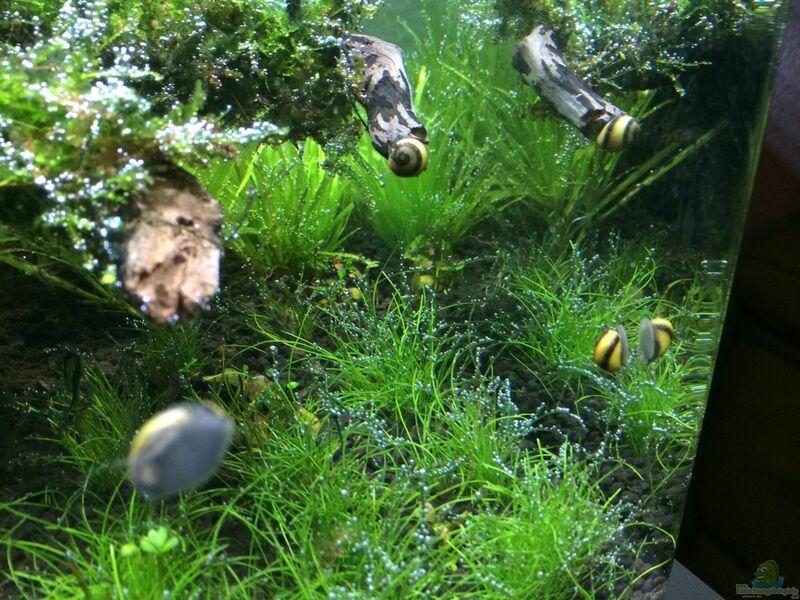 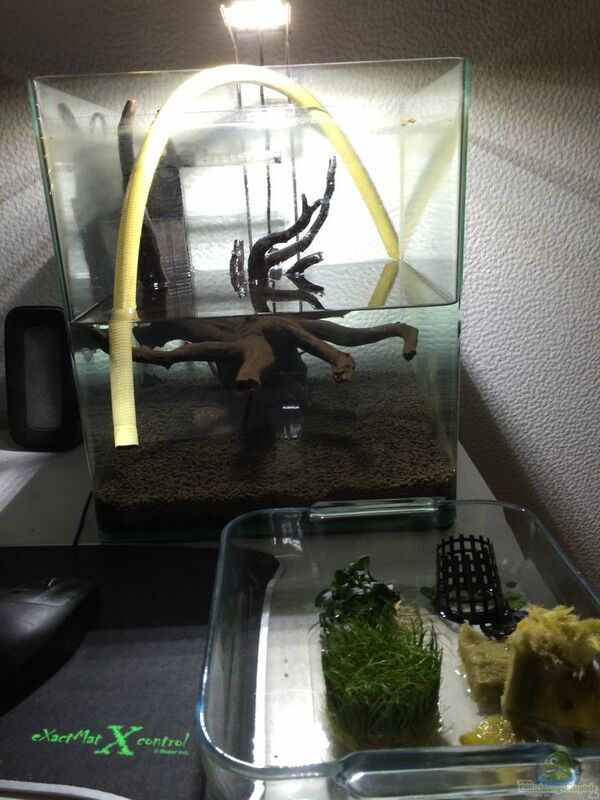 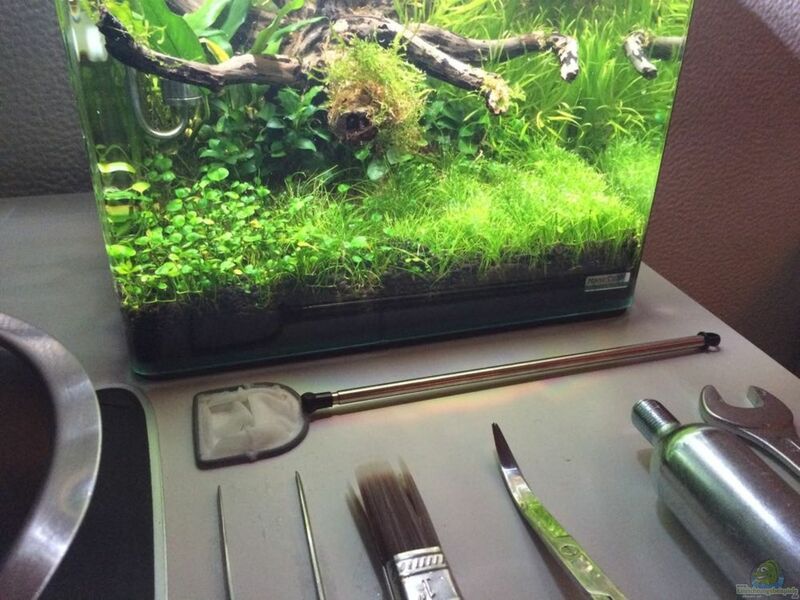 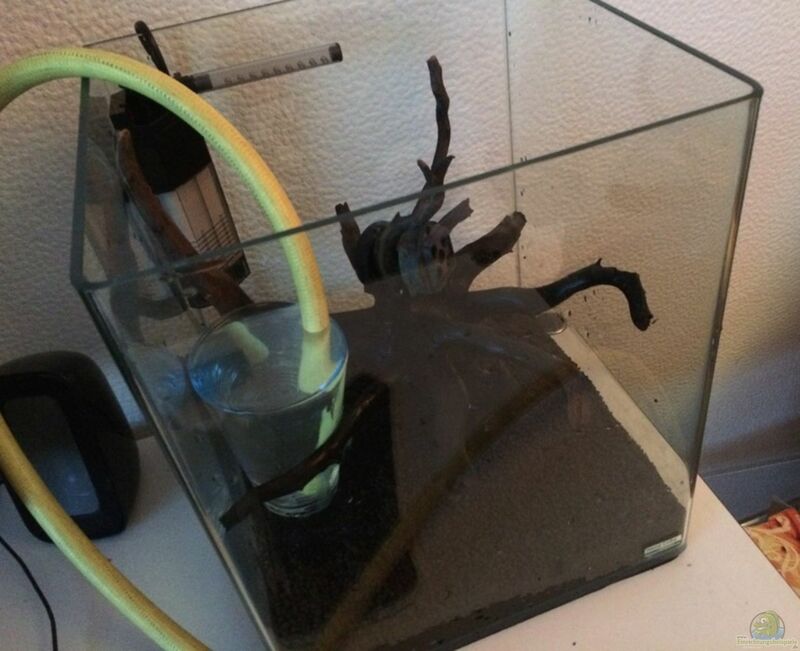 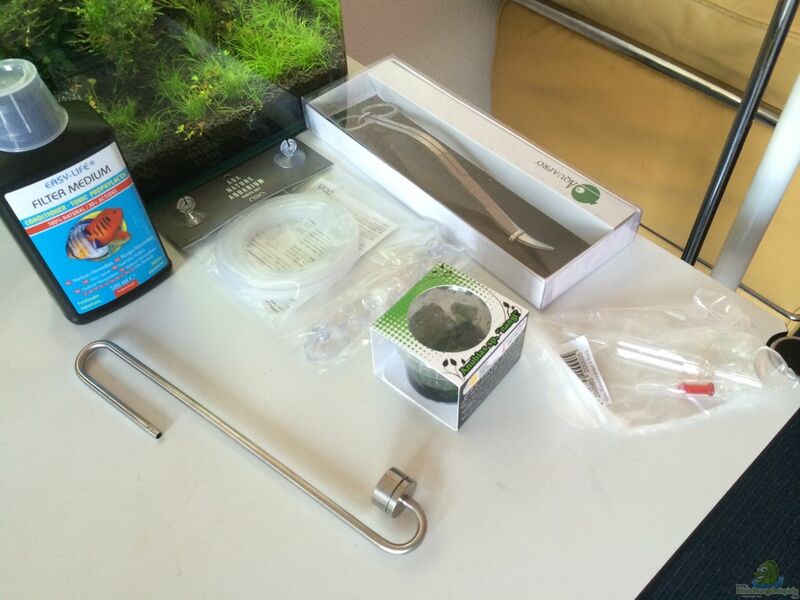 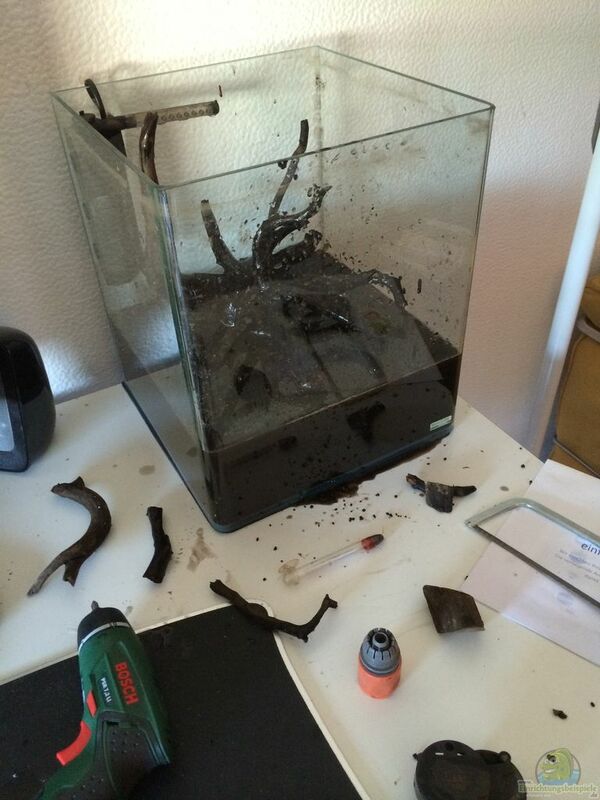 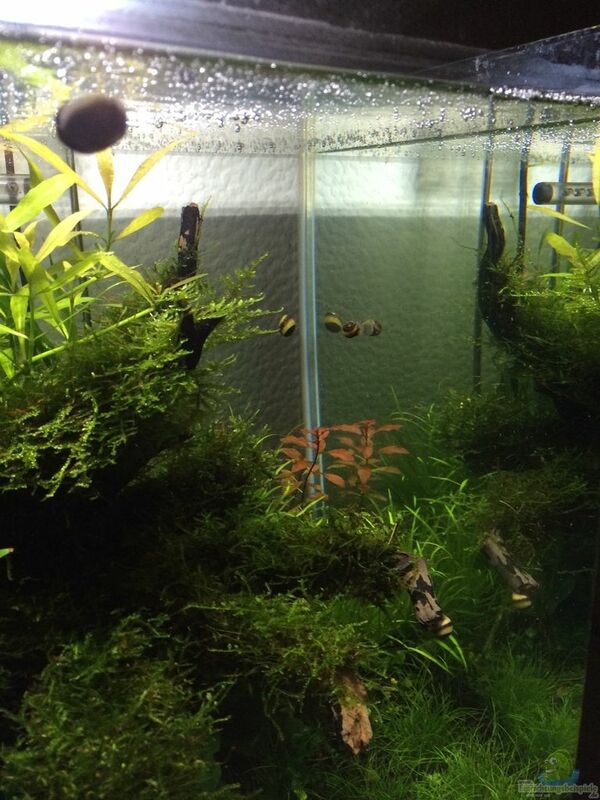 Easy Life filter media "cleans" the water makes it clear and snails are also looking forward. 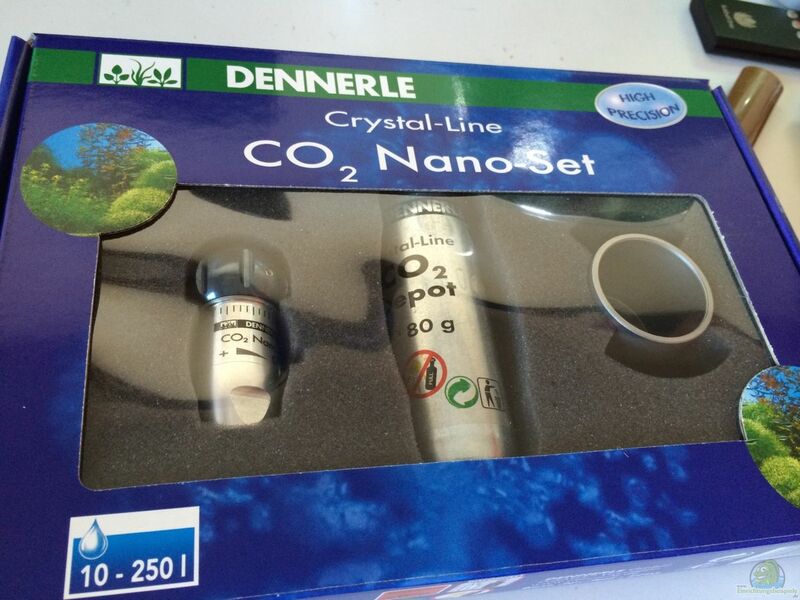 Every 2 days or times only 2-3ml NPK PK. 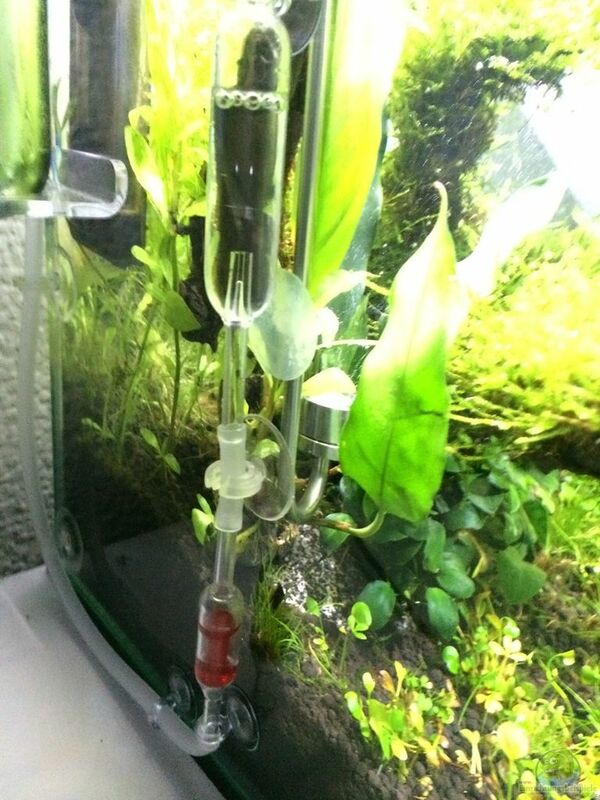 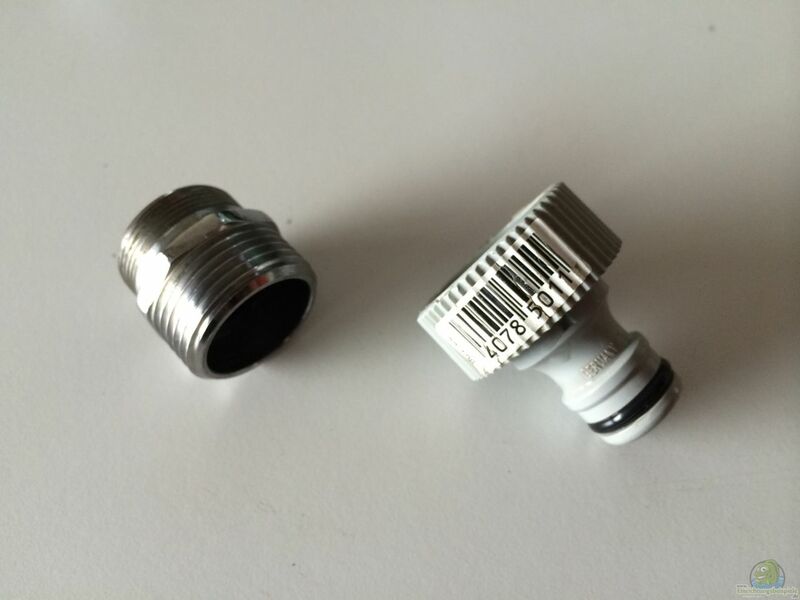 After changing the water at times also more from the line comes "only" 4-5 N. Liquid filter medium + starter bacteria I do purely only after changing the water about 5ml. 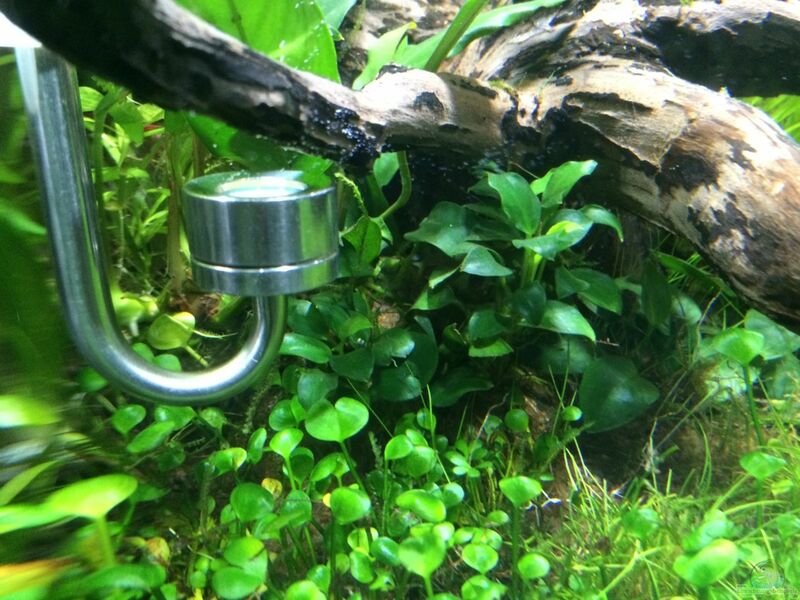 P macro element is like a PK fertilizer. 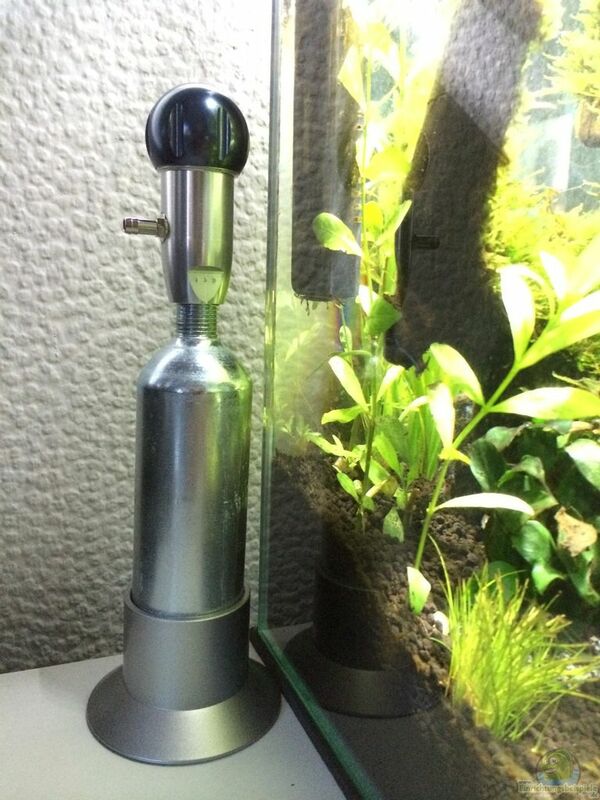 Co2 I have adjusted my stainless steel diffuser is so weak that the bubbles do not arrive at the surface but disappear in the flow. 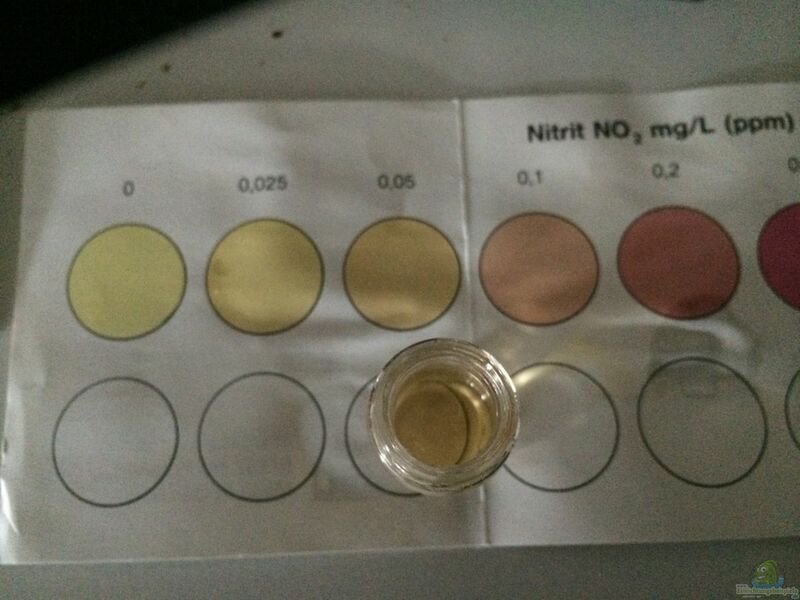 That's about one bubble every 10 seconds, and the Drop Checker (30mg / l) indicates a deep green, where still good room for improvement is.